(ca. 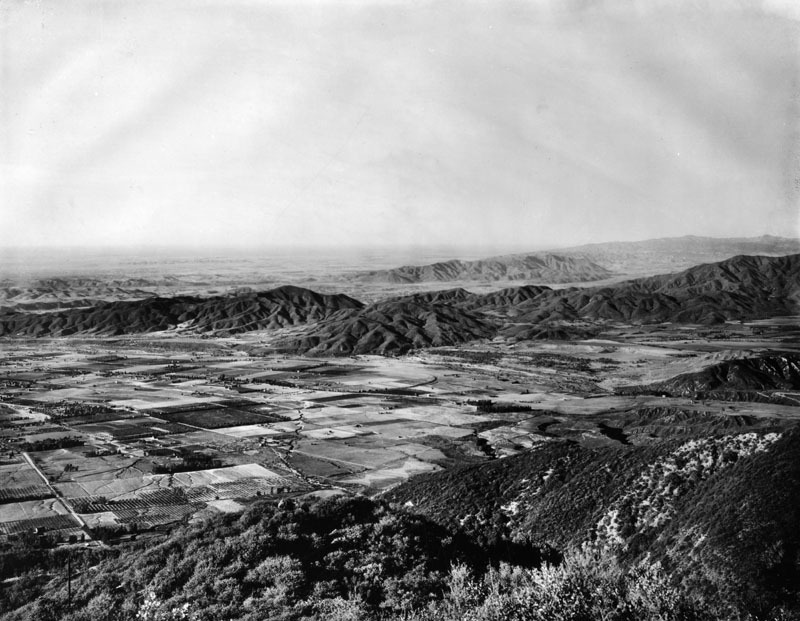 1880)* - Panoramic view of Pasadena as seen from the San Gabriel Mountains on a clear day. (ca. 1880)* - View of Pasadena and it's surrounding areas, from Echo Mountain in the San Gabriel Mts. Prior to the annexation of California in 1848, the last of the Mexican owners was Manuel Garfias who retained title to the property after statehood in 1850. Garfias sold sections of the property to the first Anglo settlers to come into the area: Dr. Benjamin Eaton, the father of Fred Eaton, Dr. S. Griffin, and Benjamin Wilson. (ca. 1870)* - View from Bacon Hill. 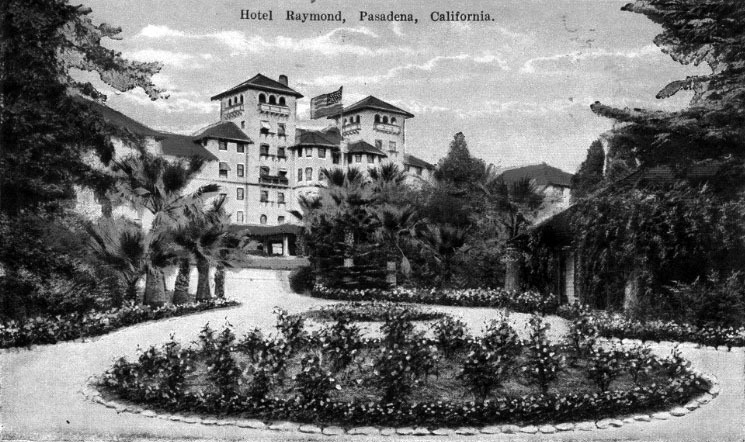 The Raymond Hotel was built atop Bacon Hill which lies between Pasadena and South Pasadena and was renamed Raymond Hill with the opening of the hotel in 1886. (ca. 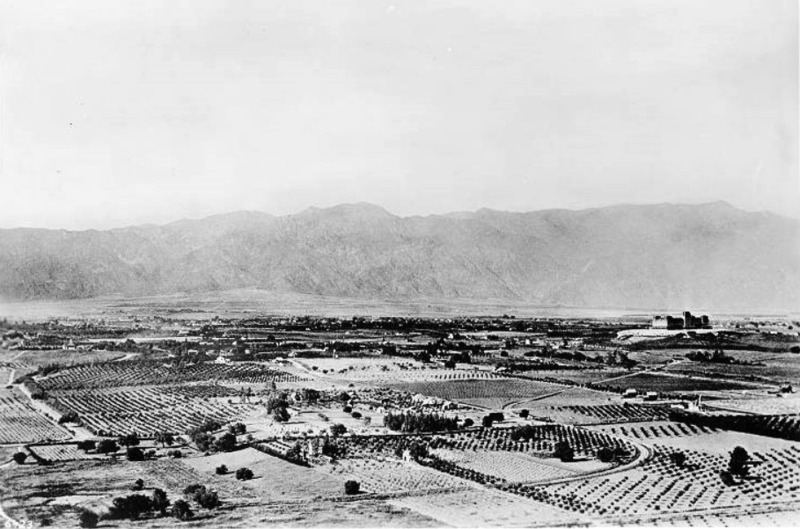 1874)^ - Panoramic view of the orange groves of the first Pasadena settlers, looking northwest. 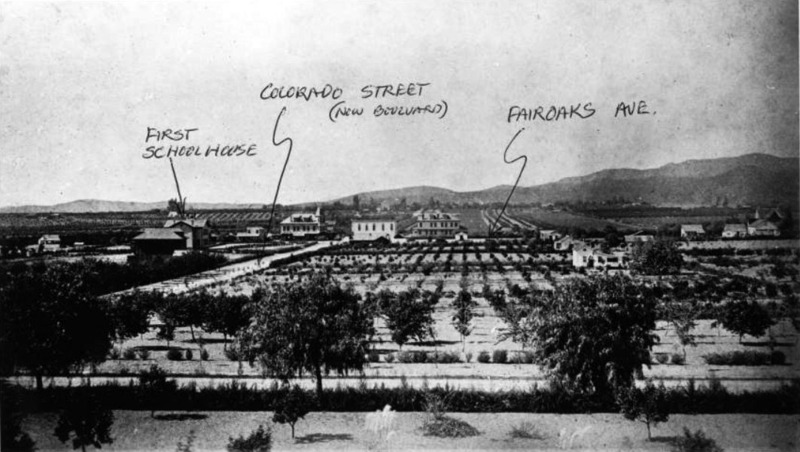 Houses and stores are clustered around Colorado Street (later Boulevard) and Fair Oaks Avenue in the distance at right. Mountains are visible in the background. In 1873, Dr. Daniel M. Berry of Indiana visited the area in search of a place that could offer better climate to his patients, most of whom suffered from respiratory ailments. 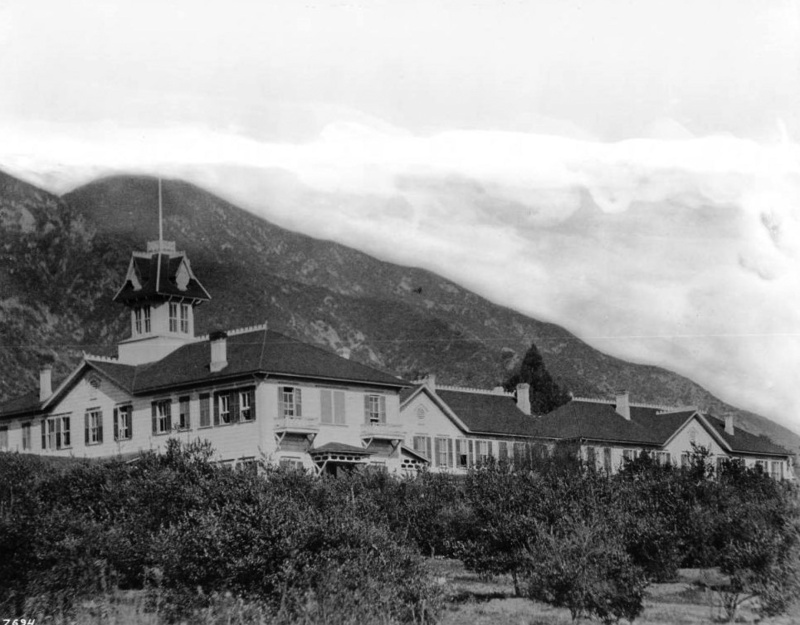 Berry was an asthmatic and claimed that he had his best three nights sleep at Rancho San Pascual. To raise funds to bring the company of people to San Pascual, Berry formed the Southern California Orange and Citrus Growers Association for which he sold stock. The newcomers were able to purchase a large portion of the property along the Arroyo Seco and on January 31, 1874, they incorporated the Indiana Colony. (1874)*^* – View showing the home of A. O. Bristol, located on the SW corner of Orange Grove and Lincoln Avenue. This was the first house completed in Pasadena. In January 1874, the new settlement was divided among the settlers and mapped. Generously sized parcels which were intended for the planting of orange groves were arranged on either side of the north-south axis of the colony, a street soon known as Orange Grove Boulevard. (n.d.)*^* - Early view of the Bristol House, 1st house built in Pasadena. This photo was clearly taken after its use as a house had passed. 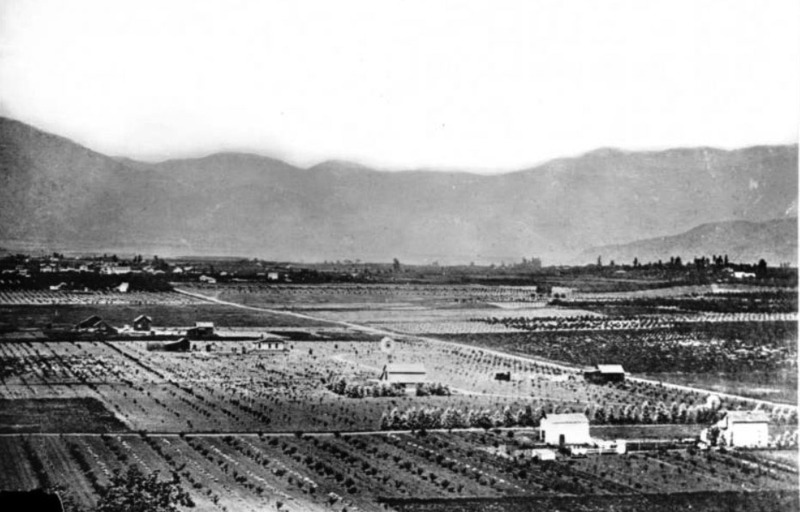 (1876)** - View of Pasadena from south Orange Grove Avenue with the San Gabriel Mountains in the distance. Orange groves are seen throughout. 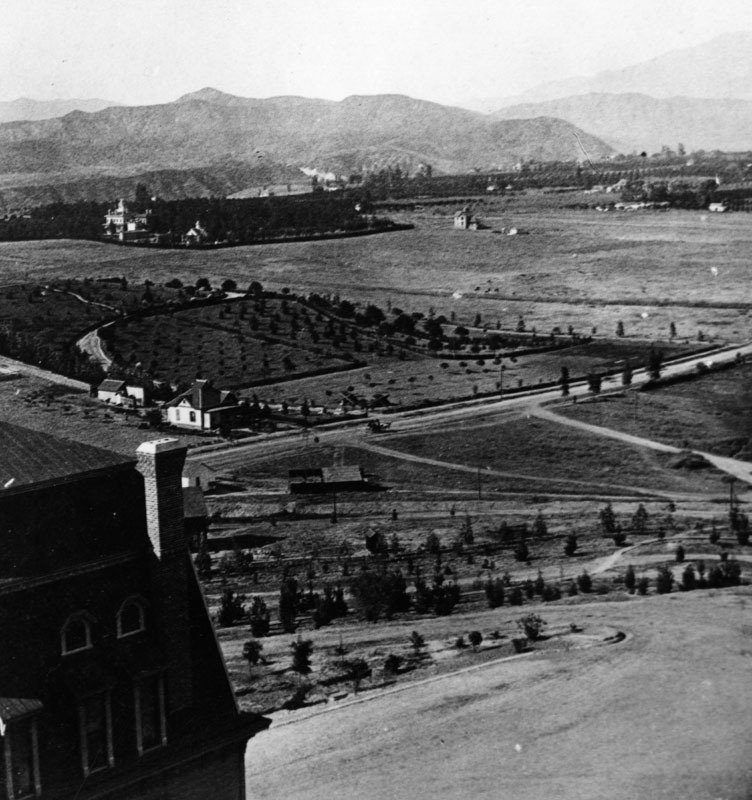 Seen in the photograph are a number of Pasadena landmarks, as follows: In the far left of the frame is a two story, white house - the H. J. Holmes House. To the right of the Holmes House is another white building - this is the W.T. Clapp House. To the right of the Clapp House is the First Methodist Church. To the right of the church, under a large oak tree, is the first school house of Pasadena. To the right of the school house is a large, ornately designed house - the Gilmore House. The right-most building in the photograph - a large white structure - is the First Presbyterian Church. 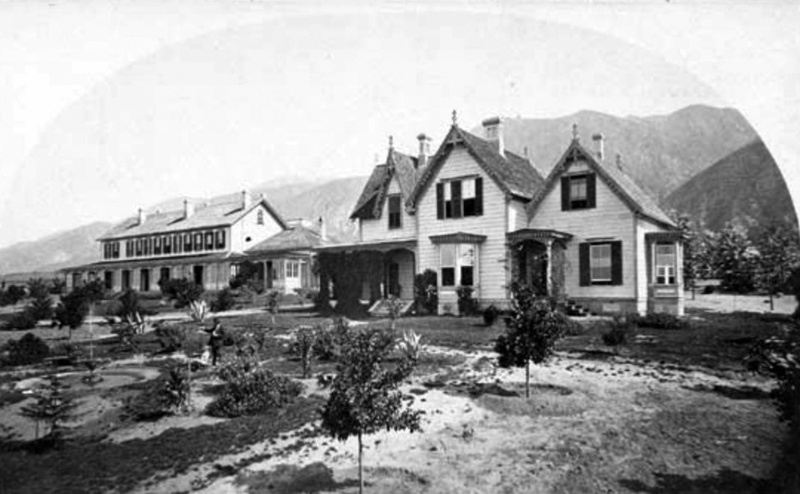 In the foreground of the photograph is Henry G. Bennett's House - the 4th house in Pasadena. Running behind the Bennett house is a road - now Bellefontaine Street, and from the right of the photograph running north is what is now Orange Grove Blvd. (ca. 1874)** – View of the 1st School in Pasadena, Orange Grove St. on Clapp property. Jennie Clapp was the first teacher. (ca. 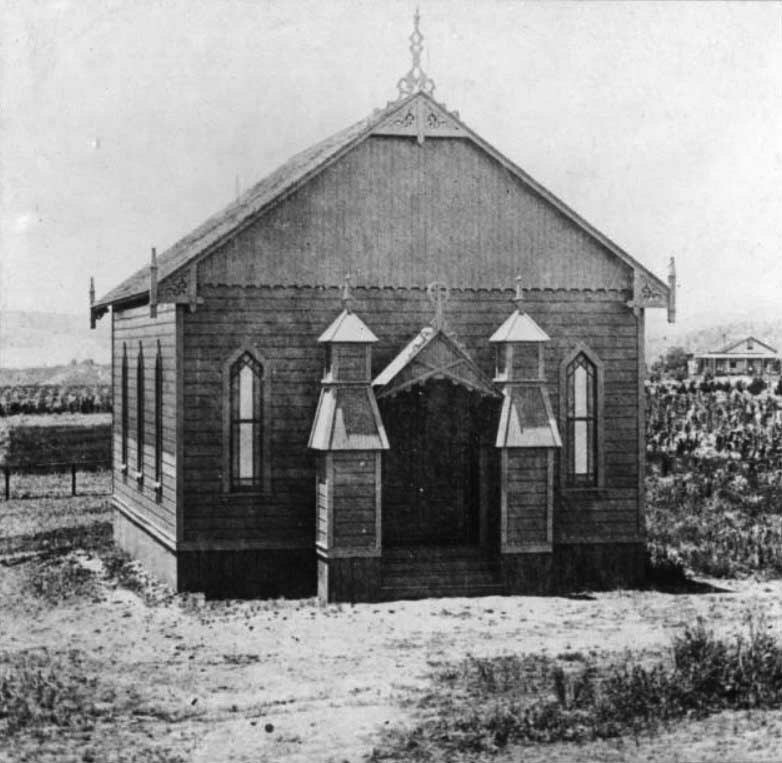 1875)* - Exterior view of the First Church in Pasadena. First Presbyterian - built on California Street near Orange Grove. (ca. 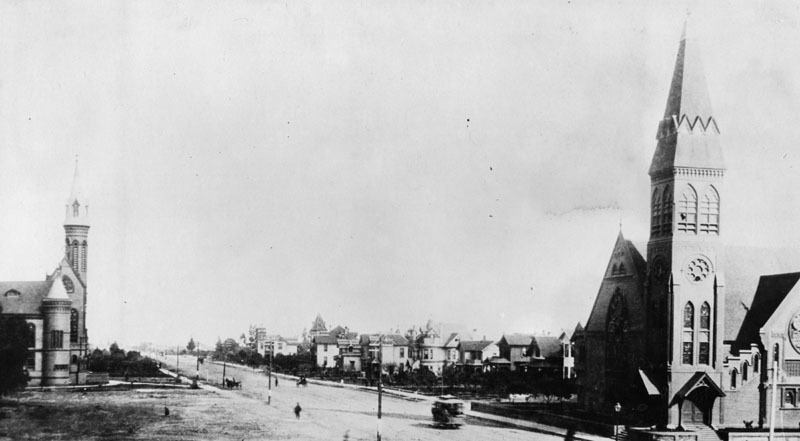 1888)^*# - View looking northeast at the First Church in Pasadena (on he right). The schoolhouse is seen on the left. (ca. 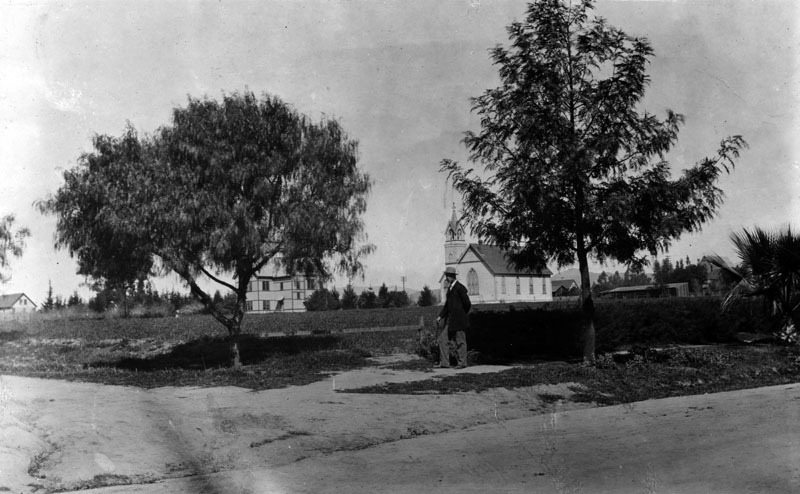 1893)* - A man identified as Nels Eckline poses near a fence, behind which are the first church (background right) and the first school (background left) in South Pasadena as they appeared circa 1893. 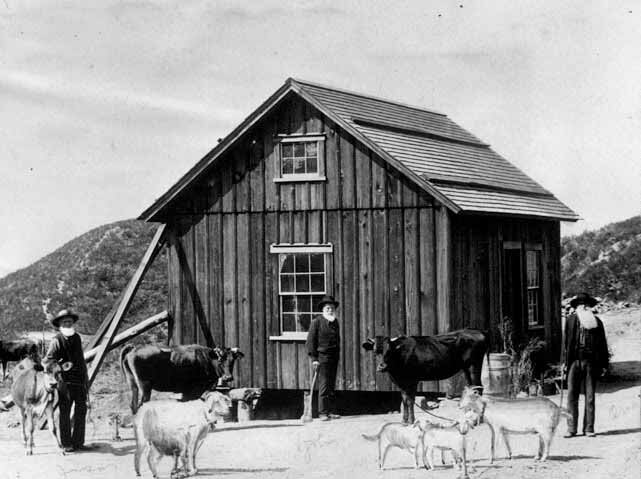 (1876)* - Exterior view of Col. Banbury's ranch in Pasadena. This is the second house built on the colony. Colonel J. Banbury built the second home in Pasadena on South Orange Grove Avenue. 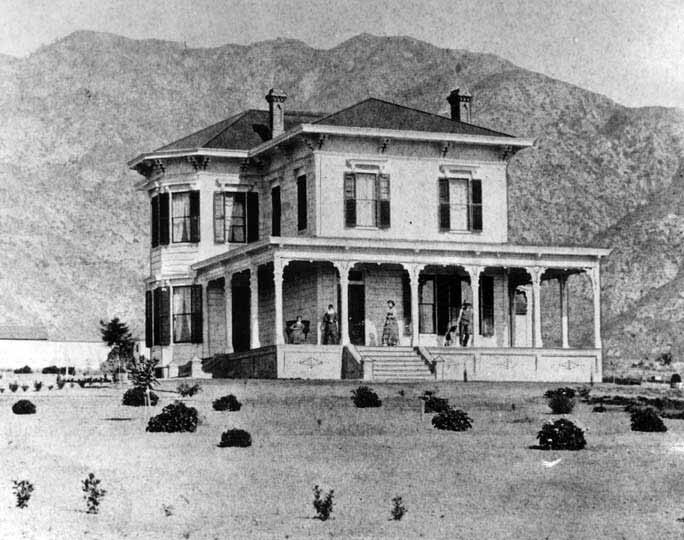 It was a one and a half story plastered, eastern style house where the Tournament of Roses' Wrigley Mansion, one of the first houses in the Colony, now stands. For a while he was the "zanjero," or manager of the water supply. 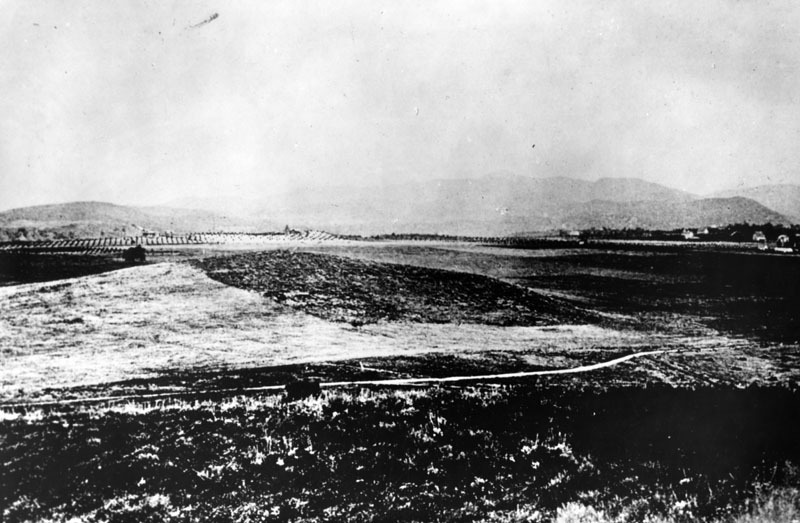 (1876)^ - Panoramic view of early Pasadena looking northeast from the Arroyo Seco. Young orchards full of rows of underdeveloped trees dot the hilly landscape. Bushed and other scrub vegetation grow as well. No houses are immediately evident. The San Gabriel Mountains stand in the background. (1877)** – View showing the First Methodist Church located at Orange Grove and Palmetto. This was the second church built in Pasadena. On January 7, 1877, a one-room Methodist Church was dedicated on Orange Grove and Palmetto by a congregation of twenty-four members. The facility had two hundred seats, a pump organ, a church bell and kerosene lamps. The pastor preached every other Sunday, sharing a circuit ministry with San Gabriel and Alhambra until 1882. 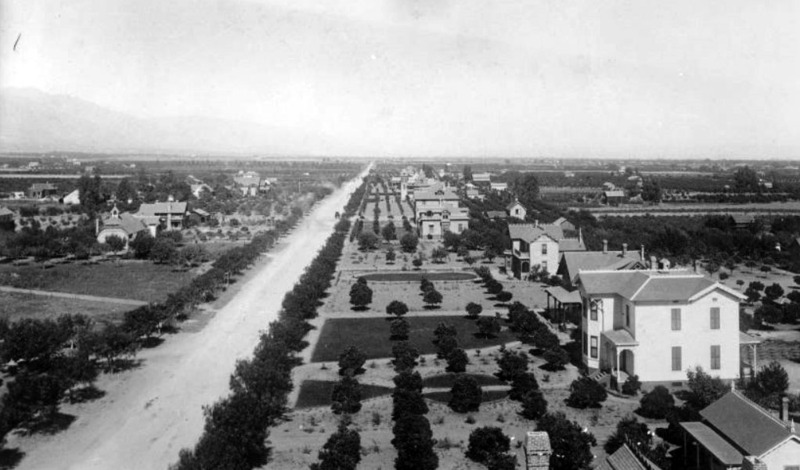 Pasadena began to develop on Colorado instead of Orange Grove. 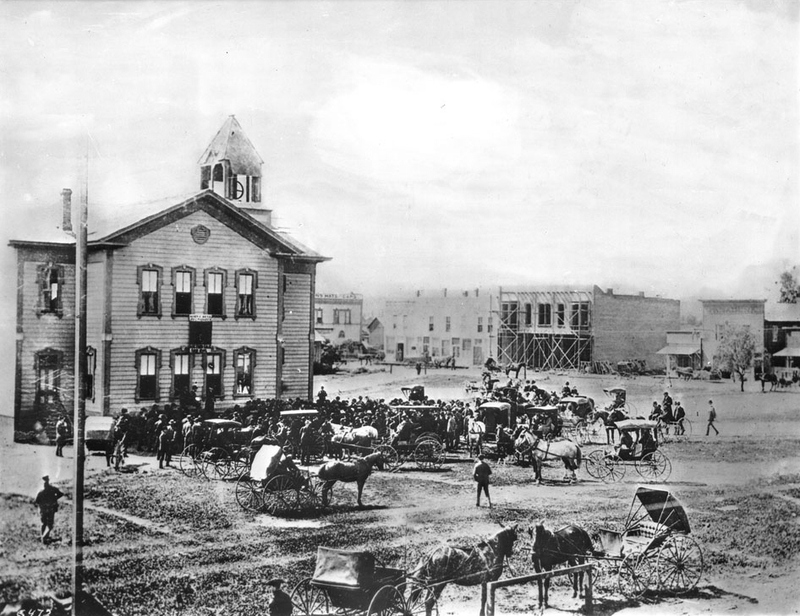 Better roads and street lights were needed for evening services, so the church was put on rollers and moved near a livery stable on Colorado and De Lacey. (1878)** – View showing the home of the Giddings Family, located at 1318 E. Colorado Street. 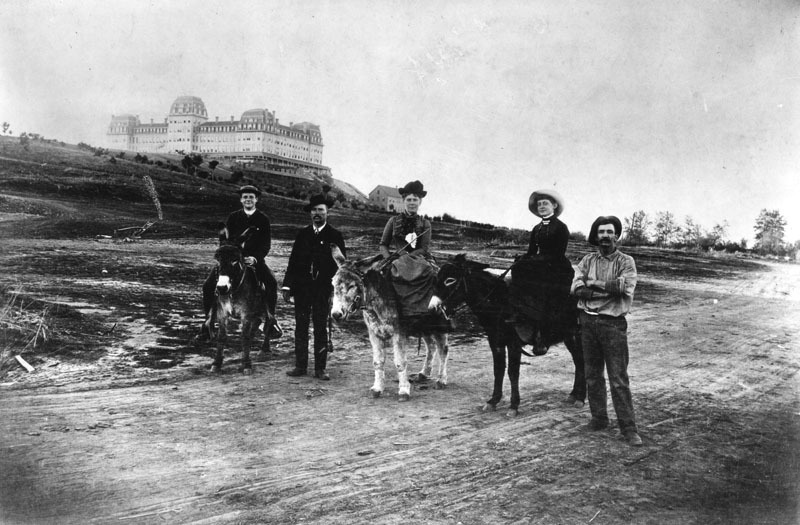 From Left to Right, the people shown in the photograph are: Jennie H. Giddings, Lawson Giddings, Joshua Reed Giddings, Mac the dog, Lena S. Hart, Levi Giddings, Joe Giddings (in buggy), Mrs. Lucinda Hollingsworth, Mr. Lawson Hollingsworth. "Grandmother Hollingsworth is standing in front of her oak tree." Joshua Reed Giddings of Iowa moved to Pasadena in 1874 as one of the original "old settlers." A street in Pasadena, Ashtabula Street, was named after his uncle (also named Joshua Reed Giddings), who was a famous abolitionist and U.S. House of Representatives member from 1838 to 1859 in Ohio (he lived in Ashtabula County, Ohio). Mr. Giddings was one of the founding members of the Pasadena Cemetery Association, along with a number of his family members. 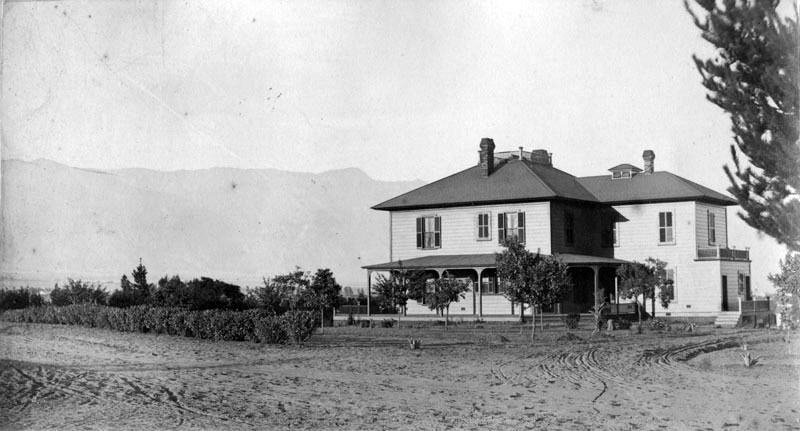 (1870s)** – View showing the Lake Vineyard House; Pasadena's first hotel at Marengo Avenue near Pleasant Street; John Griswold, proprietor. 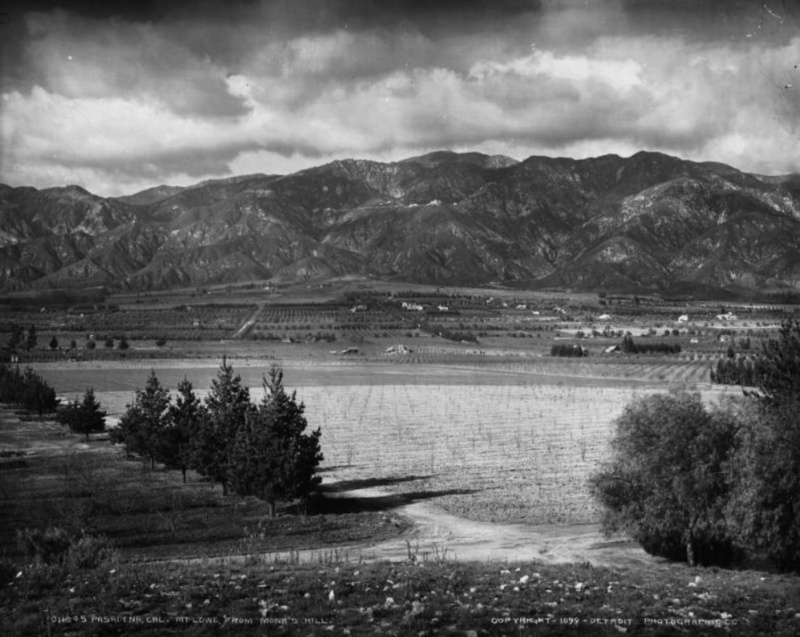 (1883)^^# - View of Pasadena looking north from Raymond Hill. (ca. 1880)* - Scenic view of Pasadena, north on Oak from Colorado. View shows cultivated fields, orchards and homes in the area. (1880)#* - Panoramic view of the 1880 Pasadena skyline, looking west. 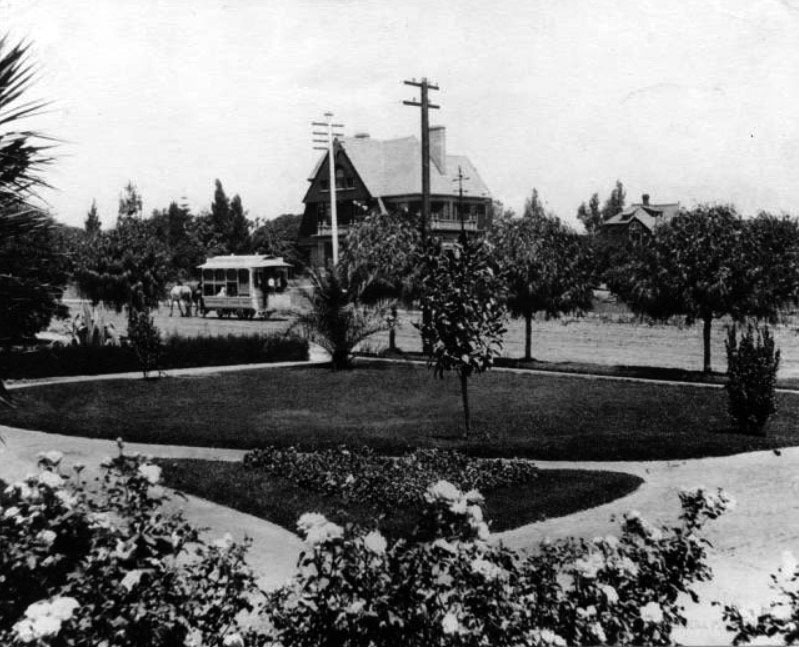 The photo is annotated with three locations: (left to right) First schoolhouse, Colorado Street (now Boulevard), and Fair Oaks Ave.
Colorado Street (now Boulevard) became Pasadena's first street to see commercial development. (ca. 1880s)* - Group photo of the students attending the "First" school in Pasadena. 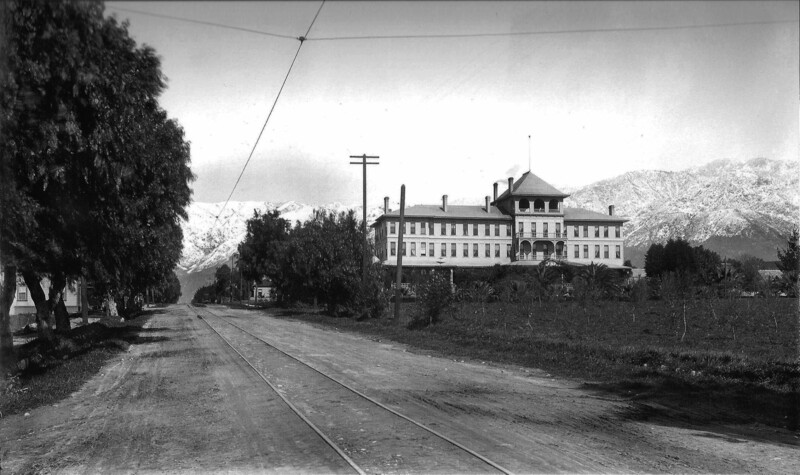 The school building was the largest building in the area and visible from almost any part of Pasadena. (ca. 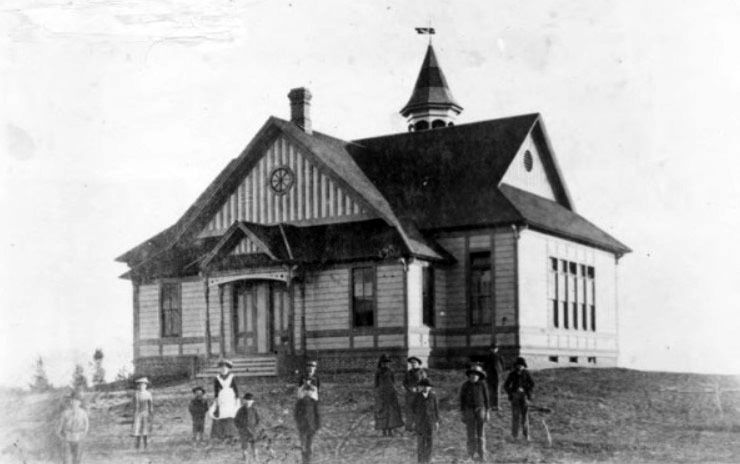 1880s)* - Closer view showing the first school in Pasadena and its students. The school was a handsome building for its day with separate classrooms for the different grades and of course a bell tower and bell. 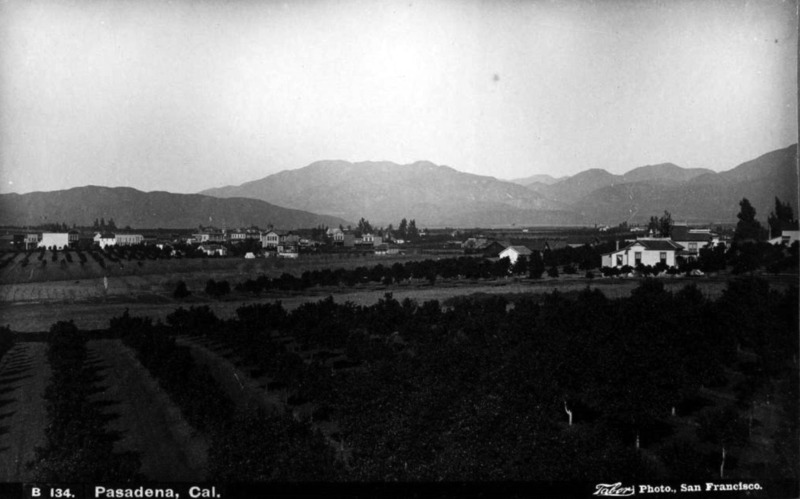 (1884)* - View of Colorado and Fair Oaks in Pasadena, looking northwest. Building on the left is the Ward Block building. City Drug Store is on the right. (ca. 1883)* - Colorado and Fair Oaks looking west. Ward Block is on the left, which includes the Pasadena Bank and the Grand Hotel. Several horse-drawn carriages are parked along the sides of the building. There is a Meat Market and a Livery Stable past Ward Block. Cultivated fields can be seen in the background. (1884)*^^ - Horse- drawn carriage traffic around the Ward Block, at the dusty intersection of Colorado and Fair Oaks in Pasadena. 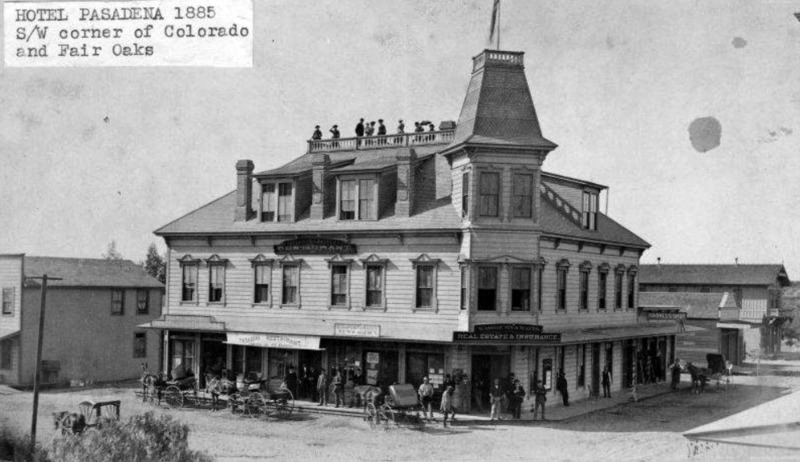 (1885)** - View of the Hotel Pasadena located on the southwest corner of Colorado and Fair Oaks showing over a dozen people in front of the building with four horse-drawn wagons parked at the curb. There is also a group of people standing on the roof deck. (ca. 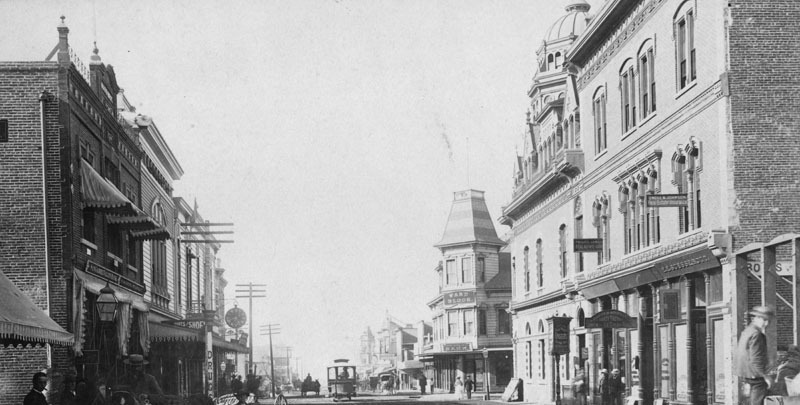 1880s)*^* – Early winter view of Colorado Street, now Colorado Boulevard, looking north. The San Gabriel Mountain range with snow and clouds is in the background. 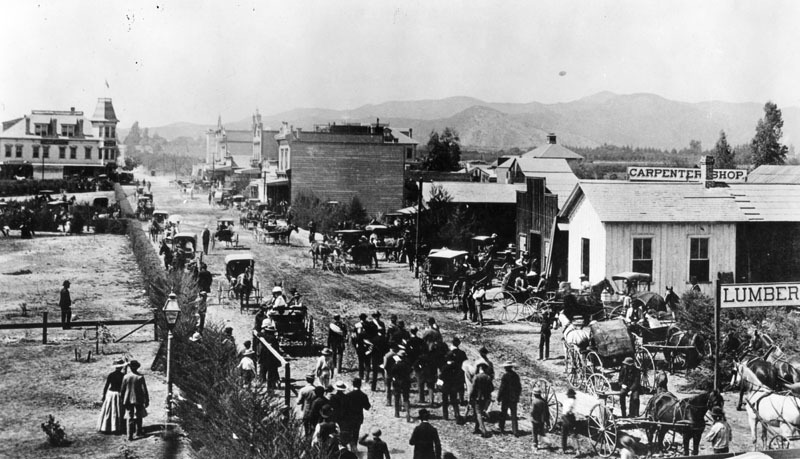 (1884)* - View is looking east at Colorado Street in Pasadena, in 1884. Orchard fields are on both sides of the dirt road. Buildings and homes can be seen past the orchard fields. (ca. 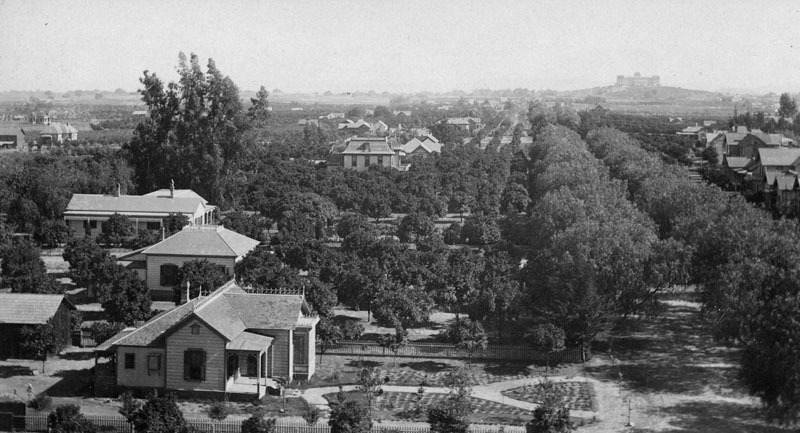 1880s)#* - Landscape view of Pasadena showing groves of trees and other crops in the foreground, and buildings and houses in the town. 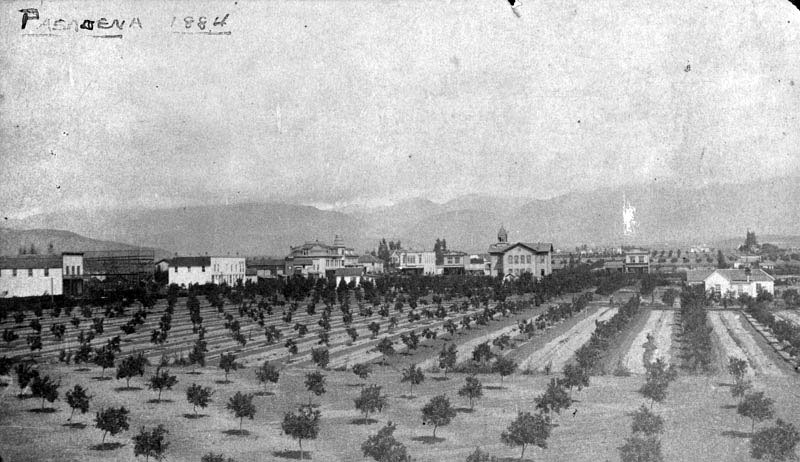 (1884)* - View of Pasadena looking north with orchards in the foreground. 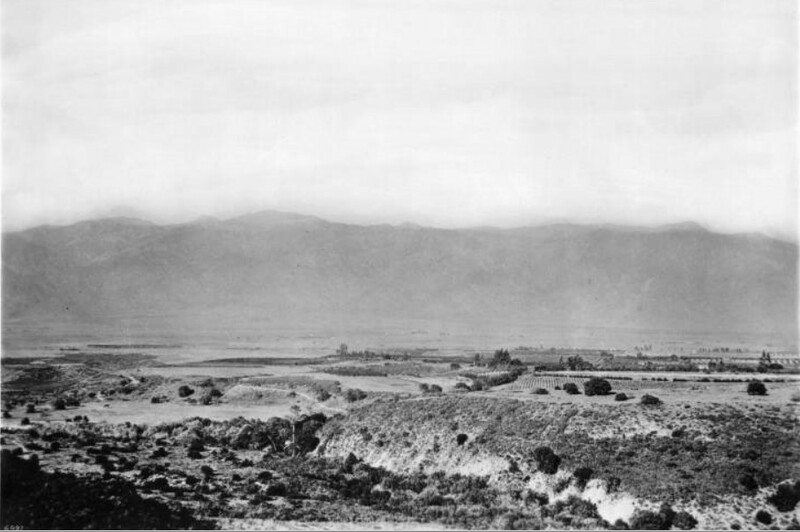 (1885)** - Panoramic view looking northeast from Valley and Pasadena Avenue. (1884)** - View of a young woman and school children in front of building on a rise of land in early Pasadena. 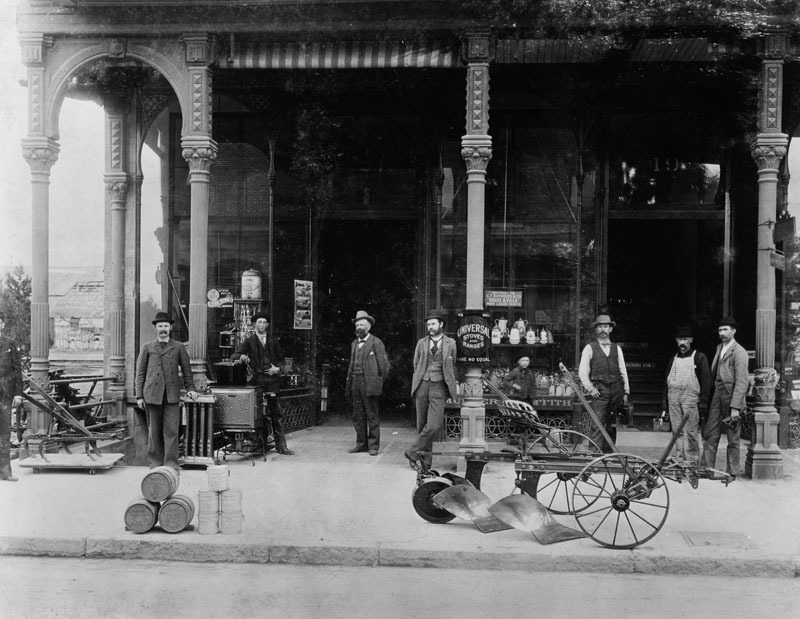 (1885)* - Exterior view of Munger & Griffith Hardware store located on 19 East Colorado, in Pasadena. 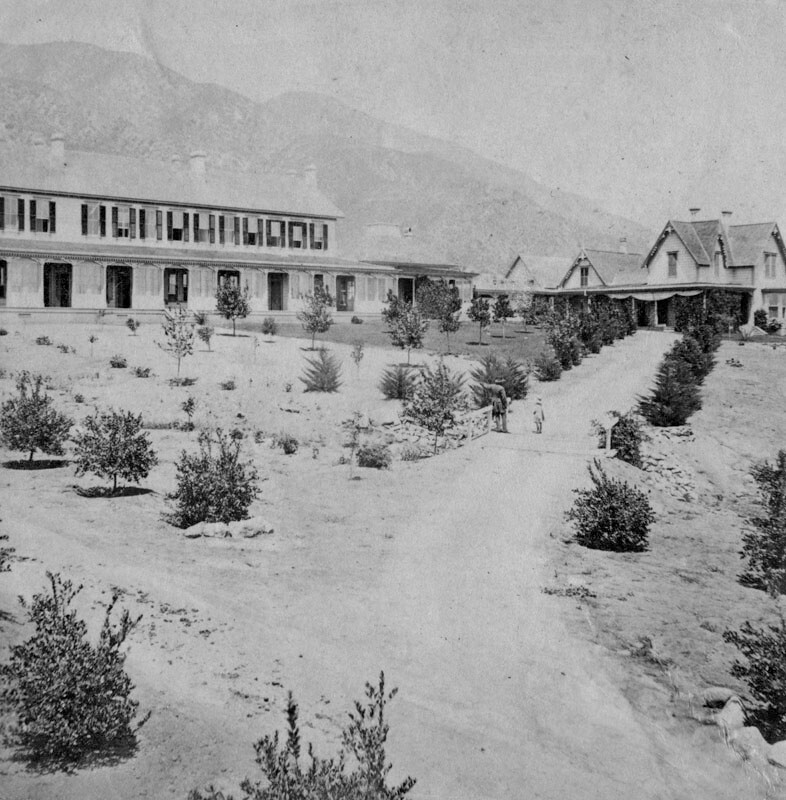 (1885)* - View of the Los Angeles House Hotel located on the northwest corner of Colorado and Fair Oaks. 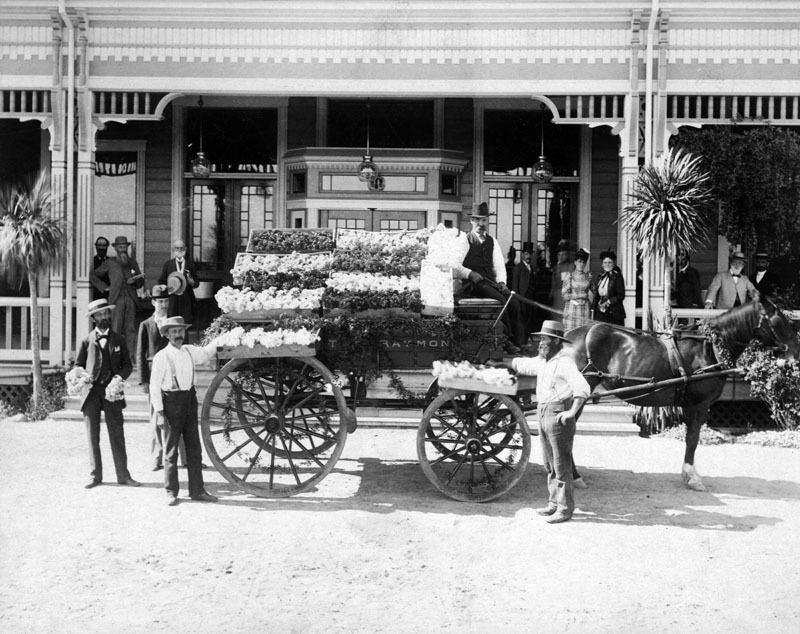 A horse-drawn carriage is stopped at the hotel, and several guests are standing on the porch and balcony. 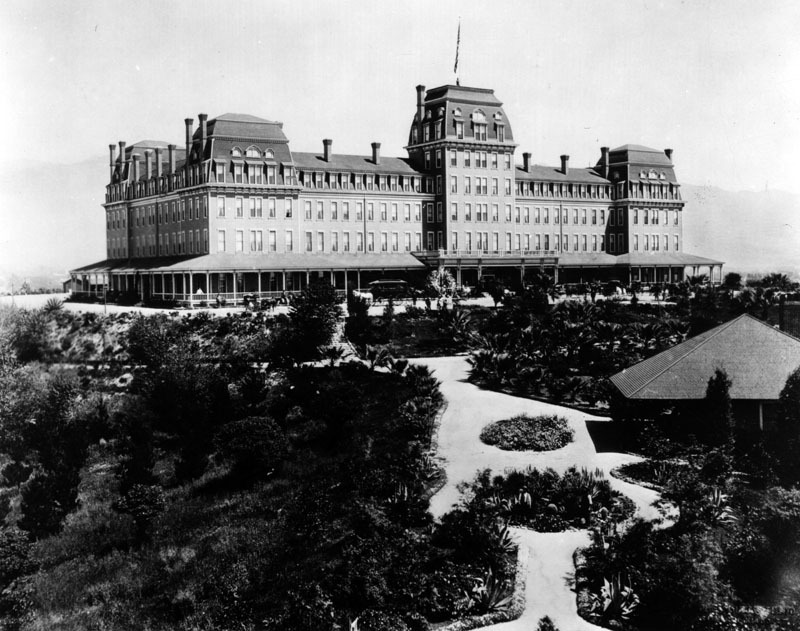 Note a man standing at the top of the hotel next to the flag pole. 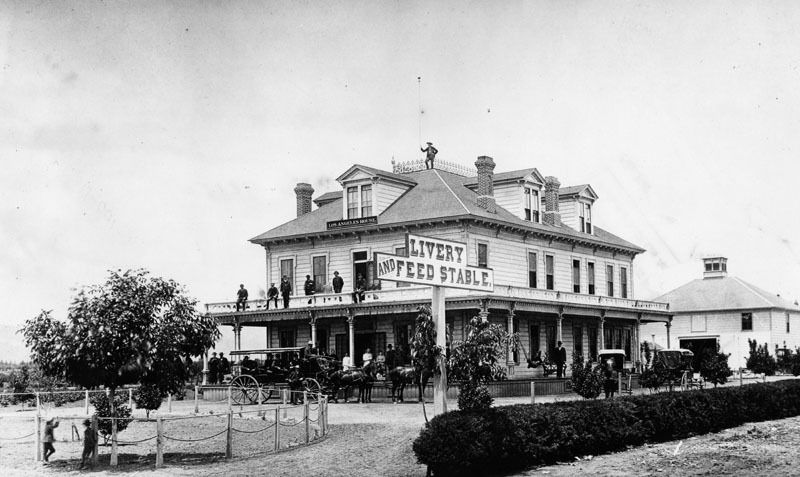 A large sign reads, "Livery and Feed Stable." (ca. 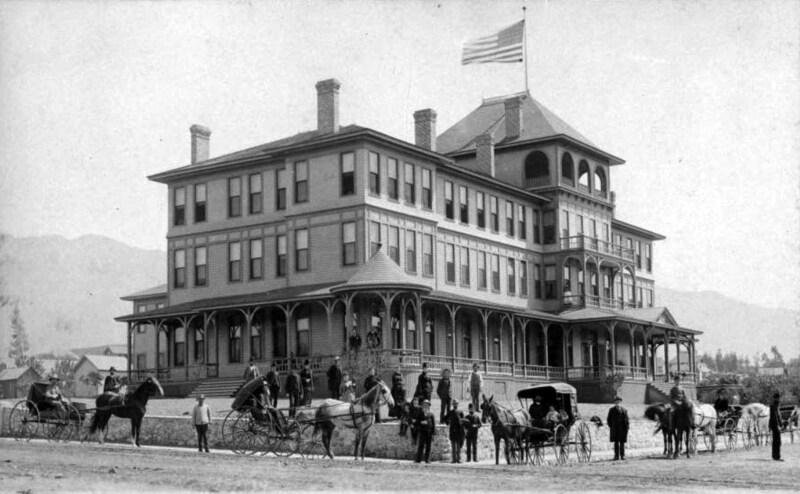 1886)** - View of the Los Angeles Hotel at its new location on the northwest corner of Colorado and DeLacy. Photo depicts a three story hotel with a crowd of nineteen men, four women two small boys riding a donkey and a black and white dog lying in the gutter. Two horse-drawn carriages are on the lower left. Notice sign -'Meals 25 cents'. 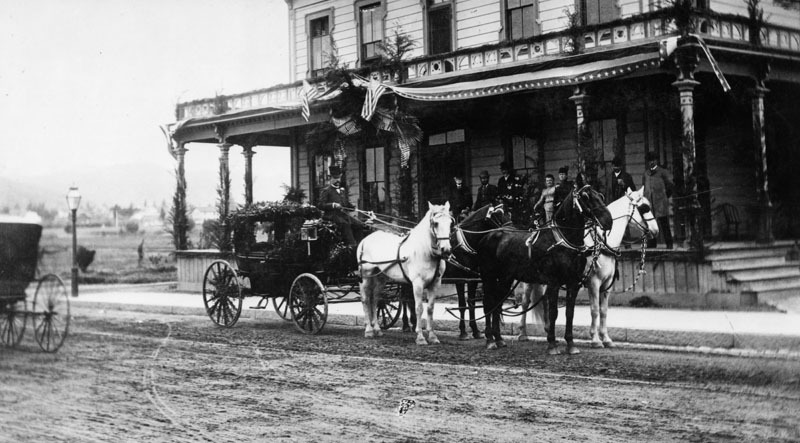 (1891)* - Carriage of President Benjamin Harrison makes a stop at the Los Angeles House in Pasadena, in 1891. (ca. 1890)#* - View of a three-story boarding house or hotel with wraparound porch, on a road in Pasadena, California. A sign on the third story reads: "Meals 25 cts." A sign hanging from the front porch reads: "The Marion. Furnished Rooms." (ca. 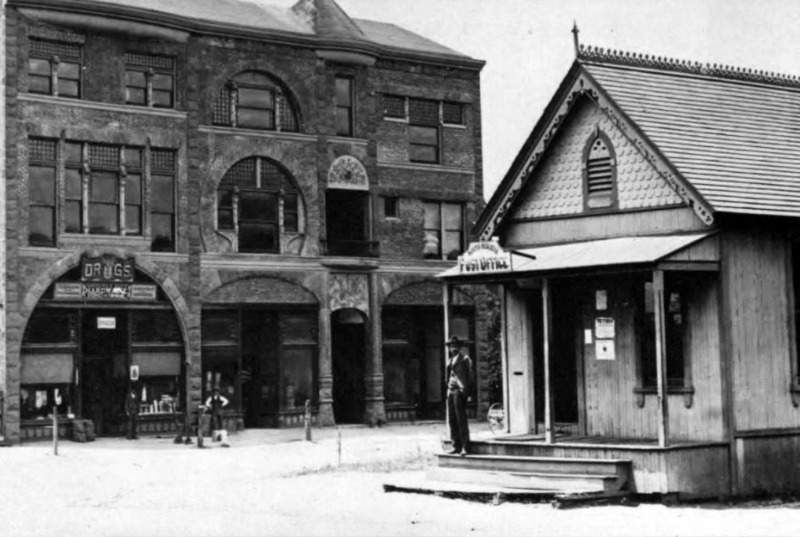 1885)** - View showing two men standing in front of the Brown & Blattenburg real estate office, 91 E. Colorado. It was part of first brick business block built by John W. Wood. 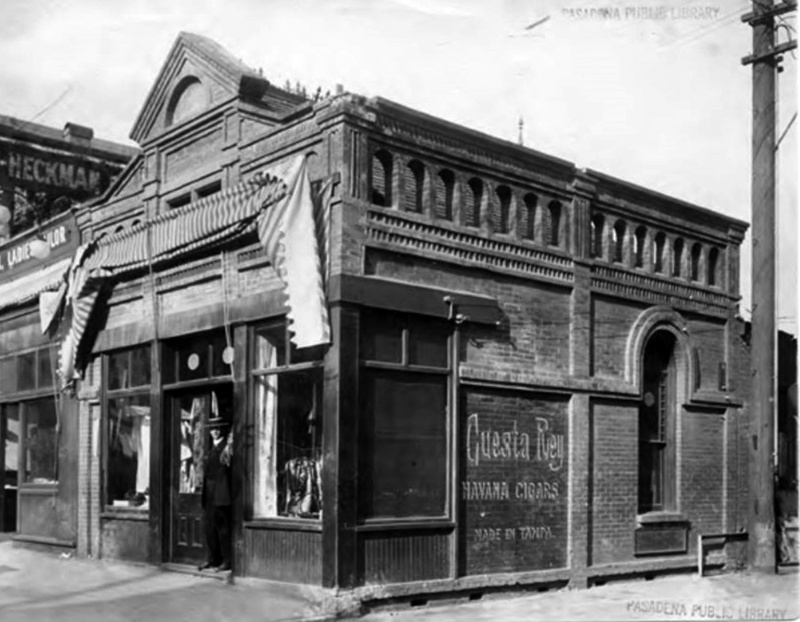 (n.d.)** - View showing a man standing in the doorway of the brick building at 91 E. Colorado. Writing on side of building reads: Cuesta Rey - Havana Cigars. 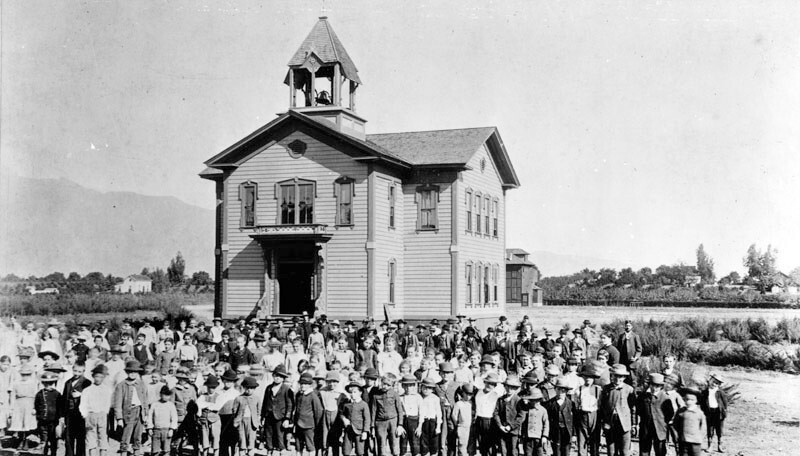 (1886)^ - View of the school property auction (5 acres) in front of Pasadena’s first school (Central School) near the corner of Colorado Street and Fair Oaks Avenue. 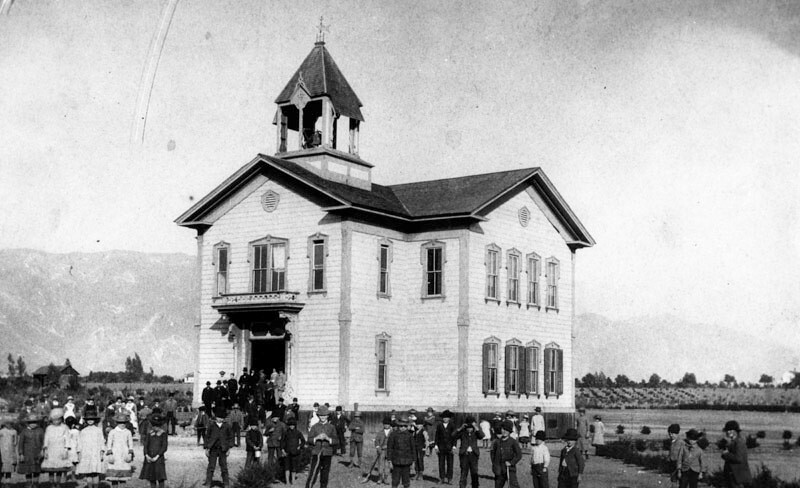 A large crowd of people standing behind a number of horse-and-buggies gather at bottom of the two-story schoolhouse, which sports a bell tower and clapboard veneer. In the foreground, two horses attached to still more buggies are tied to a hitching post, facing one another. (ca. 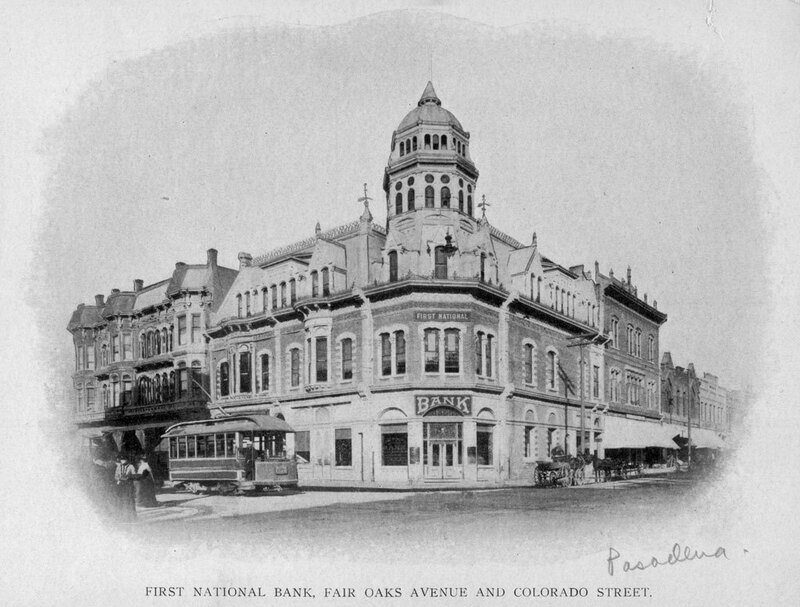 1886)** - View of the First National Bank located on the northwest corner of Colorado at Fair Oaks. Barney Williams Store is located on the northeast corner. On the left, it appears a horse is taking a break from pulling a trolley. 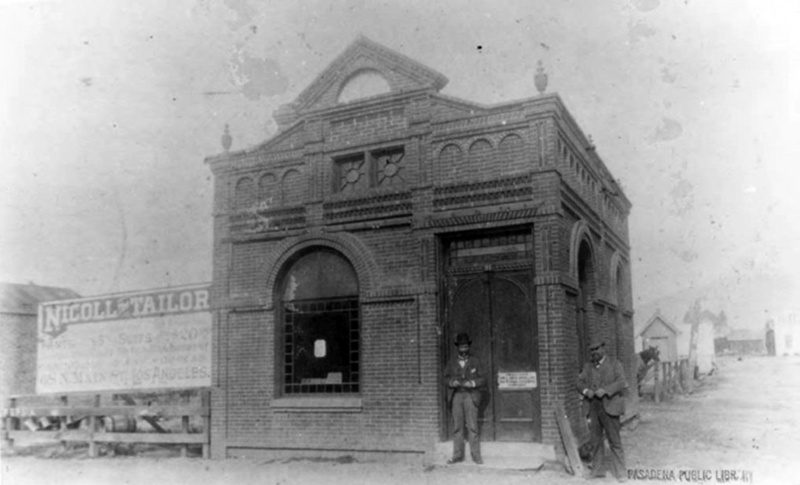 (ca 1880s)** - Close-up view showing the front entrance to the First National Bank on the northwest corner of Colorado and Fair Oaks. The Metcalfe Law Office is on the second floor. (ca. 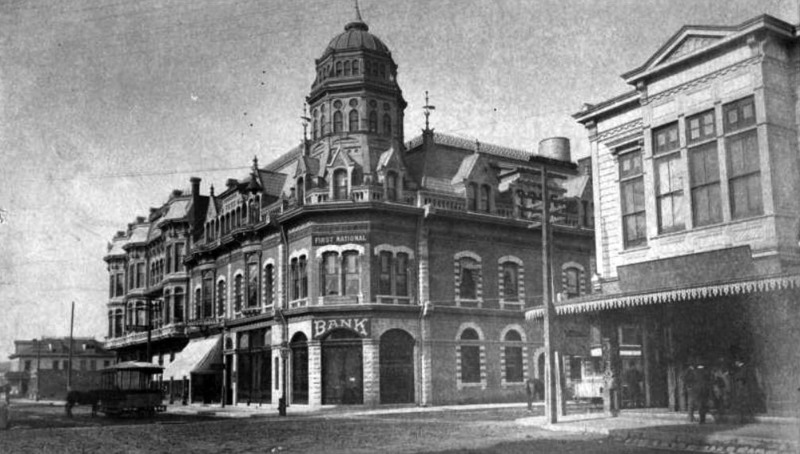 1890s)^ - View of First National Bank on the northwest corner of Fair Oaks and Colorado Street. Electric trolley is seen on the left. (ca. 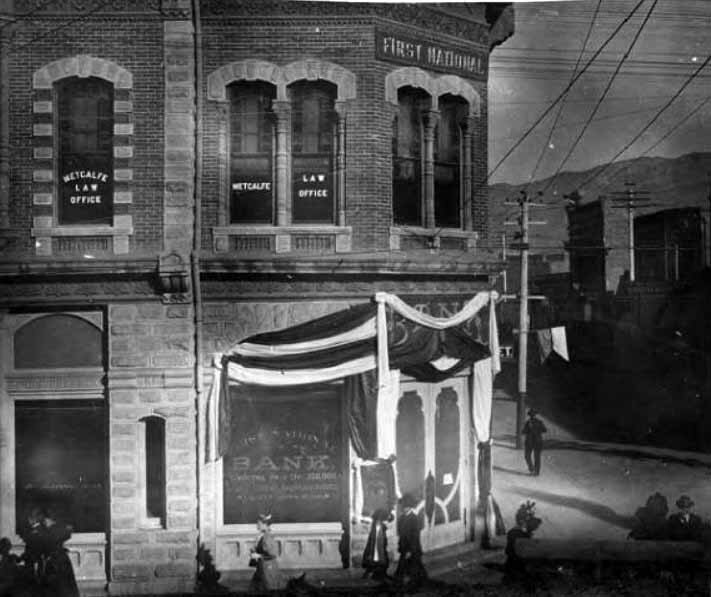 1887)** - Panoramic view of the Frost Block, located on East Colorado Street. 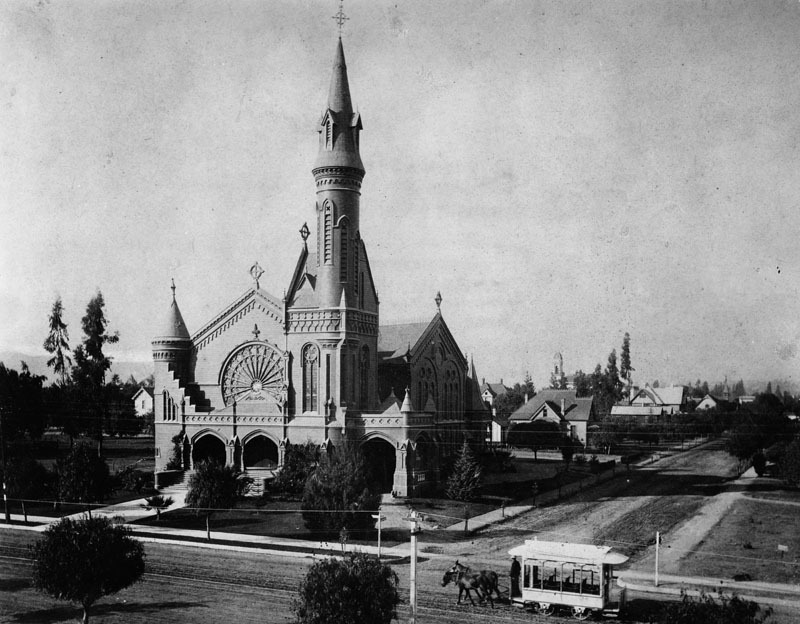 (1885)* - View of the Presbyterian Church in Pasadena, located on the northwest corner of Colorado Street and Garfield Avenue. Note the architectural design on the building, especially its beautifal tower. (ca. 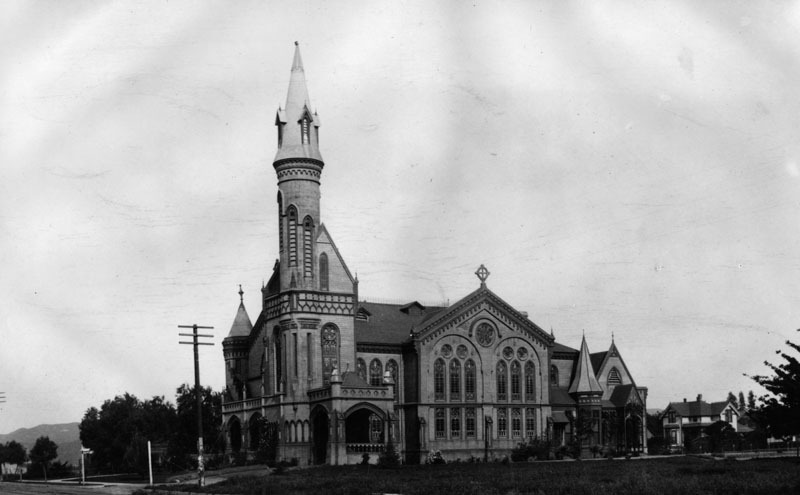 1880s)* - Exterior view of the Pasadena Presbyterian Church showing its impressive circular stained-glass window. A trolley pulled by two horses is seen heading west on Colorado. (1886)* - A 1886 map of Pasadena, when it was largely a town of orange groves. Drawings of various historical significant buildings surround the map. (ca. 1886)* - Exterior view of the Stetson residence located at 170 N. Orange Grove Avenue. 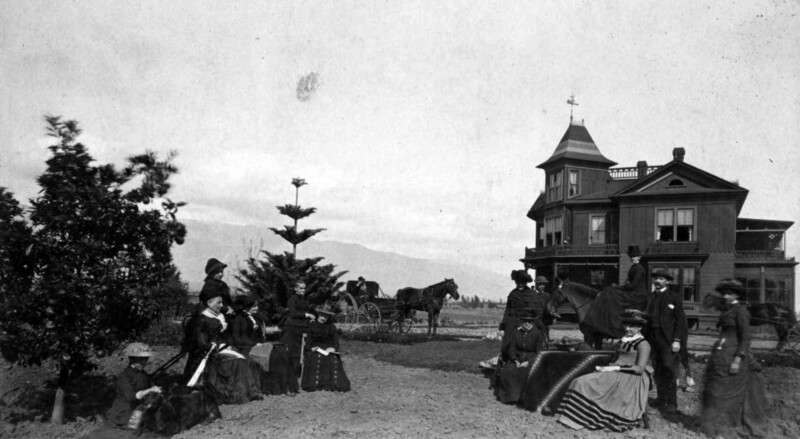 (1886)*^* - View showing the Carmelita House with guests on lawn and on horseback posing for the camera. (ca. 1886)*^* – Another view of the Carmelita House from a different angle showing several people standing on and around building including on balcony, porch, and stairway. (1876)* - View showing a man and child walking on a dirt path toward the Sierra Madre Villa Hotel, the pioneer summer resort of the San Gabriel River Valley. (ca. 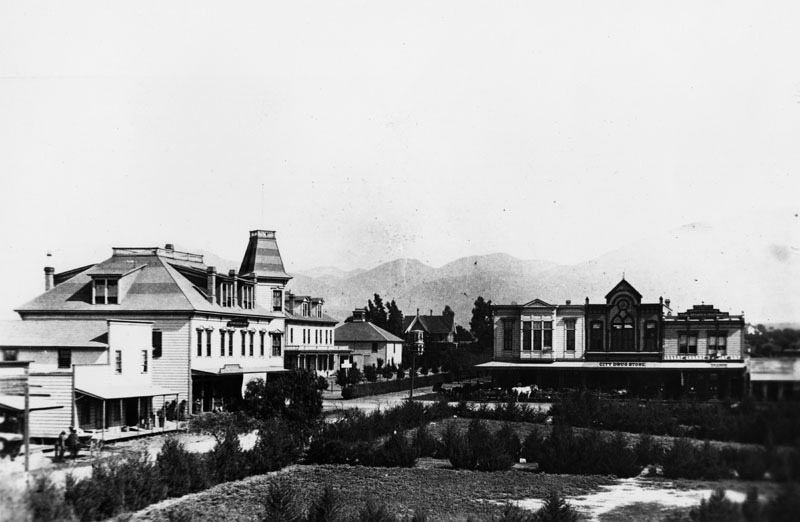 1878)^## - View showing the Sierra Madre Villa Hotel (left) and the Victorian Cogswell/Rhoades House (right). Note the man standing in front of a fountain in the midst of an orange grove. 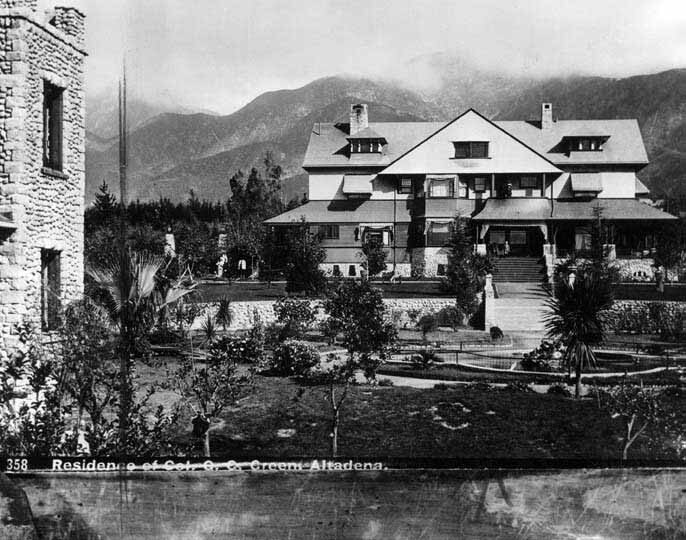 Artist William F. Cogswell was an east Pasadena pioneer and founded the world-renowned Sierra Madre Villa Hotel. He was also a noted portrait artist. The best known of his works is this 1864 portrait of President Abraham Lincoln that is part of the White House Collection. 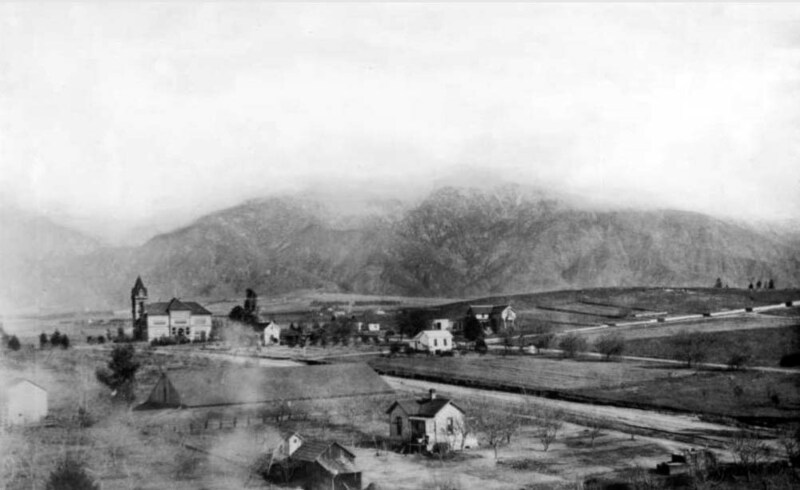 In 1873 he purchased 473 acres of wild mesa land in what is now east Pasadena. In its natural state, this land was said to be covered with greasewood so thick a jack rabbit couldn't penetrate it. But, the mesa offered unimpeded views that likely captured the artist's eye and imagination. There was the waiting San Gabriel Valley below and an ocean view that took in Catalina Island and steamers making their way to San Pedro. 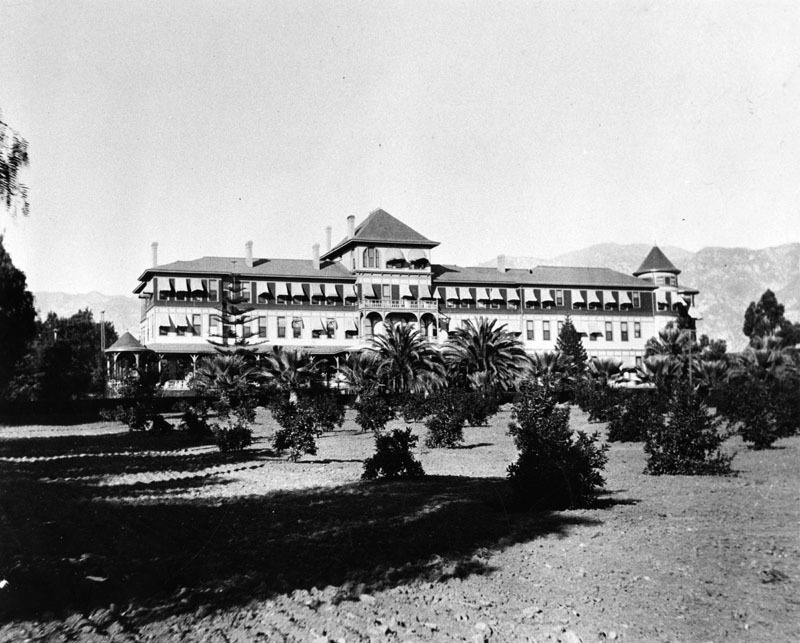 At the suggestion of friends, in 1876, Cogswell and his son-in-law William Porter Rhoades founded the Sierra Madre Villa Hotel on the site. He also built a beautiful Victorian home on the northern edge of the property. 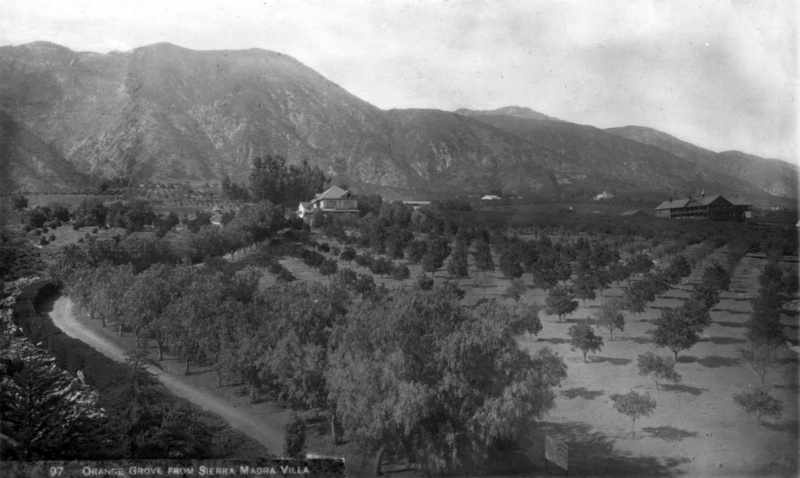 (1884)* - View showing the two story Sierra Madre Villa Hotel and Victorian Cogswell/Rhoades House surrounded by vineyards and citrus groves all set against the Sierra Madre/San Gabriel Mountains. The northern edge of Cogswell's property roughly bordered present day Fairpoint St. north of the Eaton Canyon Golf Course. The southern tip of his property extended to present day Foothill Blvd. and Sierra Madre Villa Ave. The jagged western edge of the property tracked the Eaton Wash. Cogswell's purchase also included rights to half the water flow over a waterfall located north of present day Pasadena Glen. (ca. 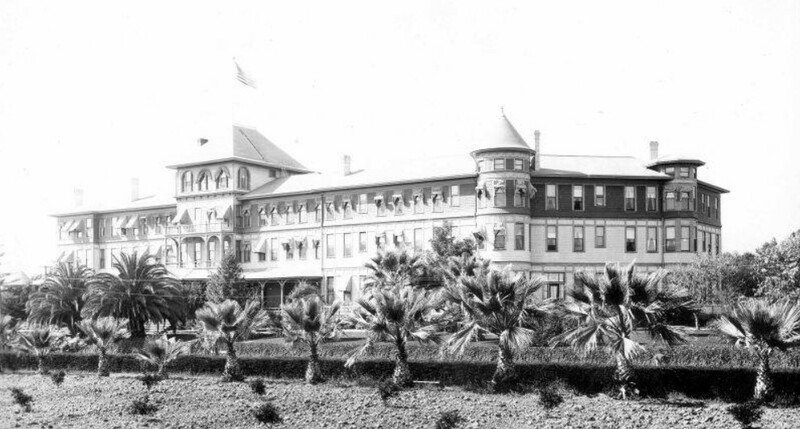 1890)^ – Close-up view of the Sierra Madre Villa Hotel in Pasadena. 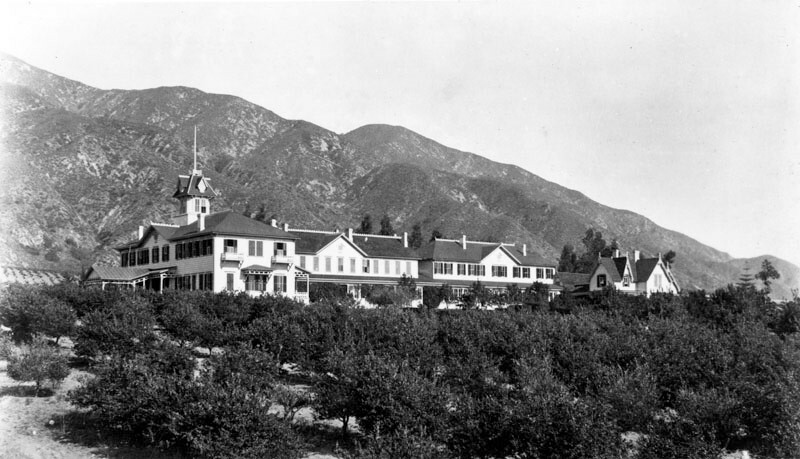 The two-story villa is pictured beyond a clump of short orchard trees that stands in the foreground, with the San Gabriel Mountains in the background. (ca. 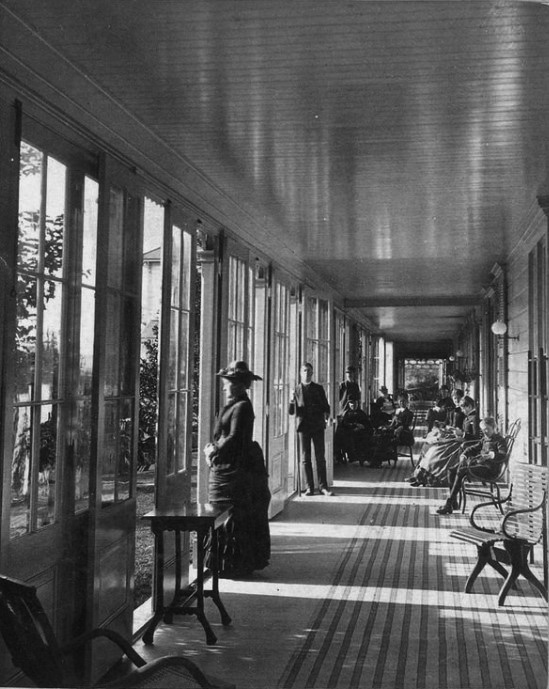 1890)##^^ – View showing the veranda of the Sierra Madre Villa Hotel with several guests just lounging around. A woman is seen looking out toward the view which includes orange groves in front of the hotel. (ca. 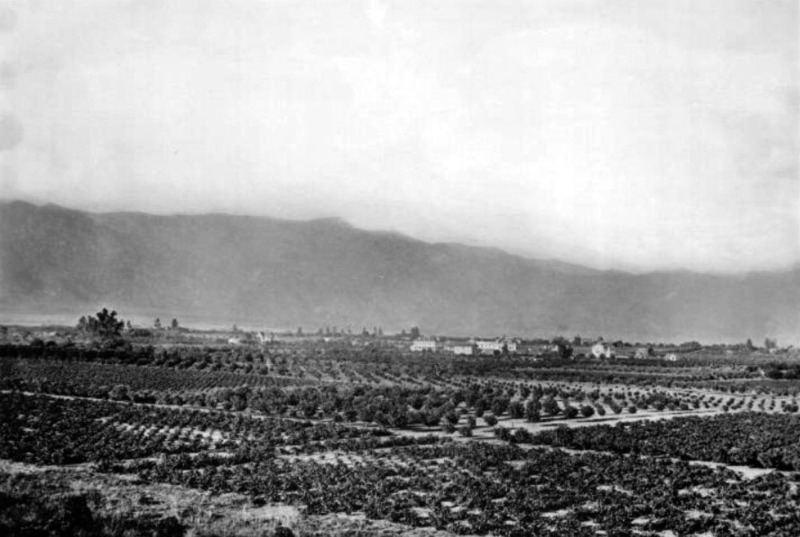 1890)^ – View showing orange groves in Pasadena as seen from Sierra Madre Villa Hotel with majestic San Gabriel Mountains in the background..
(1886)*^* - View showing the Frank H. Heydenreich's Orange Packing House (First in Pasadena). A sign reads, 'No Chinese Employed. 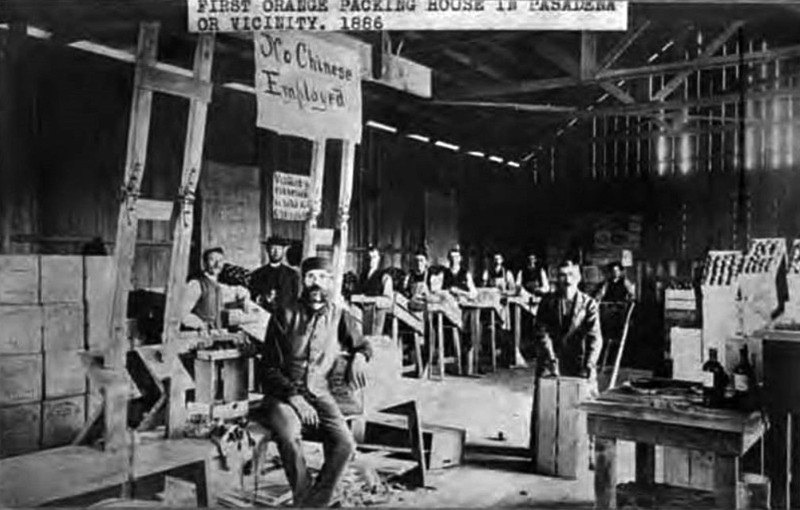 Many field workers were Chinese, but they were not welcome in the central city. 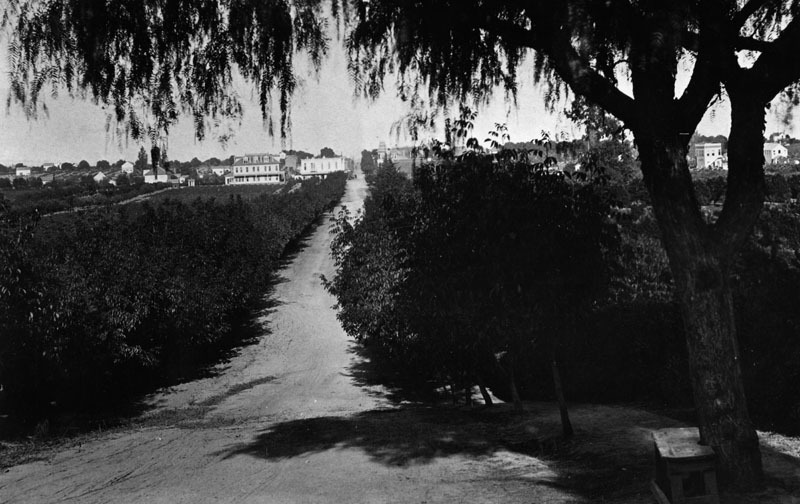 Although the city was born in 1886, Pasadena as a community traces its origins to the 1875 founding of the San Gabriel Orange Grove Association, an agricultural cooperative carved out of Rancho San Pasqual. 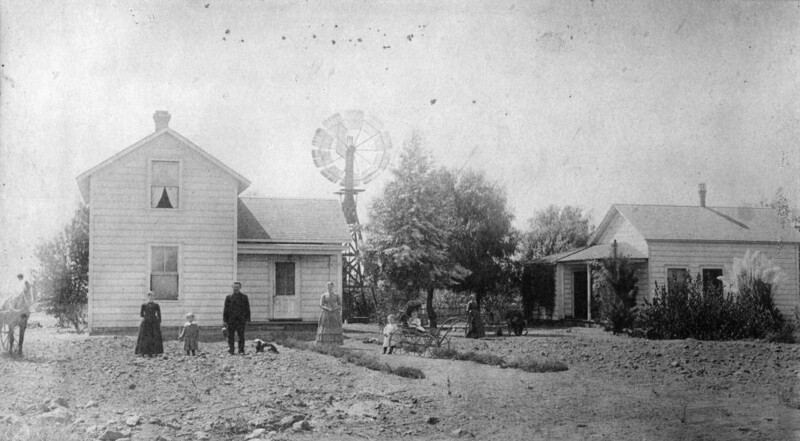 The colony of Indiana orange growers thrived, and its success fostered the growth of the settlement. 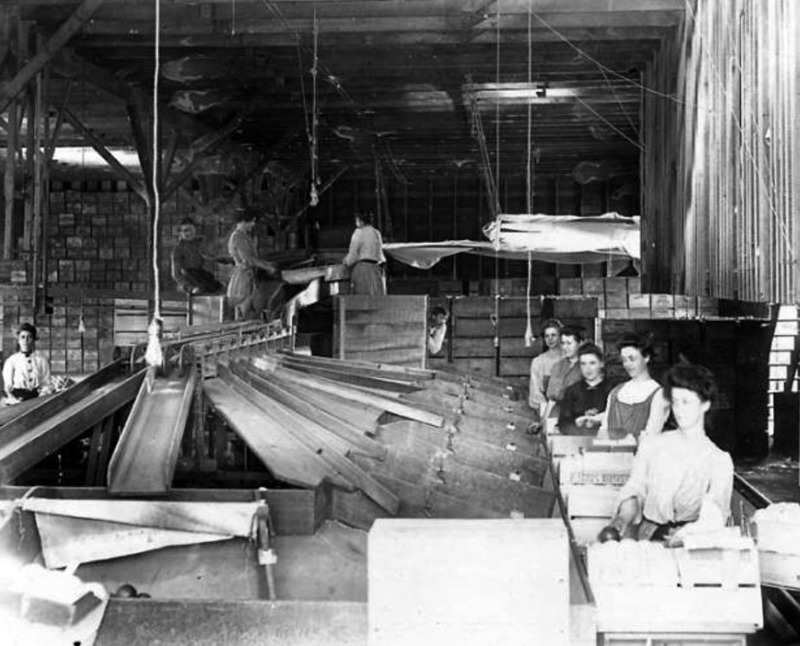 (n.d.)*^* - View showing workers crating oranges in a Pasadena packing plant. 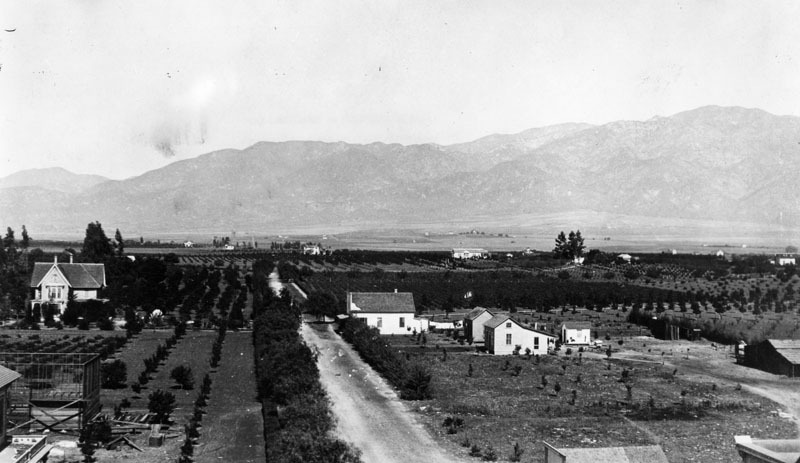 (1886)#* - Panoramic view, looking north from South Pasadena, showing orange groves and residences. 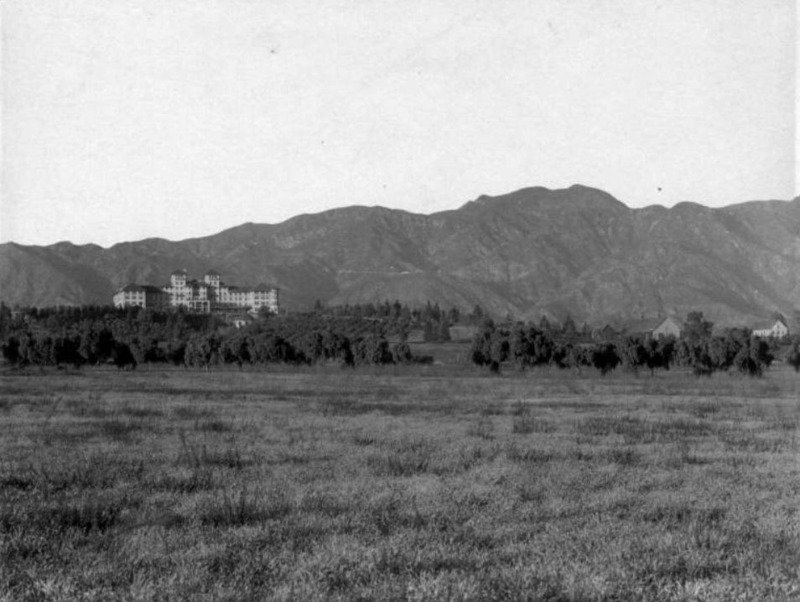 The Raymond Hotel sits on top of Bacon Hill at right-center with the San Gabriel Mountains seen in the background. (ca. 1886)* - A panoramic view facing the eastern facade of the Raymond Hotel. The surrounding land is still rural with scattered houses and small buildings close to a dirt road (Fair Oaks Ave) that passes over a bridge covering a small wash.
(ca. 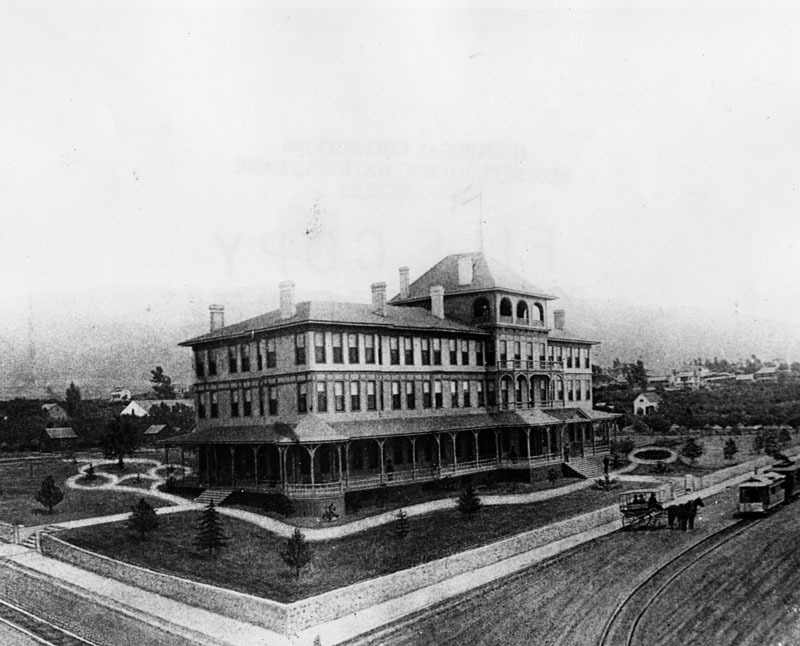 1886)* - View of the Raymond Hotel looking across the grounds at the western facade sans landscaping, located in South Pasadena. (ca. 1886)*#*^ - A view of the Raymond Hotel in Pasadena showing the multi-story hotel with an encircling porch, Mansard roof, decorative cornice, brackets, interior and end-wall chimneys, dormer windows and a balcony. 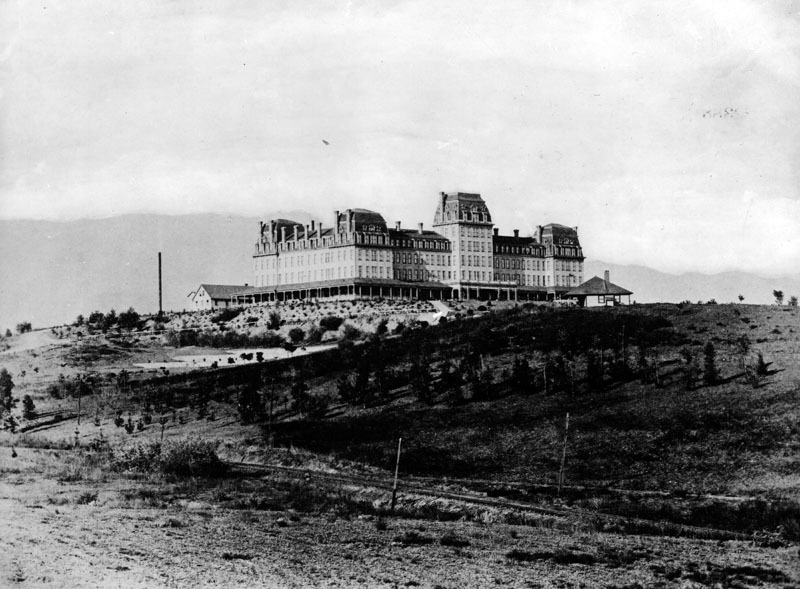 In June 1886 the Valley Union described the nearly completed hotel as "the most imposing sight in Southern California, and, perhaps, the greatest undertaking ever carried through here." (ca. 1886)* - View showing the Raymond Hotel with landscaping covering the embankment to the right of the stairs. Note the number of chimneys. 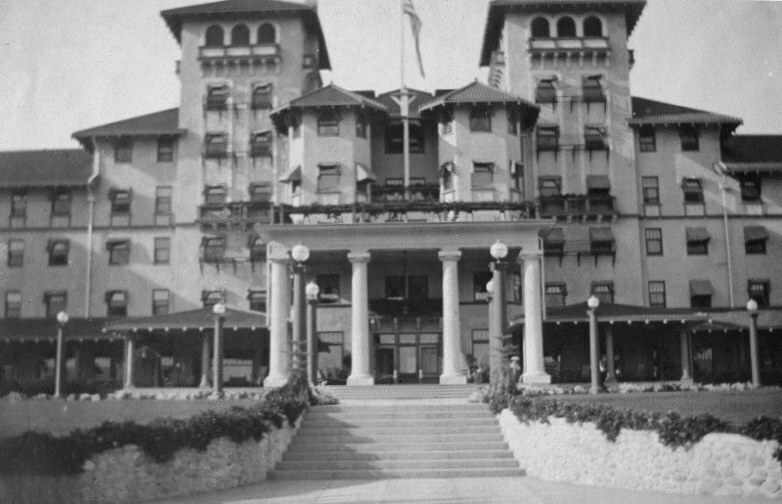 The Raymond immediately transformed Pasadena into a mecca for East Coast winter tourists. 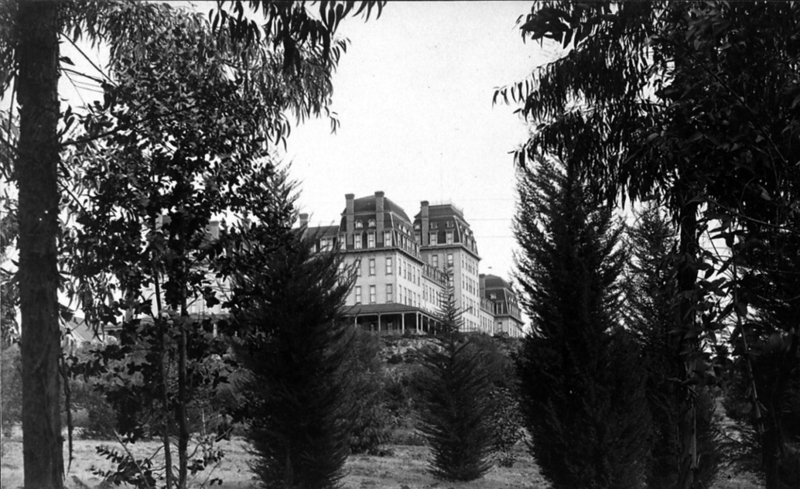 (1890s)^*# – View showing the Raymond Hotel through the trees. (1895)** - An ember from one of the Raymond Hotel's 80 chimneys landed on the structure's wood shingle roof, starting a fire that destroyed the hotel on Easter Sunday, 1895. On Easter Sunday 1895, a spark from a chimney set the roof on fire and the hotel and all its contents burned to the ground in 40 minutes. 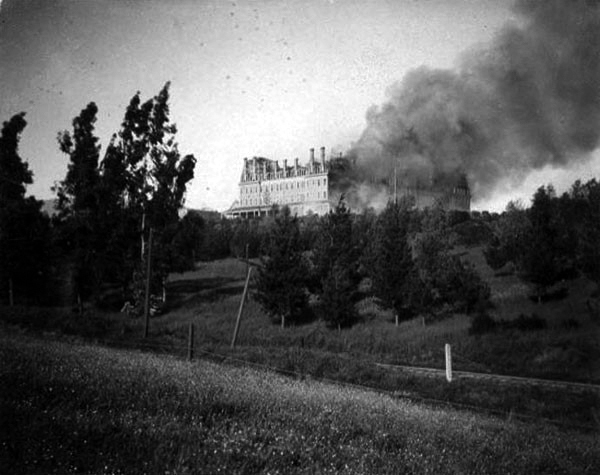 At the time there were 165 guests staying at the hotel, but most were at church, and as fortune would have it, no one was hurt though all their possessions were lost. (ca. 1901)*^ - Postcard view of the second Raymond Hotel (with fewer chimneys) built in 1901, torn down 1934. (ca. 1905)*#*^ - Young girls on donkeys wait in circular drive of the Raymond Hotel. The Mission style three story building has a corner turret, portico and arcades. Palms and flowering bushes line the drive where horse-drawn buggies sit. (ca. 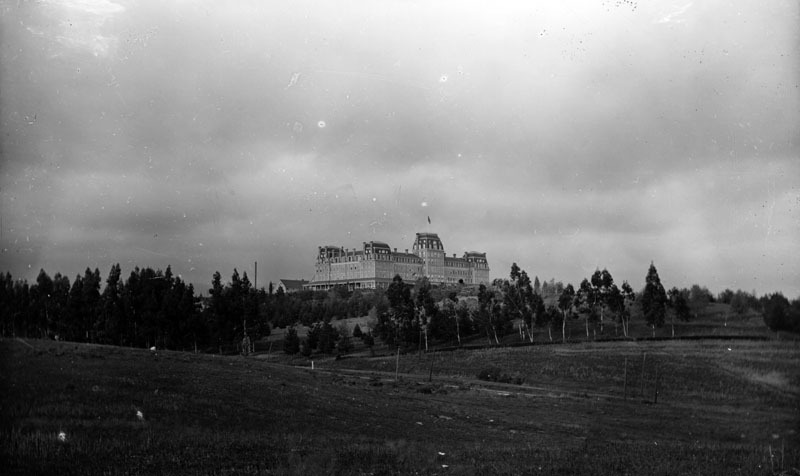 1908)### - Panoramic view of the second Raymond Hotel and surrounding area. (ca. 1910)*#*^ - View showing the front entrance to the Raymond Hotel with snow in the foreground. The Mission style three-story building has a portico, balconettes, arcade, striped awnings on windows, and a tile roof. Plants and flowering bushes decorate the main entrance. (1931)^#^^ – Postcard view of the Raymond Hotel showing circular driveway and landscaping. 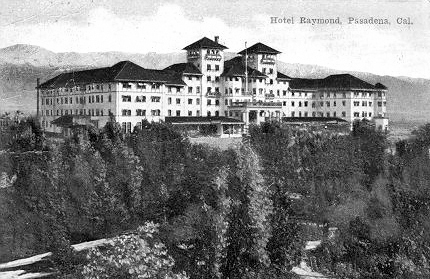 (1902)* - Exterior view of the Raymond Hotel located in Pasadena. View shows the stairs at the front of the hotel. Four tall pillars grace the entranceway. (ca. 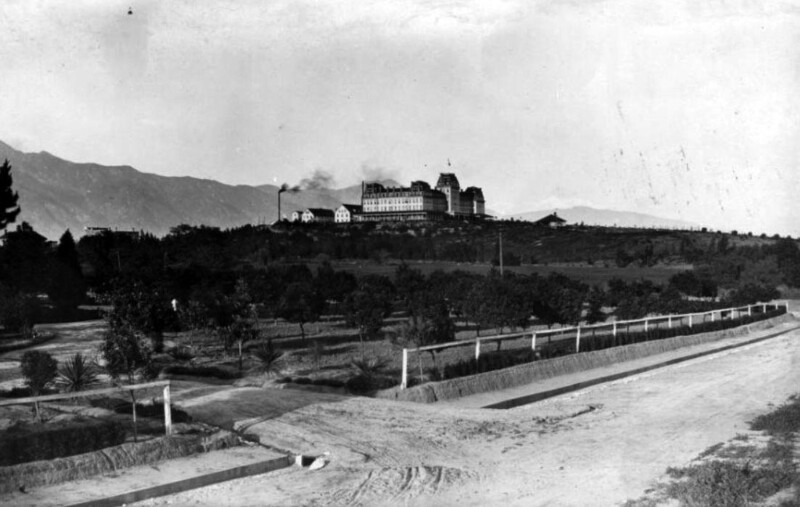 1902)^#^^ – View looking north toward the 2nd Raymond Hotel with the San Gabriel Mountains in the distant background. (1882)* – View showing several people on the porch of the home of Capt. Frederick J. Woodbury. 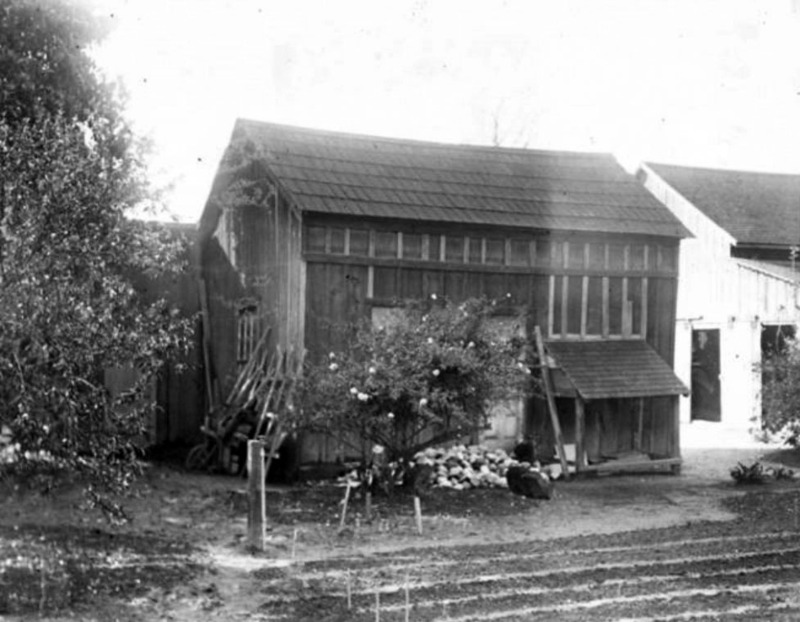 This was the first house built in Altadena. In 1880, Capt. Frederick Woodbury, and his brother, John Woodbury of Marshalltown, Iowa, purchased 937 acres known as the Woodbury Ranch. John Woodbury established the Pasadena Improvement Company in 1887, with a plot plan of residential development referred to as the Woodbury Subdivision. 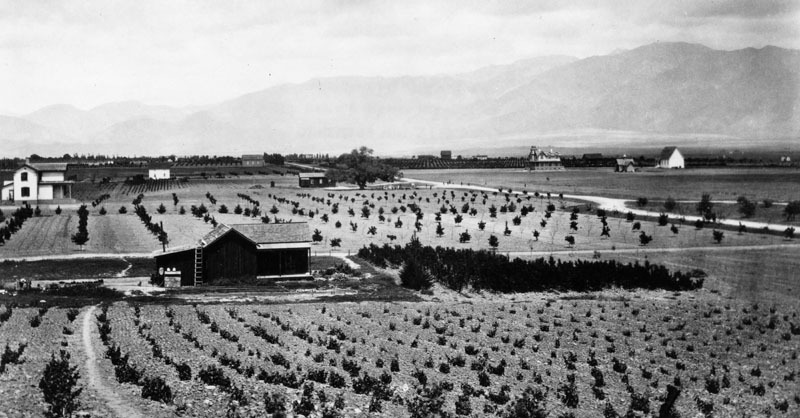 They contacted Byron O. Clark, who established a nursery in the foothills in 1875, and had since moved away. He called his nursery "Altadena Nursery", a name he coined from the Spanish "alta" meaning "upper," and "dena" from Pasadena. Woodbury asked if he could use the name "Altadena" for his subdivision and Clark agreed. Mariposa was taken from the Spanish name for a butterfly. (ca. 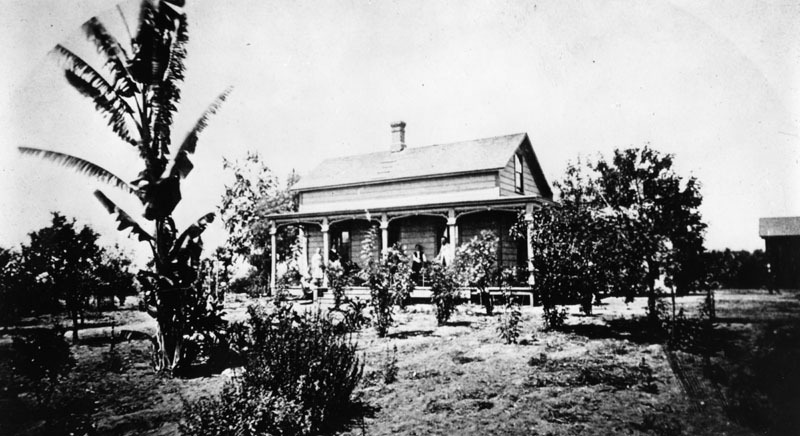 1888)* - Exterior view of the home of Col. G. G. Green in Altadena. Green, the patent medicine millionaire--who was among the wealthy who moved to Altadena from all over the nation. (1880s)** - Bird's-eye view of abolitionist John Brown Boys' Ranch, with Little Round Top visible in background, located in Altadena. Known primarily through the notoriety of their father, brothers Owen and Jason and brother-in-law Henry Thompson also played important roles in history. All three fought proslavery forces in Kansas during the 1850s, and Owen participated in the Harpers Ferry raid, along with Henry’s brothers, William and Dauphin. John Brown and 21 followers overtook the U.S. Federal Arsenal and Rifle Works in the town of Harpers Ferry, Virginia, on October 16, 1859, in an attempt to steal weapons for a planned slave revolt. Though the raid ended in disaster, Owen and four others managed to escape, and over the course of 36 days, made their way to safety in the North. Existing as a fugitive for nearly twenty years, Owen hid with family in Ohio during the Civil War, and worked for the Underground Railroad until Emancipation. (1880s)* - This is a remarkable photo of John Brown's sons--Jason, John Jr. and Owen (left to right)--at their cabin in the Altadena Hills. Owen was at Harper's Ferry in 1859 and was the last survivor of that historic raid. 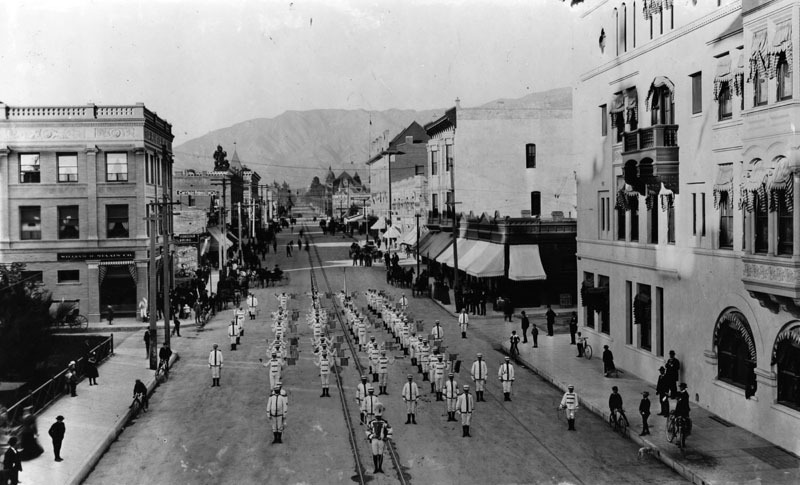 (1886)#* - Pasadena celebrates Grand Army of the Republic Day, 1886. The parade honored Union veterans of the Civil War, as well as Owen and Jason Brown, sons of the radical abolitionist John Brown and residents of nearby Altadena. 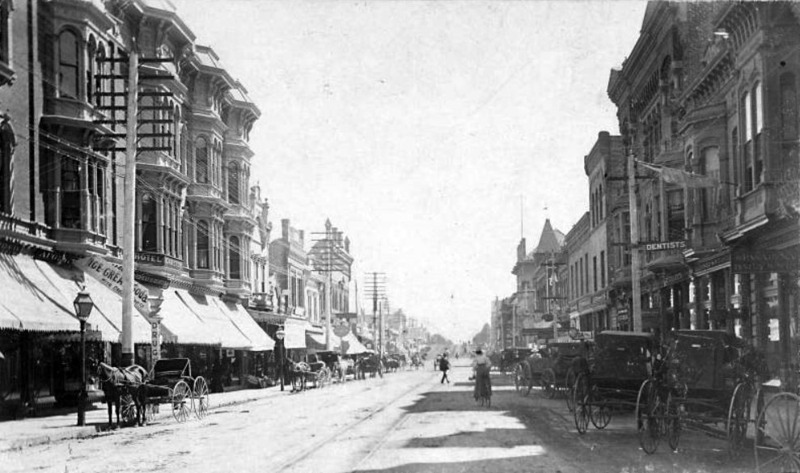 (1886)* - View of Colorado Street, looking west. 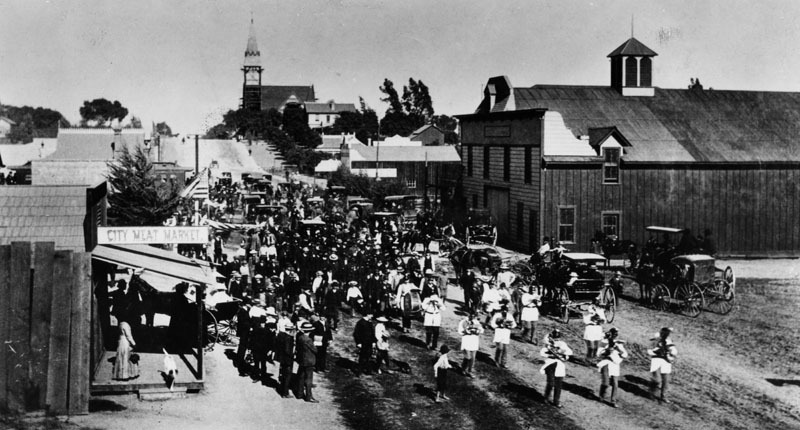 People of Pasadena are celebrating advent of the 1st Railroad with a parade, September 30, 1886. On the right there is a Lumber yard and a Carpenter's shop. Large building in the distance (left side), is the Ward Block, which includes the Pasadena Bank and the Grand Hotel. (1887)** – Postcard view showing Colorado Street shortly after Pasadena was incorporated, July 19, 1886. Back of postcard, bottom reads: "Pasadena, our original home office city, in the year of our founding, 1887." (1887)* - View looking south on Fair Oaks from near Colorado showing several horse-drawn wagons parked alongside the dirt road. Several businesses can be seen on the right: a Market, Pasadena Carriage Works, a Clothing store and a Dry Goods store. 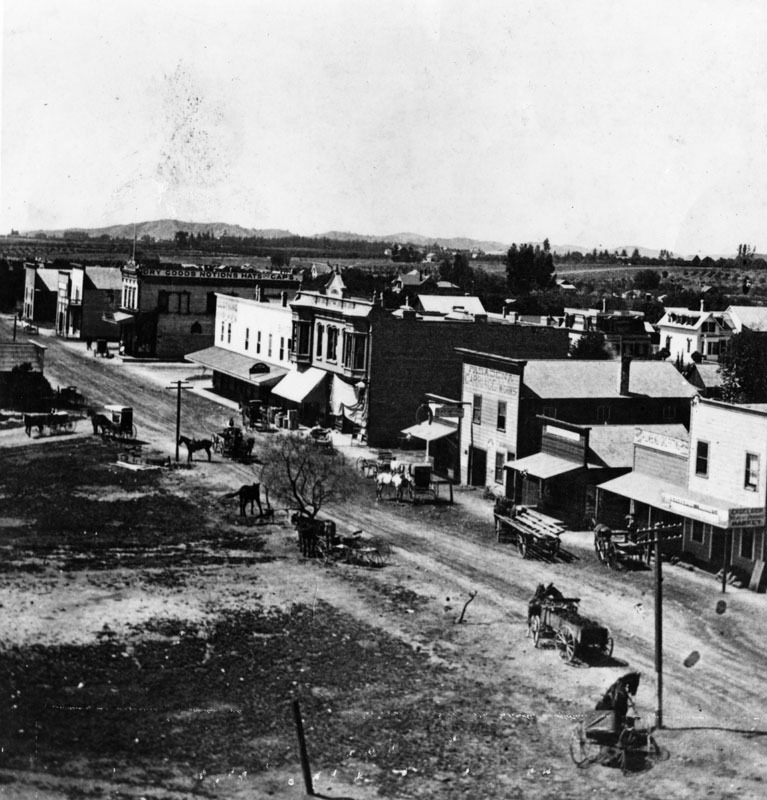 (1887)** - Close-up panoramic view looking south on Fair Oaks Avenue from Colorado. Some of the buildings seen in the photo include Valley Feed Mill and Pasadena Carriage Works. (ca. 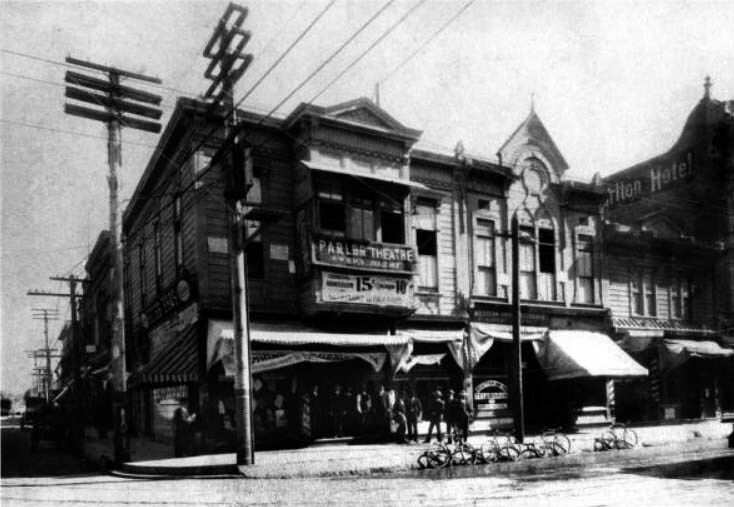 1887)^ - View of the Barney Williams Store in Pasadena on the corner of Colorado Street and Fair Oaks Avenue. 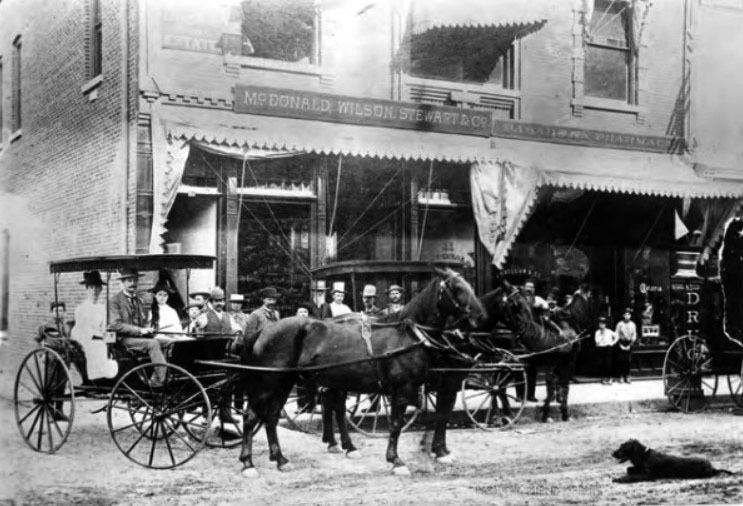 A group of people stand on the porch of the two-story building while a horse-drawn carriage drives sits nearby. The building sports a clapboard veneer along with a balcony and a box window on its second floor. Several people attend a small horse in the background at right. (1887)** - View of the Wilson School located on the southeast corner of Marengo Avenue and Walnut Street. (1903)** - View of a decorated Wilson High School during a visit by President T. Roosevelt on May 8, 1903. (1918)** - View of Wilson School (cor. 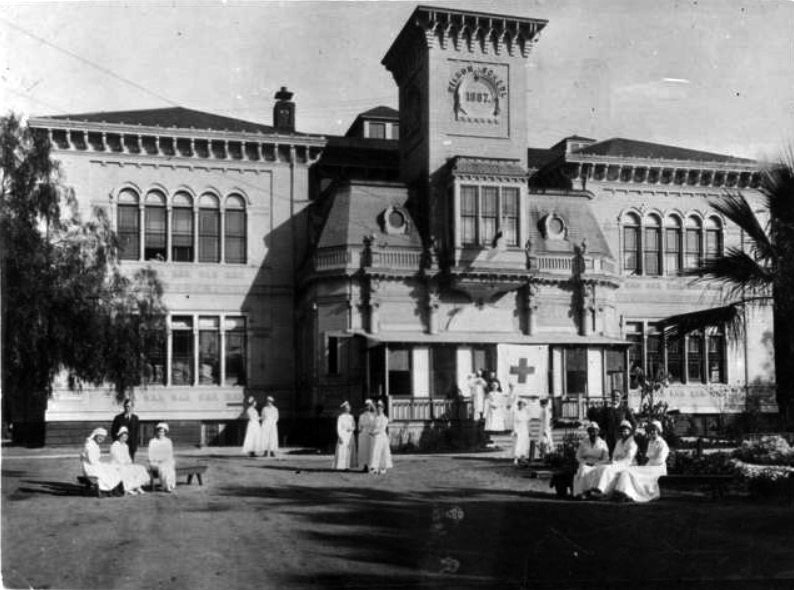 Marengo & Walnut) used as Red Cross Hospital for flu epidemic. Illness from the 1918 flu pandemic, also known as the Spanish flu, came on quickly. Some people felt fine in the morning but died by nightfall. People who caught the Spanish Flu but did not die from it often died from complications caused by bacteria, such as pneumonia. The Los Angeles and San Gabriel Valley Railroad was founded in 1883 by James F. Crank with the goal of bringing a rail line to Pasadena from downtown Los Angeles. 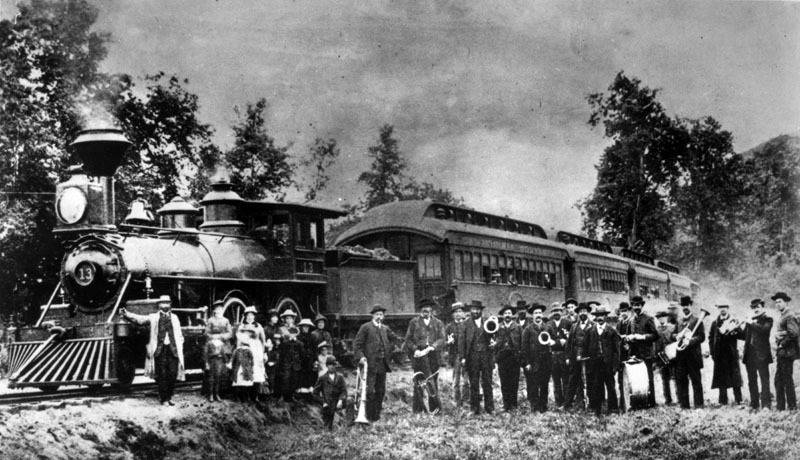 Los Angeles and San Gabriel Valley Railroad was sold and consolidated in 1887 into the California Central Railway. In 1889 this was consolidated into Southern California Railway Company. On Jan. 17, 1906 Southern California Railway was sold to the Atchison, Topeka and Santa Fe Railway and called the Pasadena Subdivision. (ca. 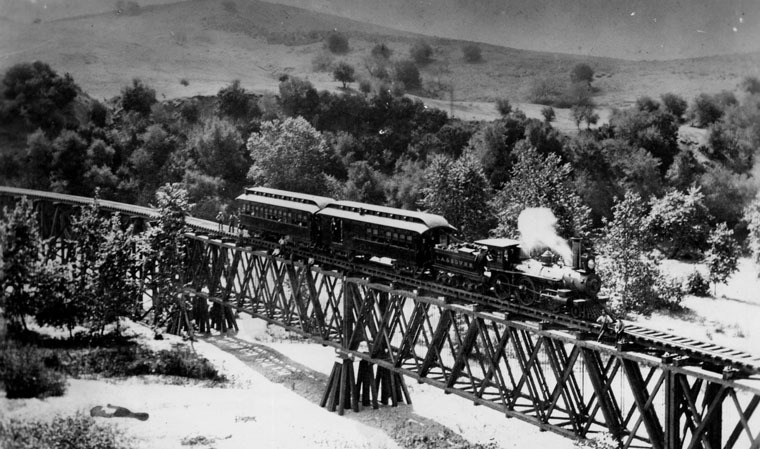 1885)*^ - View showing a Los Angeles and San Gabriel Railroad train on the bridge at Garvanza, the first trestle across the Arroyo Seco, approaching Highland Park from South Pasadena. 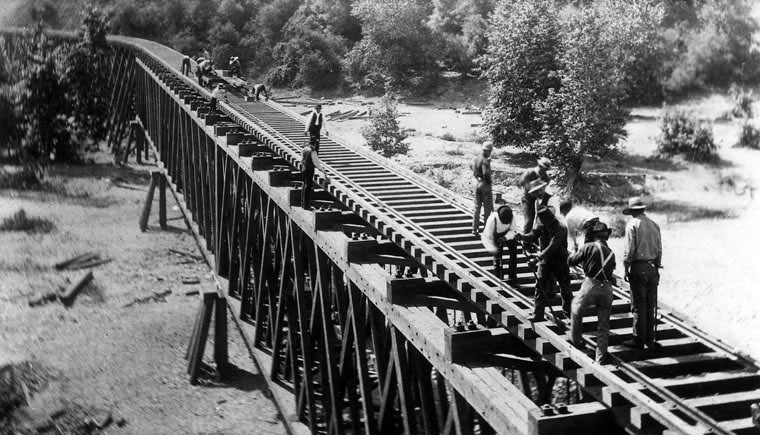 The trestle, which was replaced later by the Santa Fe trestle, extends out from the forest, supporting a steam engine trailing two passenger cars behind it. 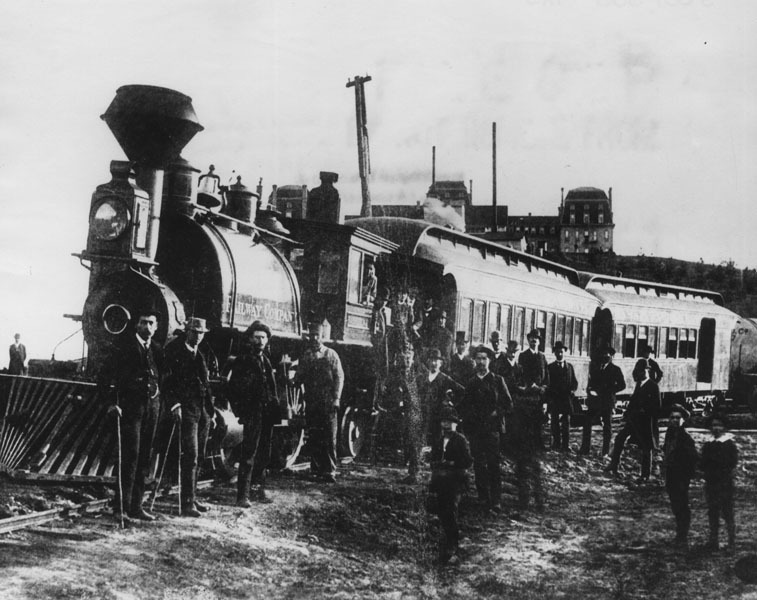 Two men stand on the tracks at back, one with his hand on the last passenger car. Two more men stand to the side of the tracks in front of the engine. (1886)*^ - Map of the Los Angeles and San Gabriel Valley Railroad showing the location of the Arroyo Seco Bridge. 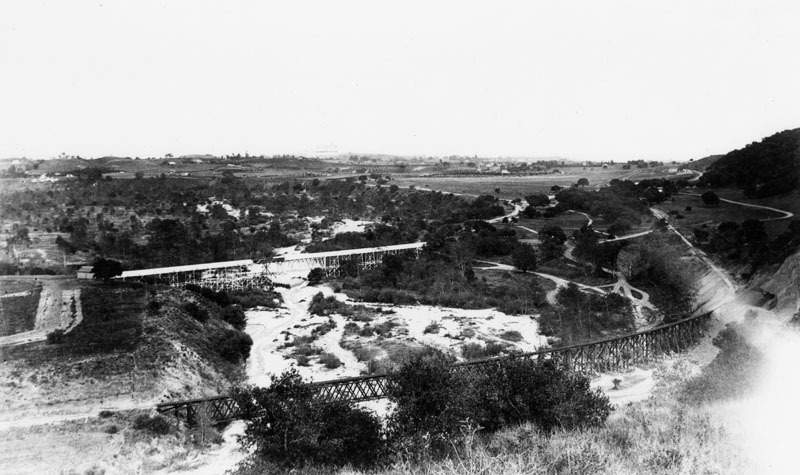 (1891)* - Panoramic view of two railroad bridges in Arroyo Seco, in Pasadena. 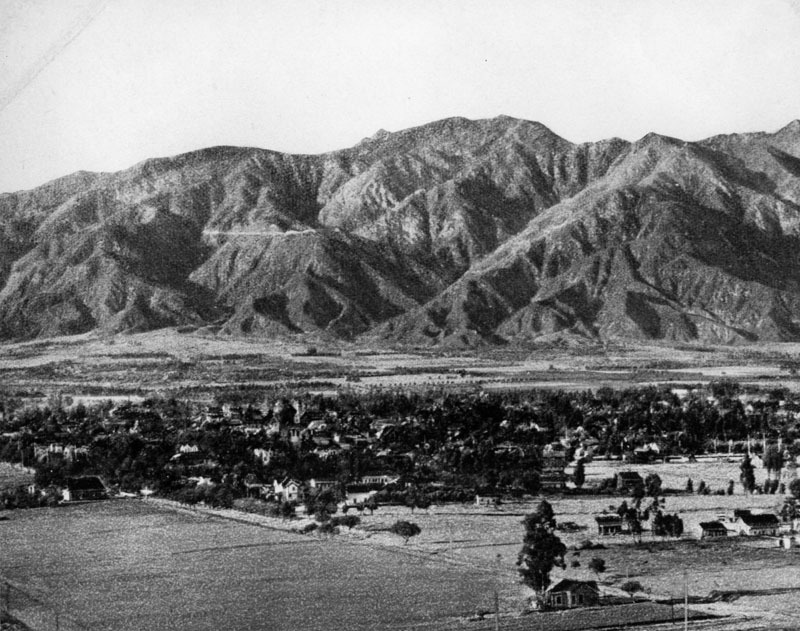 The Arroyo Seco region can be considered by historical accounts as the birthplace of Pasadena. 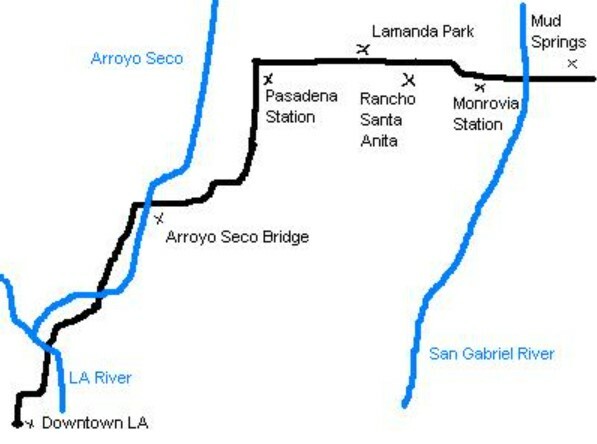 After the 1820s secularization of the Missions, the broad area to the east of the Arroyo was the Mexican land grant of Rancho San Pascual, present-day Pasadena, California. Manuel Garfias was the grantee of the Rancho and its longest early resident. 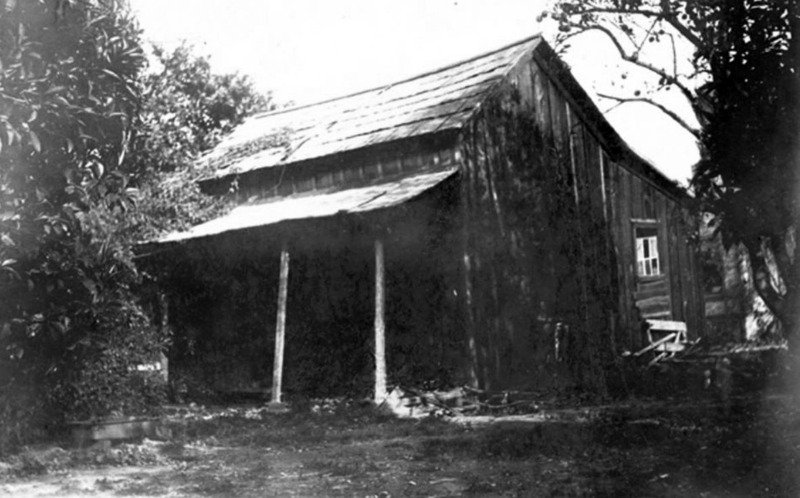 His adobe house was on the east ridge of the Arroyo, in present-day South Pasadena. (ca. 1910)++# – View showing the outbound Santa Fe morning local in route from LA to Pasadena crossing the Arroyo Seco. (ca. 1888)* - Group photo was taken in the Arroyo Seco area. In the background is the California Southern R.R. (now the Santa Fe), locomotive #13, built in 1882. (ca. 1888)* - The Los Angeles Terminal Railway in Pasadena near Raymond Hotel in background. The Los Angeles Terminal Railway, earlier known as the Pasadena Railway, and unofficially as the Altadena Railway, was a small terminal railroad line that was constructed between Altadena and Pasadena, California in the late 1880s. It was a byproduct of a land boom period and a victim of the land bust that occurred soon thereafter. 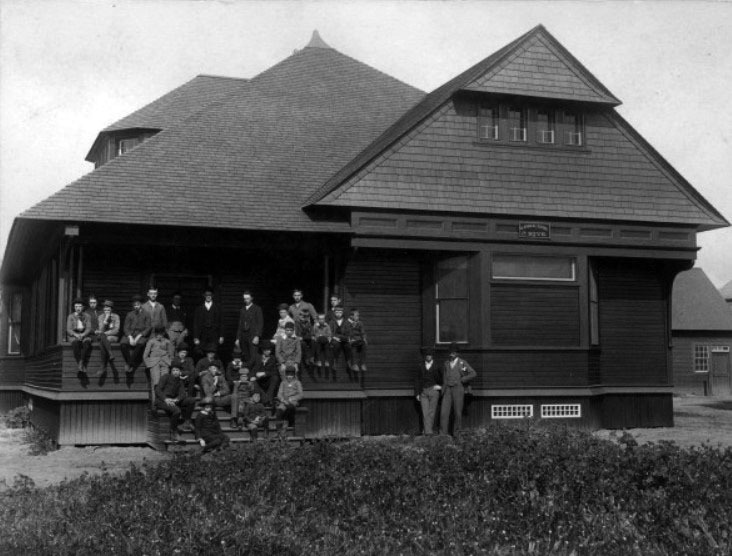 It opened officially on January 31, 1888. 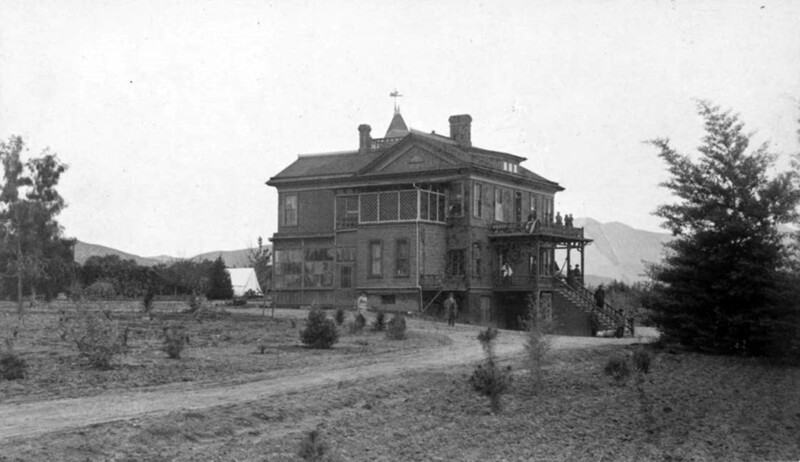 (1888)* - View showing several people in front of the Andrew McNally residence in Altadena. The Queen Anne mansion is almost hidden by the palms. Frederick Louis Roehrig designed the home. 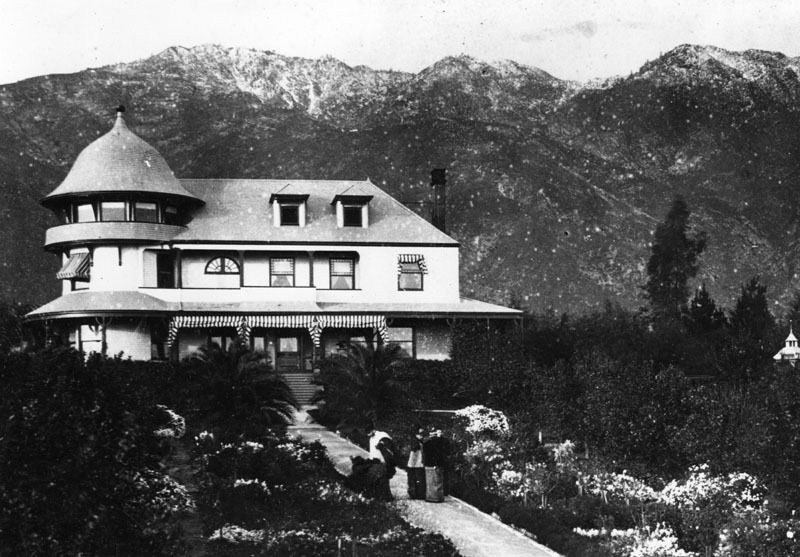 (1888)* - Exterior view of the Andrew McNally residence on Mariposa Street in Altadena, with the San Gabriel Mountains in the background. (ca. 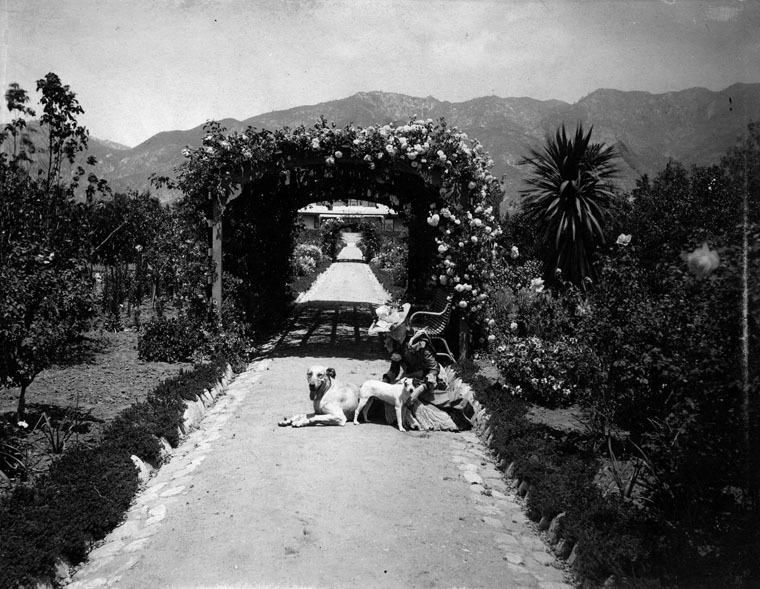 1888)* - View of a woman and two dogs on the path of the garden at the home of Andrew McNally, the well-known Chicago publisher. A partial view of the home may be seen past the arch of roses. Home is located on Mariposa Street and Santa Rosa Avenue in Altadena. (ca. 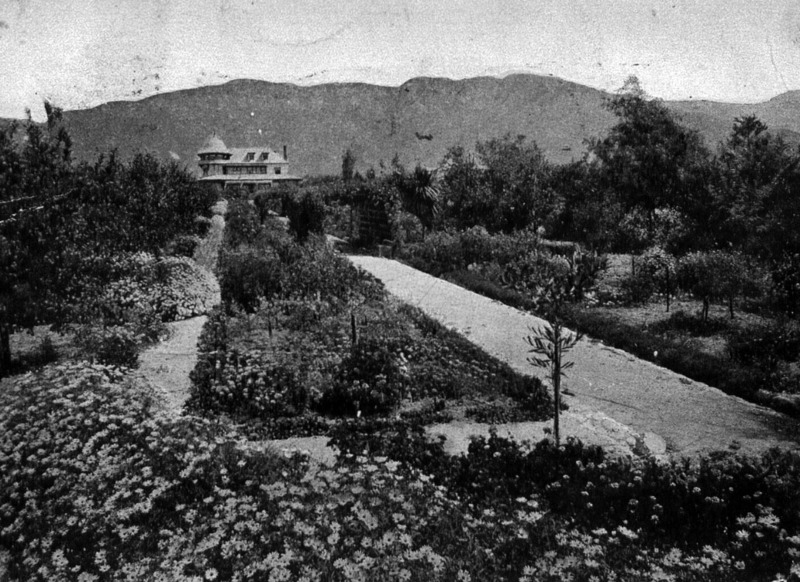 1900)*^ - Postcard view showing the McNally Residence and gardens. 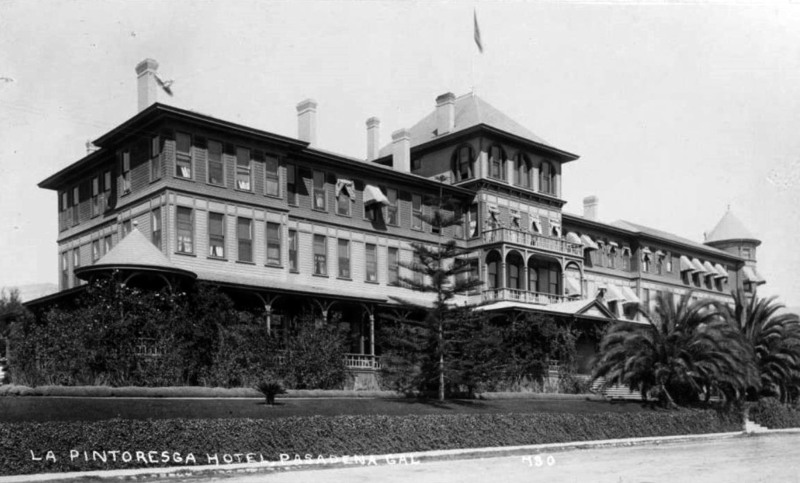 The grounds were lavishly landscaped, with an aviary along Mariposa St. McNally's gardener also looked after the deodar cedars that grew along Santa Rosa Avenue. 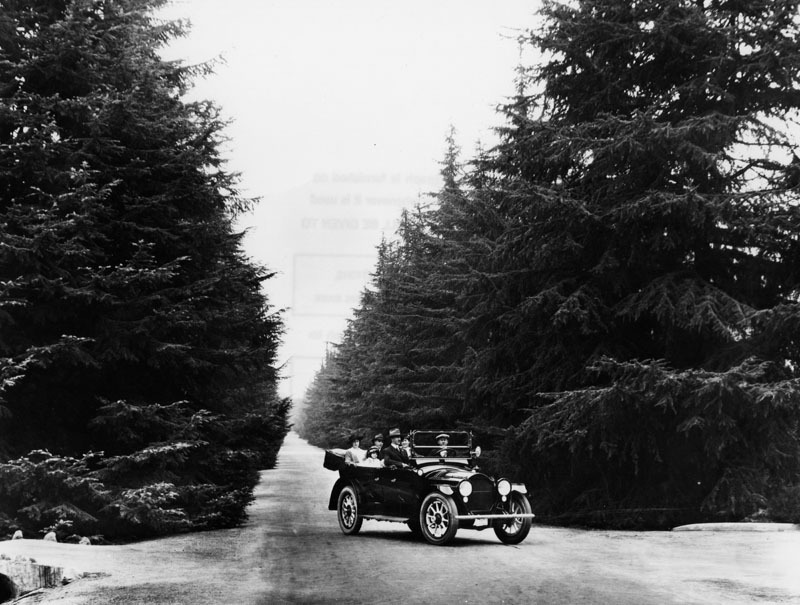 These trees became Christmas Tree Lane, which is also listed in the National Register. (1899)*#*^ - View of Mt. Lowe from Monk's Hill on a cloudy day. Note the orange groves and vineyards in the foreground. The Echo Mountain House can be seen in the San Gabriel Mountains (top-center). On closer look you can make out Christmas Tree Lane with deodar saplings in the middle of photo. The McNally and Greene mansions are those buildings on either side. The dirt intersection in foreground is of Howard and Marengo. 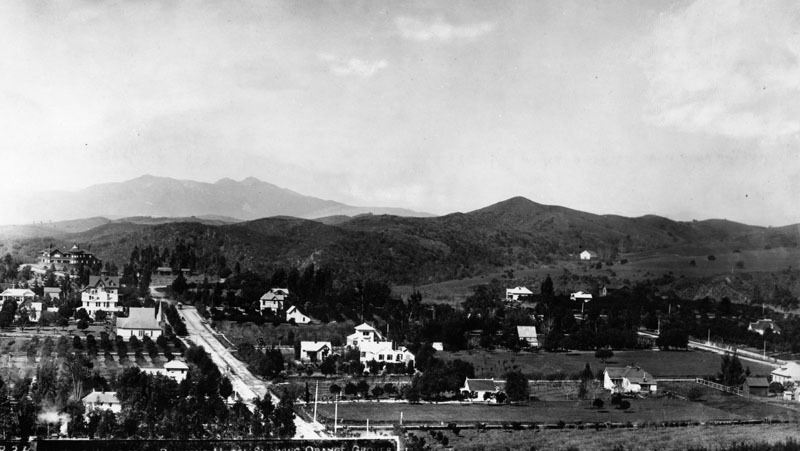 (1915)^*^# – View looking north showing Altadena's Santa Rosa Avenue. Five years after this photo was published, the Christmas tree lighting tradition began and the street became affectionately known as Christmas Tree Lane. (ca. 1928)* - Passengers in a car travel south on Santa Rosa Avenue, also known as Christmas Tree Lane in Altadena. 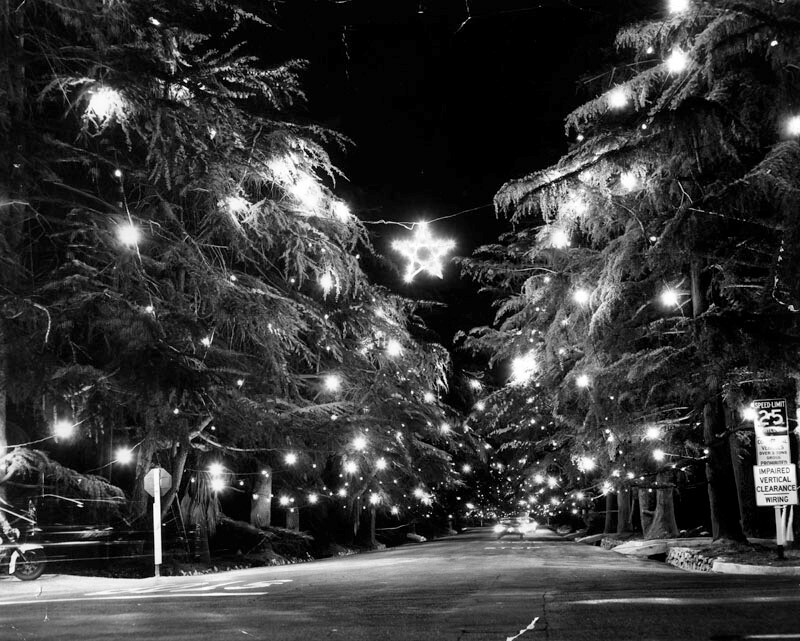 The nickname was given to the street when the tradition of lighting the large deodar cedars with lights at Christmas time was started. Location: Santa Rosa Ave, both sides of street from Woodbury Rd to Altadena Dr, Altadena. (ca. 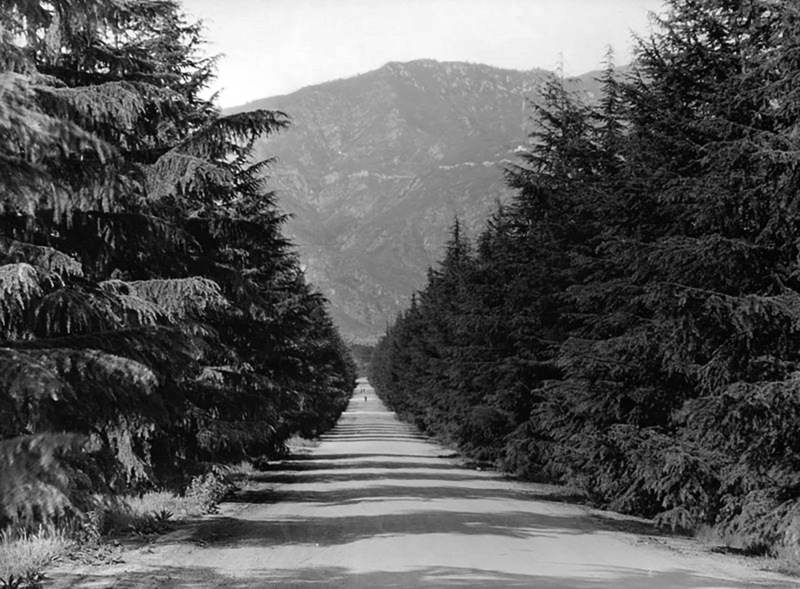 1947)* – Christmas Tree Lane (Santa Rosa Avenue) in Altadena, looking north from Woodbury Road. Every Christmas season for more than 90 years, the majestic deodars on the "Mile of Christmas Trees" are strung with 10,000 lights. 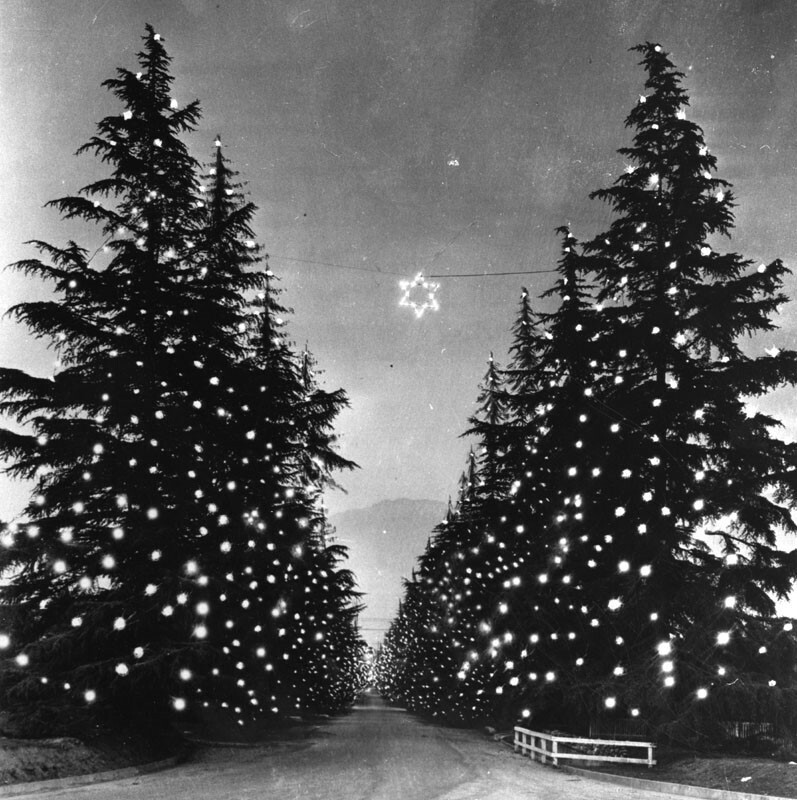 (1960)* - Photo caption reads: Take a ride to Santa Rosa Avenue in Altadena and you'll see one of the most beautiful Christmas tree lanes in the country. Bordering Deodar cedars that measure close to 100 feet in height are decorated with hundreds of colored lights. The display stretches for a length of five blocks along Santa Rosa Avenue from Altadena Drive to Woodbury Road. The lane has attracted thousands of visitors. So popular is the spectacular display that police have made the avenue a one-way street during the holidays. (ca. 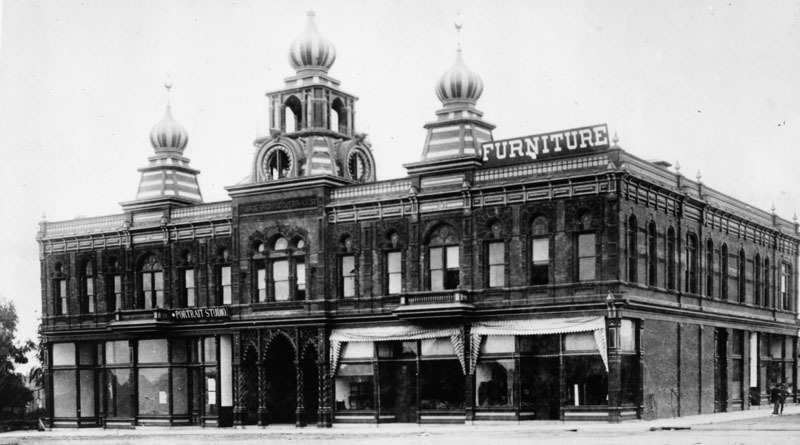 1888)* - View of Colorado Blvd. in Pasadena looking east from Marengo Ave. The church at right is First Methodist Church. The church at left is Pasadena Presbyterian Church, located on the northwest corner of Garfield Avenue and Colorado. The United Methodist Congregation purchased land on the “hill” at the southeast corner of Colorado and Marengo. 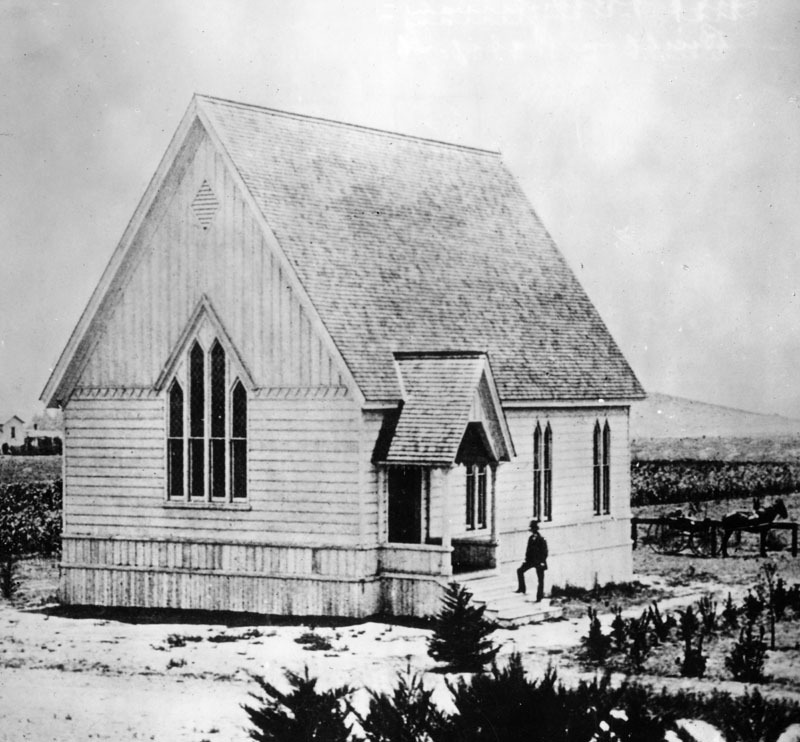 On March 20, 1887, a frame church with a 140-foot steeple and an adjacent eight-room parsonage were dedicated. (ca. 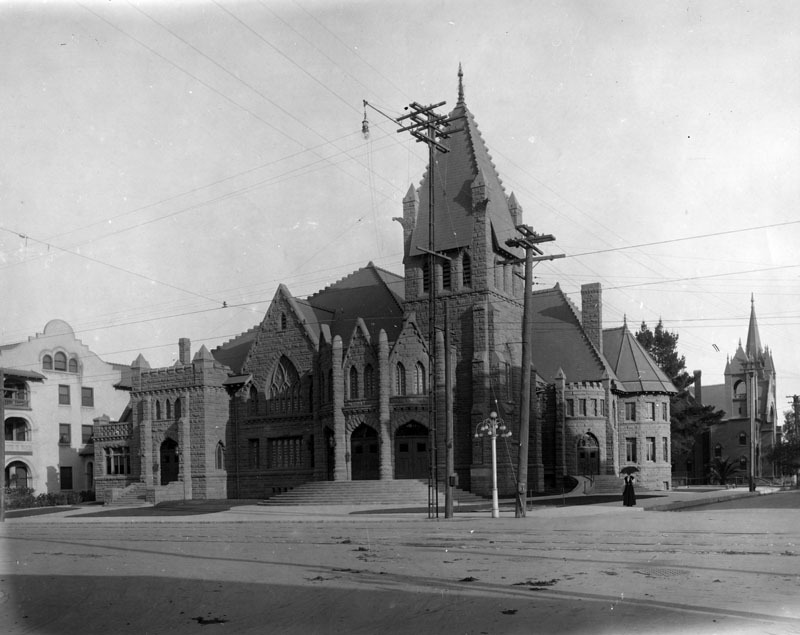 1901)* - Exterior view of First Methodist Episcopal Church at the southeast corner of Colorado Street and Marengo Avenue, in Pasadena; architect, John C. Austin. Portion of La Geralda Hotel shows at the left. After the first church building was damaged by a tornado, a large stone church was built and dedicated on December 15, 1901 on the same corner. 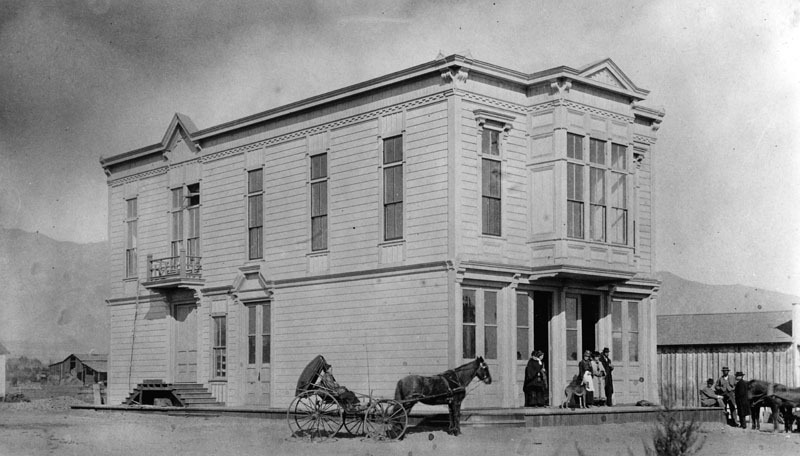 (1888)* - Exterior view of Garfield School located in Pasadena. A horse-drawn carriage is parked in front of the school. 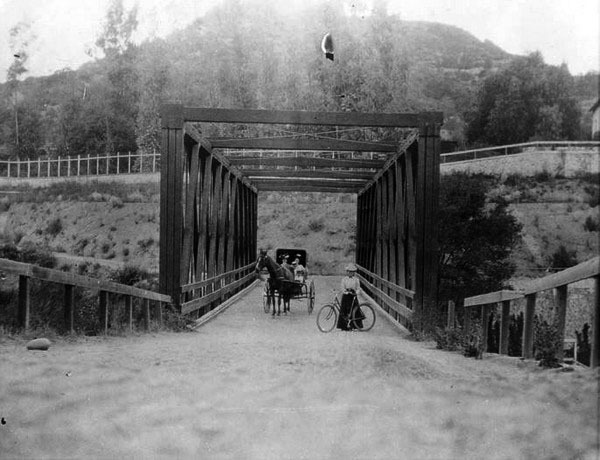 (1889)*#* - The Scoville Bridge traversed the stream of the Arroyo Seco but still required travelers to descend into the ravine and then climb the opposite bank after crossing. 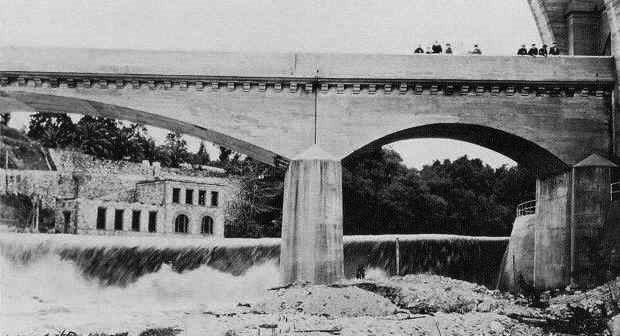 Pasadena was founded where it was exactly to take advantage of a reliable water supply, the Arroyo Seco ("Dry Gulch" in English). It was a reliable source of water in a rather dry environment. However the Arroyo Seco was also a problem, it was deep in a steep sided canyon. 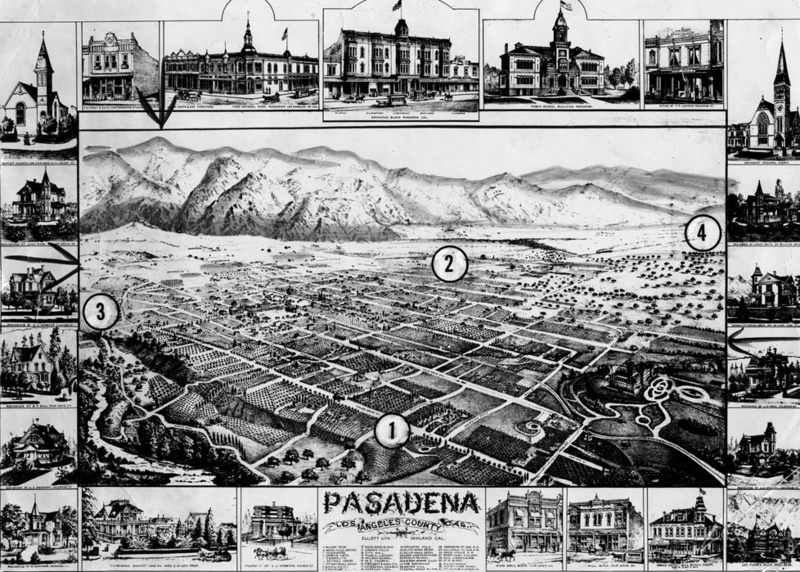 This meant that Pasadena was physically isolated from its western neighbors. Travelers would have to make long detours passable crossing north or south of Pasadena. (ca. 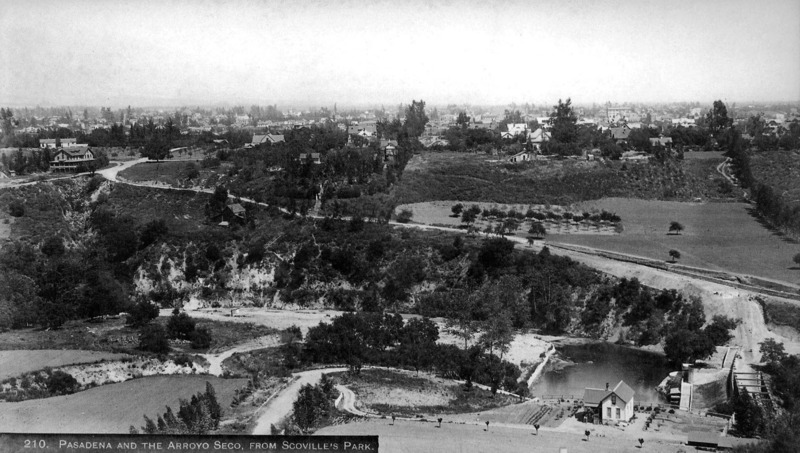 1890)++# - View looking east showing the Scoville Dam, Scoville Bridge, and City of Pasadena beyond. The dam and bridge are in the lower right corner. (ca. 1905)++# - View of the Scoville Bridge, Dam and surrounding area. Photograph by A.C. Vroman. 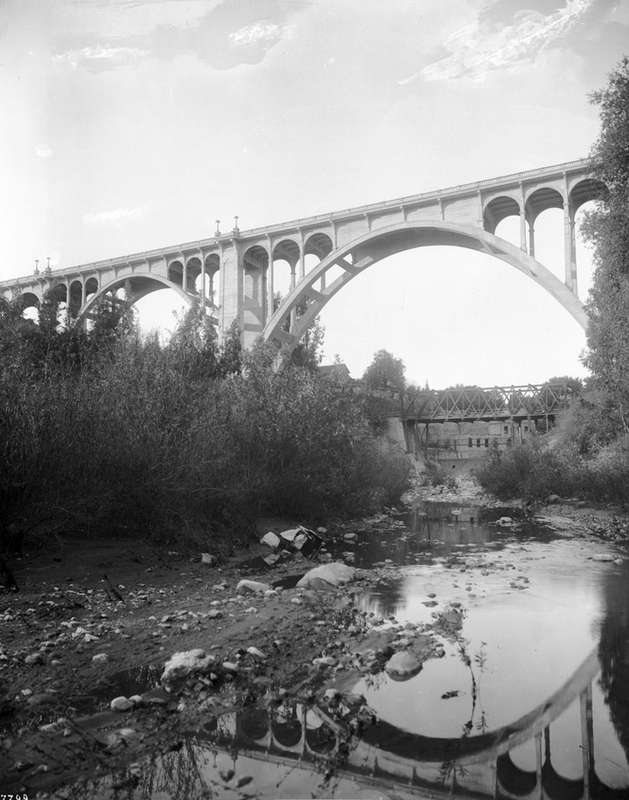 The dam and bridge were built 1887-1903; Note: S. Arroyo Blvd. is in the foreground. (ca. 1905)++# – Closer view showing the Scoville Bridge, Dam and Pump House. (ca. 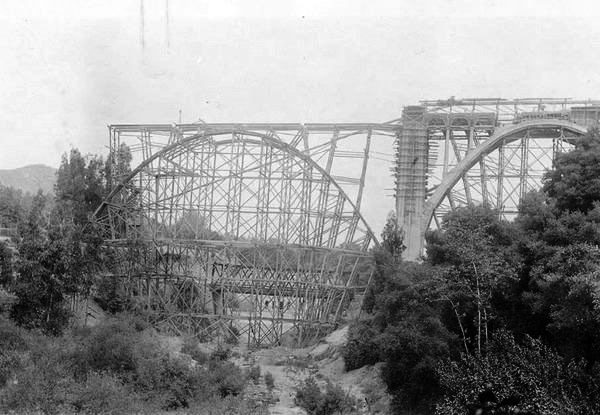 1913)*#* - A view of the Scoville Bridge next to the partially completed Colorado Street Bridge. Scoville Bridge was still in service when the much larger and grander Colorado Blvd. Bridge was built above it. (1913)++# - View looking north at the Colorado St. Bridge under construction with the Scoville Bridge behind. (1914)^ - View looking up towards the newly completed Colorado Street Bridge. In the distance stands the Scoville Bridge shortly before a flood brought it down. 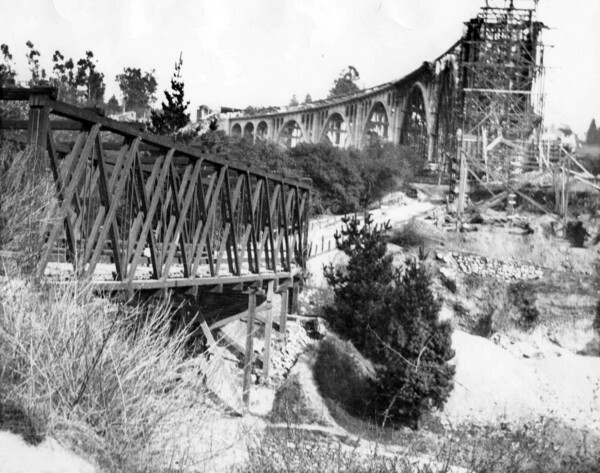 Click HERE to see more early views of the Colorado Street Bridge. (ca. 1920)++# - View of the Parker-Mayberry Bridge built to replace the Scoville Bridge. The Colorado Street Bridge is seen at upper-right. 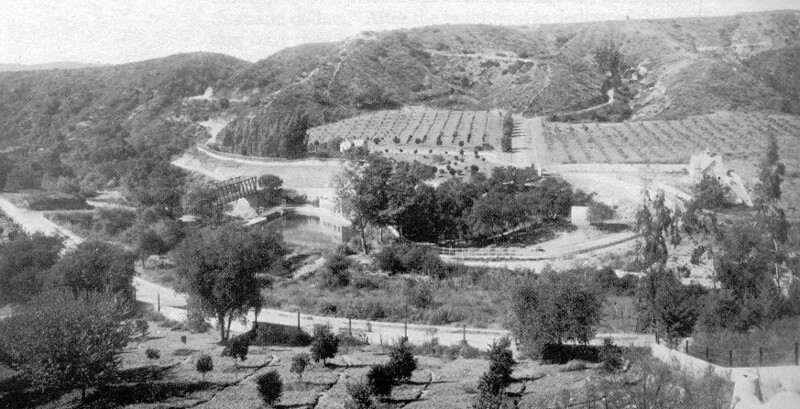 The structure at left rear is the pump house which contained the equipment necessary to pump water from the Scoville Dam up to the Orange Groves on the east side of the Arroyo. (ca. 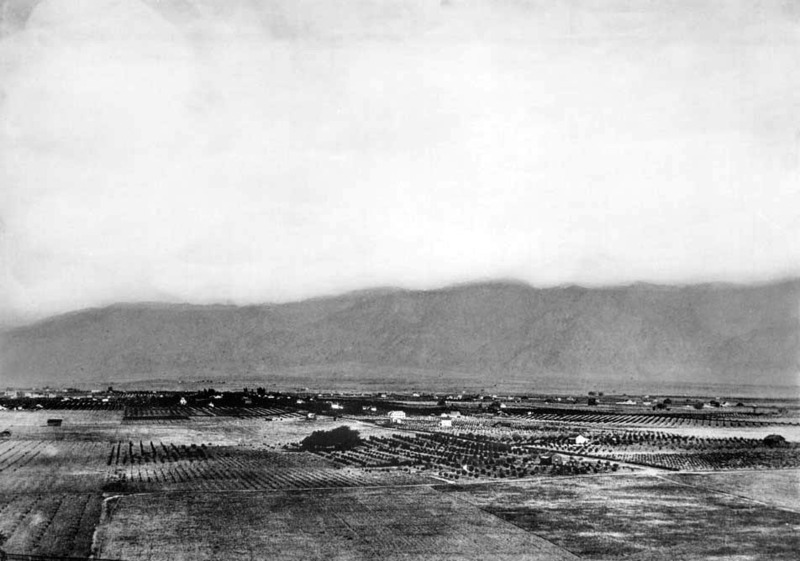 1889)^ - Panoramic view of Pasadena looking north from Raymond Hill. Sparse houses are separated by burgeoning agricultural fields. A house with a windmill-style weathervane stands at center and the San Gabriel Mountains are visible in the background. (ca. 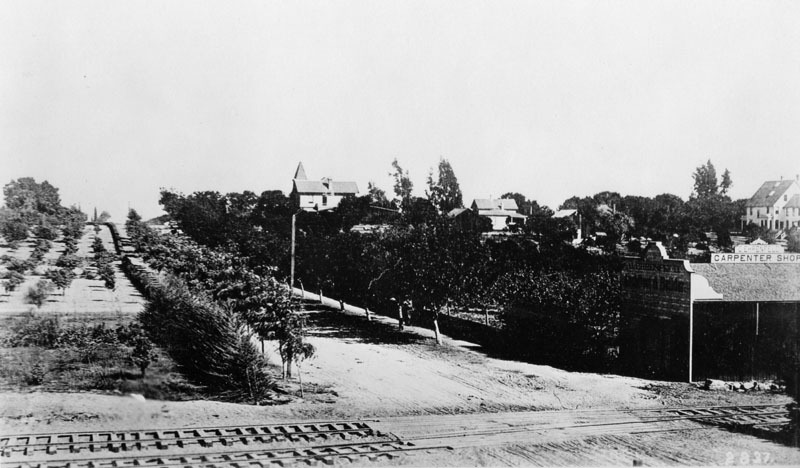 1889)*^* – Panoramic view of Pasadena looking south from the Methodist Episcopal Church on corner of Colorado St. & Marengo Ave. Orange groves are seen in the southwest with the Raymond Hotel on the hill in the far distance. A tree-lined dirt street and homes are in the foreground. (1889)#*- An elevated street view of Colorado facing east, taken from the Methodist Episcopal Church, at the corner of Colorado and Marengo. The street is residential, with houses set well back behind large lawns. "C.S. Frost & Sons Pasadena, Cal." is printed below the image. A typescript note attached to the top of the image reads "M.E. Church, corner of Colorado St. & Marengo Ave. looking east. 1889." (ca. 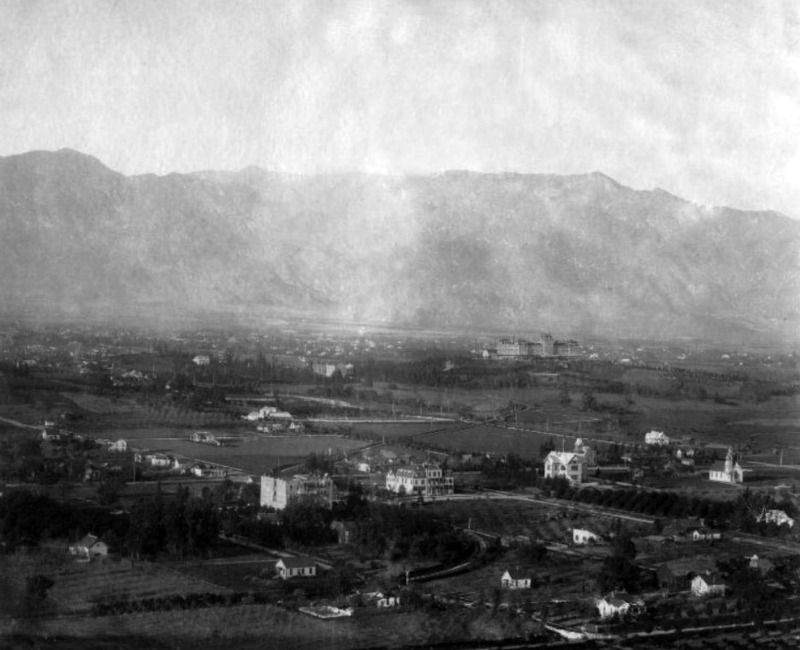 1890)^ - View of Pasadena looking north. 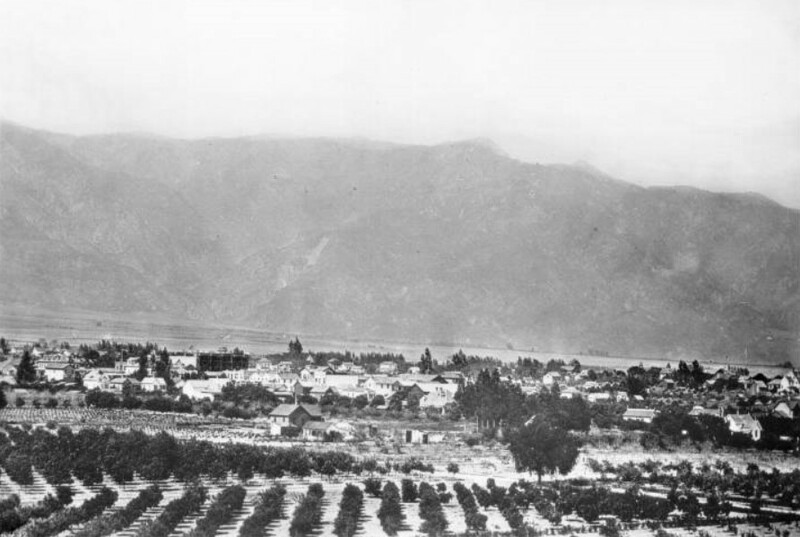 The San Gabriel Mountains loom in the background over the closely-situated houses and buildings of the city whose crop rows are interspersed between them. 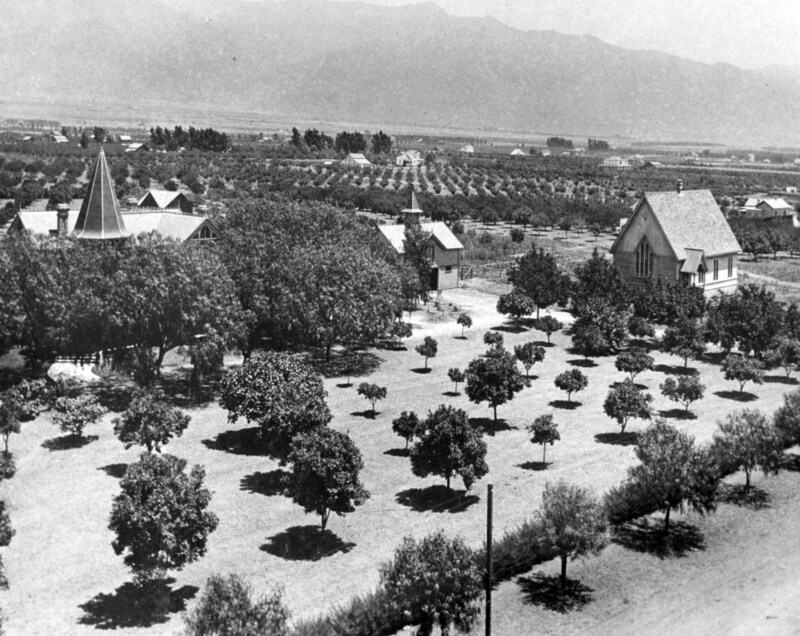 The bell tower of the school at Colorado Street and Fair Oaks Avenue is visible at center about halfway from the bottom of the frame A water tower and a larger building are visible on the horizon in the left distance along with the mountains across the entire background. 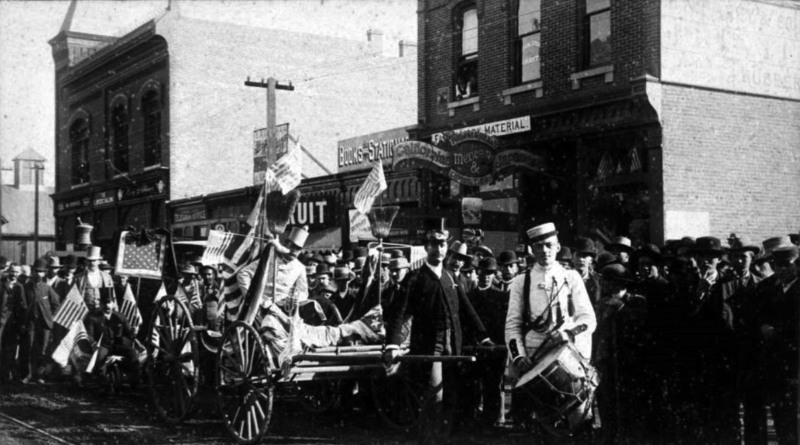 (1889)* - A brass band heads the funeral cortege of Owen Brown, third son of the famous abolitionist, John Brown. 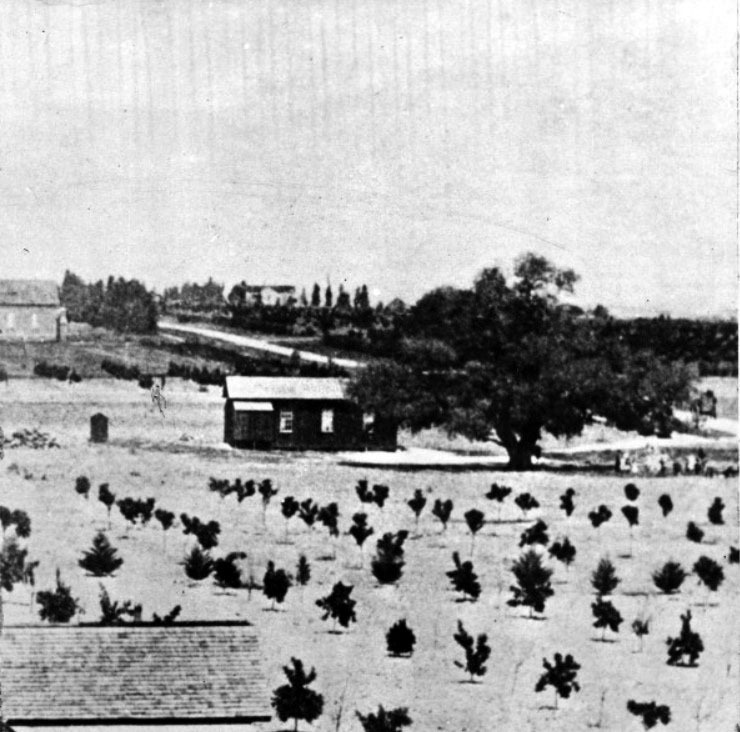 The photo was taken January 10, 1889, looking east from Raymond Avenue along Colorado Blvd. The hill is at Marengo Avenue and was sliced away when Colorado was leveled in later years. The City Meat Market is on the left. (ca. 1890)*#* - View of Colorado Boulevard, then named Colorado Street, looking east to Marengo Avenue. Horse-drawn wagons with displaying america flags appear to be in a parade (possibly 4th of July). 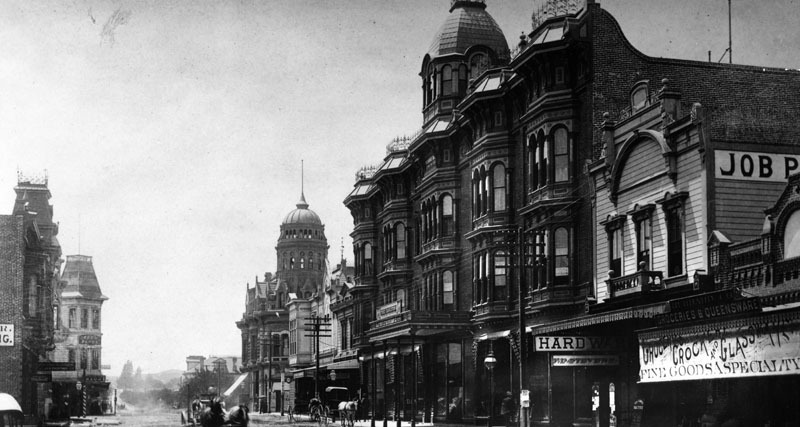 (1890)*^* – View showing a horse-drawn streetcar on Colorado Street where Oakland now intersects. (ca. 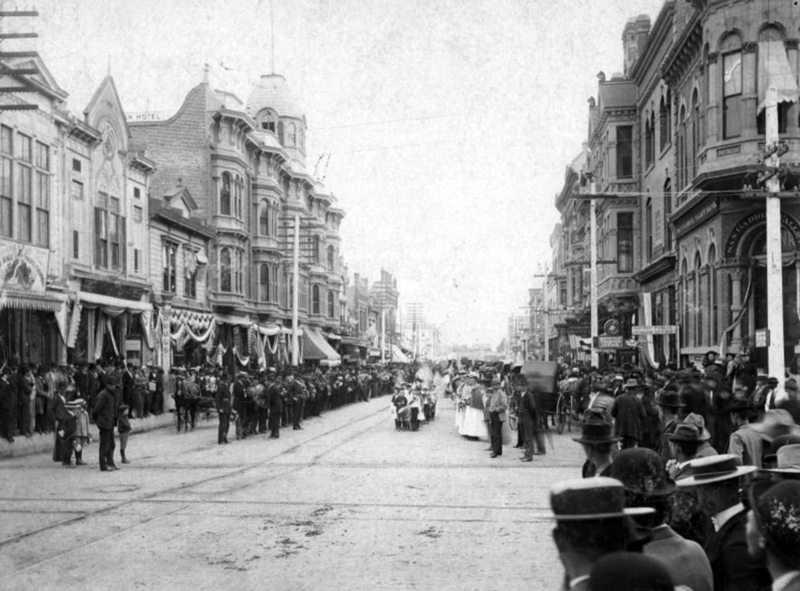 1887)*^* - Memorial Day Parade looking east on Colorado Street at Fair Oaks. 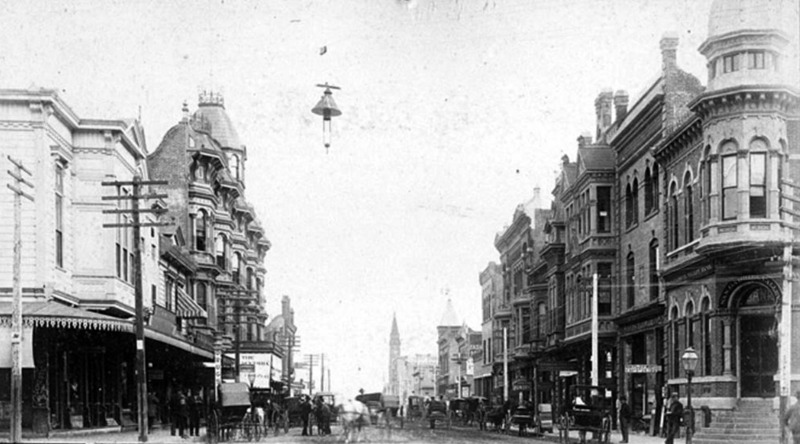 The Carlton Hotel (built in 1886) is seen on the left. San Gabriel Valley Bank is on the right. 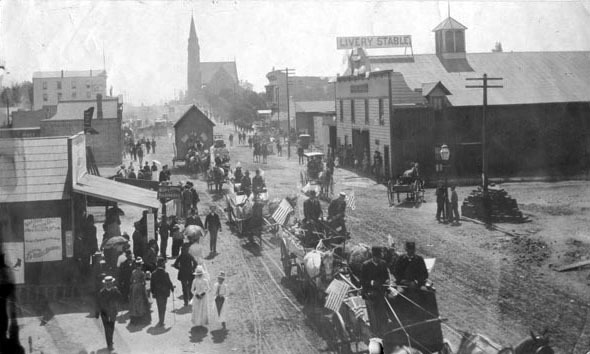 (1887)** – View looking east along Colorado Street from Fair Oaks Avenue showing horse-drawn wagons parked along the curb. The Carlton Hotel stands on the left. 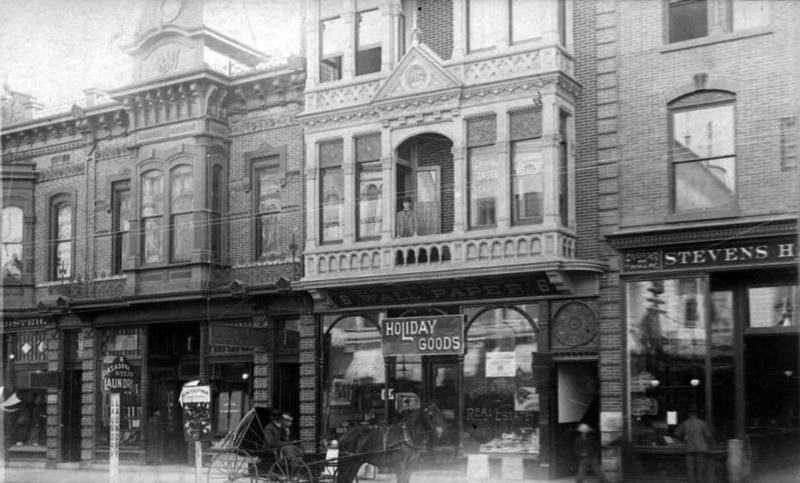 Colorado Street was lined with shops and restaurants, and parking could at times be an issue. In the 1880s, parking was still a matter of finding a place to leave one's horse and carriage. (ca. 1889)** - View of Fair Oaks Avenue looking south to Colorado. 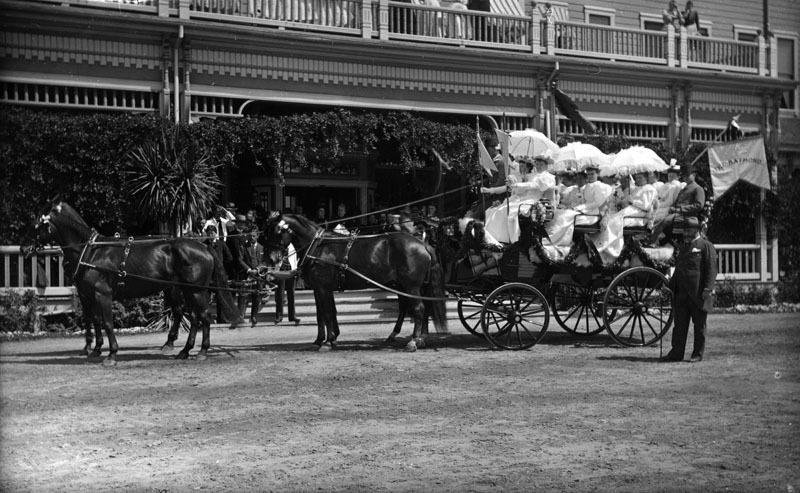 At center, a horse-drawn trolley moves toward the camera. In the background, a very congested Fair Oaks Avenue with scores of horse-drawn carriages on both sides of the street. Residents would come here for shopping, community gatherings, or entertainment. Despite Pasadena's relatively small population, this densely compacted commercial district had the excitement and activity found in much larger cities. 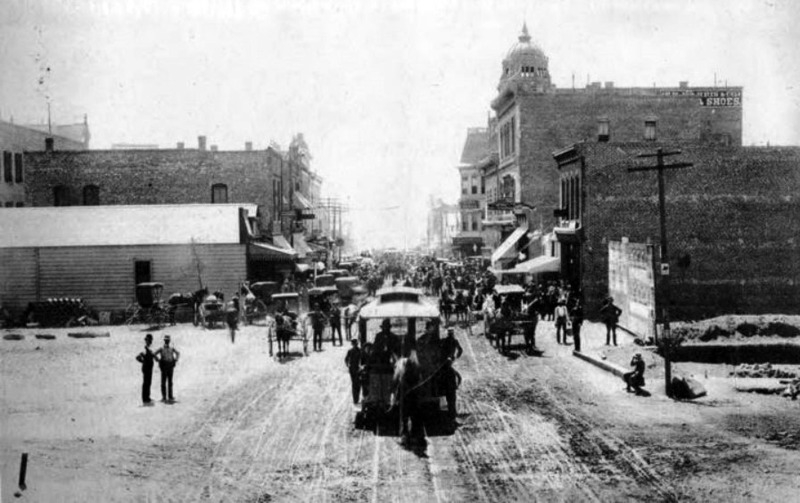 Colorado Street was frequently filled with horses, buggies, wagons, and pedestrians, along with horse-drawn streetcars in the late 1880s. (ca. 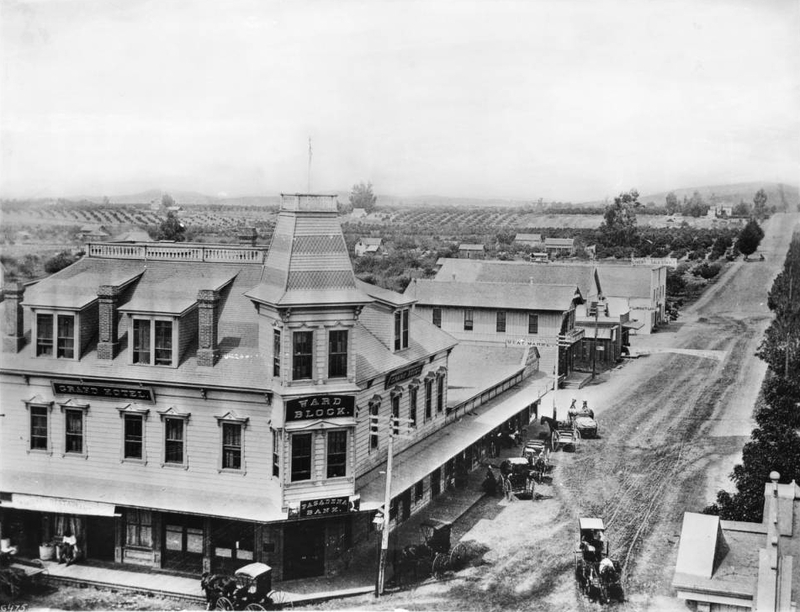 1889)** - This photo displays the buildings located on North Fair Oaks Avenue near the intersection of Fair Oaks and Colorado Boulevard in the year 1889. View shows a horse and buggy, several men and women, and a dog on the unpaved road in the foreground. 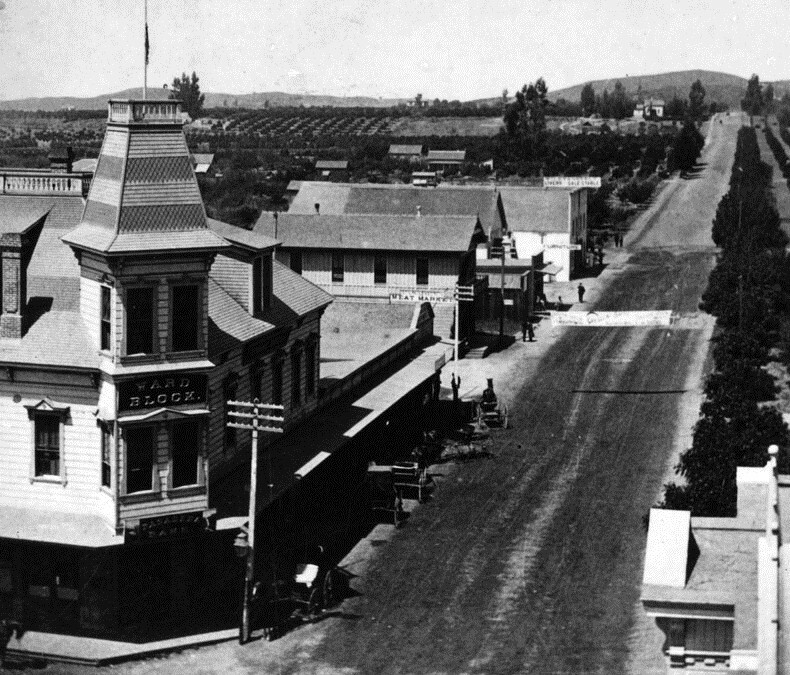 (1890)* - Colorado Street (now Boulevard) near Fair Oaks Avenue in 1890. The large building at center-right is the Carlton Hotel. (1890)* - View of Colorado and Fair Oaks Avenue in Pasadena, in 1890. Many storefronts can be seen on both sides of the street. On the left, there is: San Gabriel Valley Bank, a Drugs store and a Boots and Shoe store. On the right, there is: Oneill & Johnson Real Estate Insurance, a candy factory, Phillips Land & Real Estate Loans, and also the Ward Block building which includes the First National Bank. A trolley runs down the middle of the street and shares the road with horse-drawn vehicles. (ca. 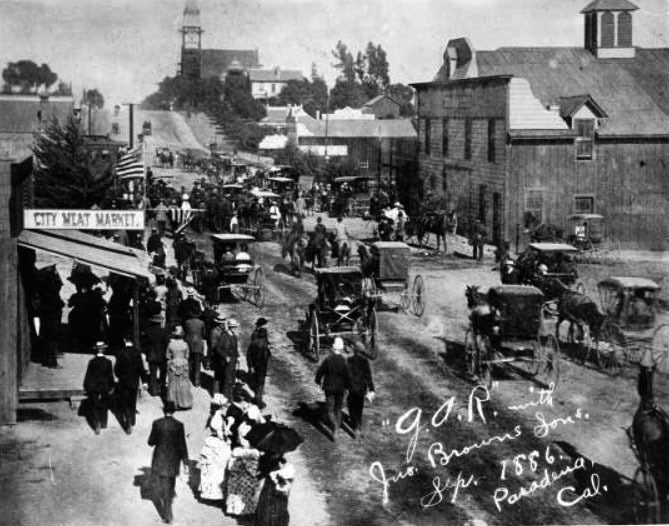 1890)*^* - Photo showing a vibrant day on Colorado Street (later Boulevard) looking east from Fair Oaks. The San Gabriel Valley Bank is at right (S/E corner). A streetlight hangs over the middle of the intersection. (ca. 1890)** – View looking at the south side of Colorado Street just east of Fair Oaks showing a series of connected buildings, also referred to as the Fish Block, covering 24-28 E. Colorado. Signs include: PASADENA STEAM LAUNDRY, HOLIDAY GOODS, and WOOD & BANBURY REAL ESTATE. A horse-drawn carriage with passengers is parked in the foreground of the photo. (1890s)** - Exterior view of the Williams Hall Parlor Theatre, Pasadena's first theatre. It was located on the Exchange Block at Colorado. On the left side of the building we're looking north up Fair Oaks Ave.
(ca. 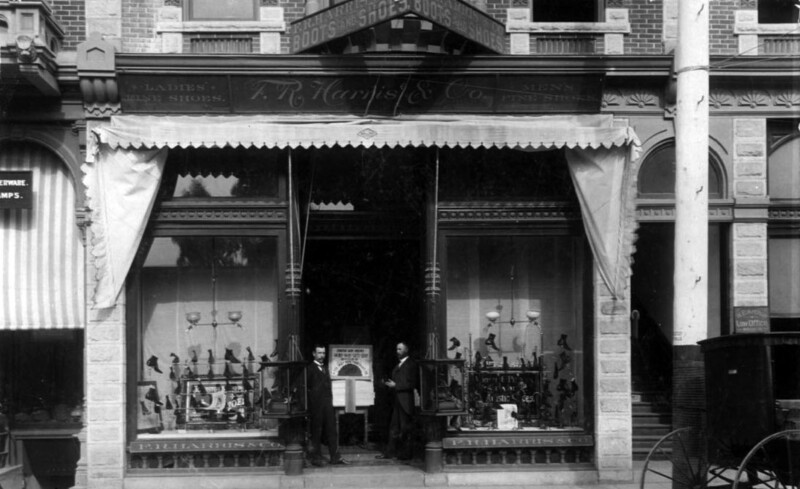 1892)** – Two men stand in the entryway of the Harris Shoe Store located on the north side of Colorado, near Raymond. (ca. 1888)^#^^ – South Pasadena Postcard showing Opera House Building and Post Office. 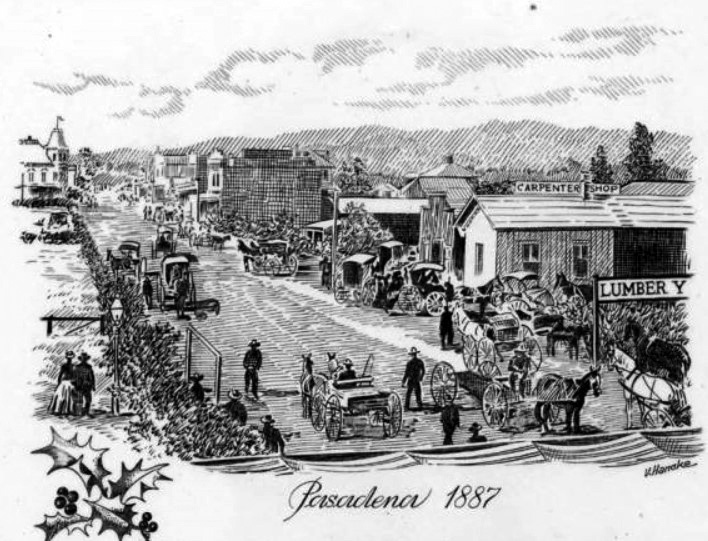 (1889)*^* - Pasadena has ice for sale on July 4, 1889. Happy 4th of July! 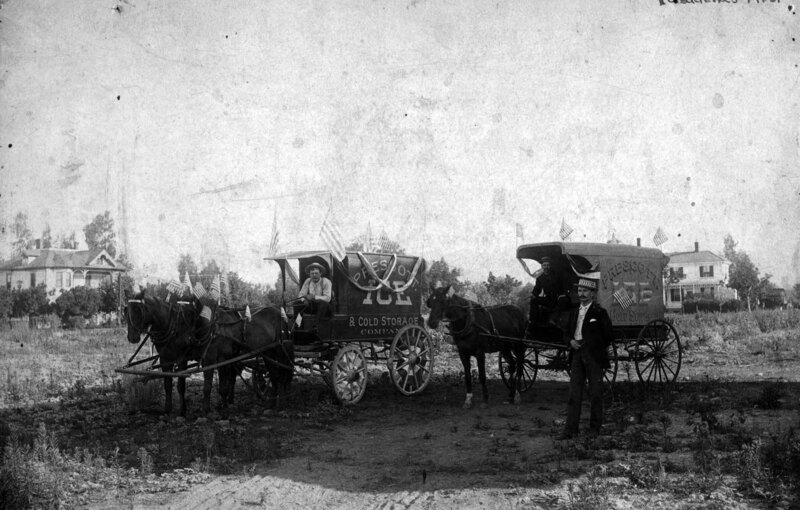 Caption reads “First Ice Wagons in Pasadena”. 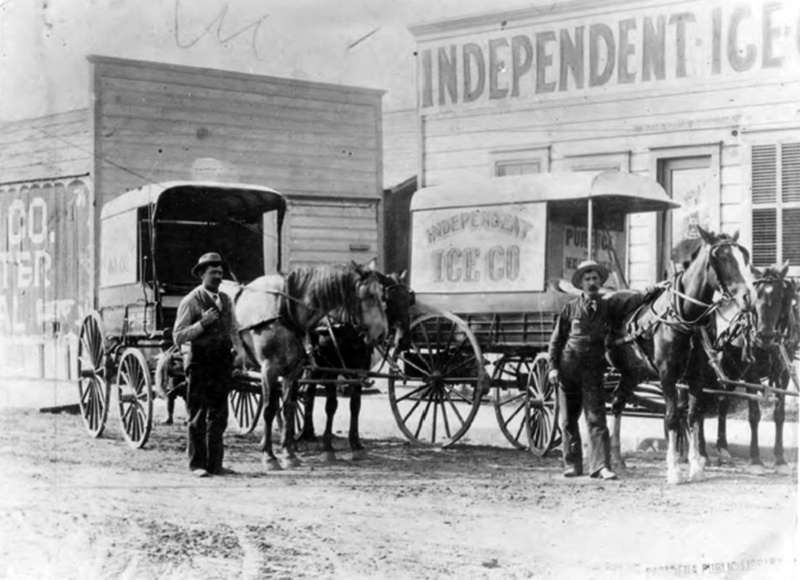 Founded in 1889 by J.C. Rust, the Independent Ice Company initially sold 'natural ice' shipped from Truckee. (ca. 1890)** - View showing the Independent Ice Company located on the northwest corner of Union and Raymond. In the photo J.C. Rust is on the left and his younger brother, S.L. Rust, is on the right. (1889)* - Exterior view of the Pasadena Grand Opera House. A sign reading 'Furniture' sits on the right side of the roof line. The Grand Opera House was built in 1888 by the Grand Opera House Company and opened on February 13, 1889. The new opera company was formed a year earlier by E. C. Webster, Senator L. J. Rose, F. M. Ward, and Roscoe Thomas. The building was done in Moorish architecture, a style popular of the times. Ornately decorated with bronze and guilt, the opera house offered beauty rarely seen before. The very best of carpenters, artisans, and mechanical specialists were brought in to spare no expense in providing Pasadena with a world class opera house. Seating capacity was 1500 of which 900 seats were on the main floor and 600 were in the balcony. The main floor seats were on tiers that raised 18 inches for each row affording all the best of views. The folding back chairs were not only cushioned but held hat and umbrella racks. 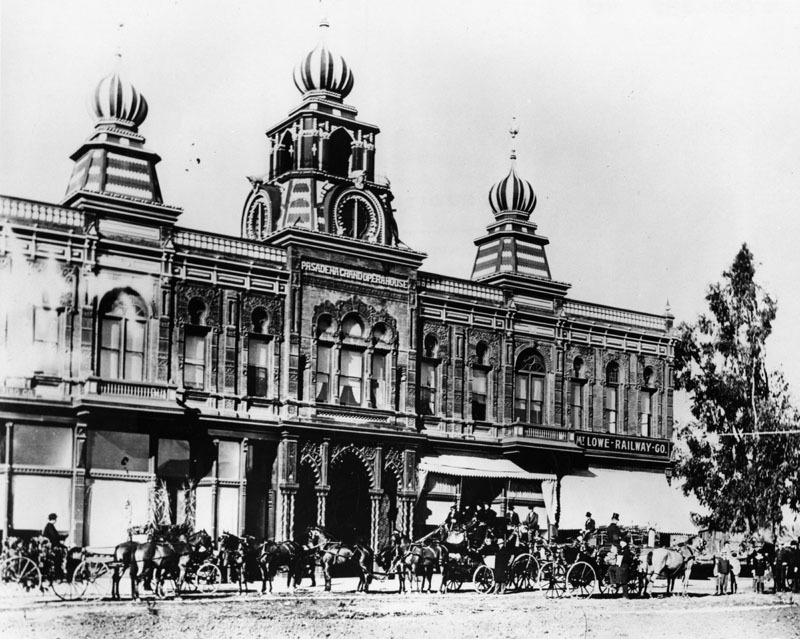 (1891)* - View of the ornate facade of the Pasadena Grand Opera House with horses and carriages in front. A sign reading: "Mt. Lowe Railway Co." is seen on the right. In mid-1891 Thaddeus Lowe successfully negotiated with Senator Rose and the Ward brothers for the purchase of the Grand Opera House at a greatly reduced bankruptcy price. Quickly Lowe set out remodeling the Opera House to accommodate his various holdings. Engineer David Macpherson had offices up on the second floor and drafting rooms were set up for his mountain railway. Lowe had an office on the first floor and planned to sell tickets from it for his scenic railroad. Financial rough times, however, came for Thaddeus Lowe. The scenic Mt Lowe railroad was taking much more money than expected and Lowe defaulted on the mortgage loan of his Orange Grove home and the Grand Opera House. The properties were foreclosed on and sold at auction. Click HERE to see more in Early Views of Mt. 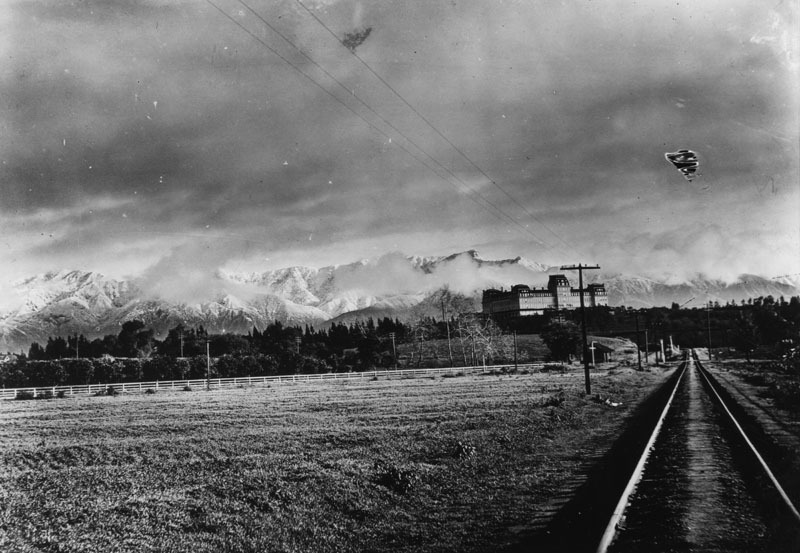 Lowe Railway. (ca. 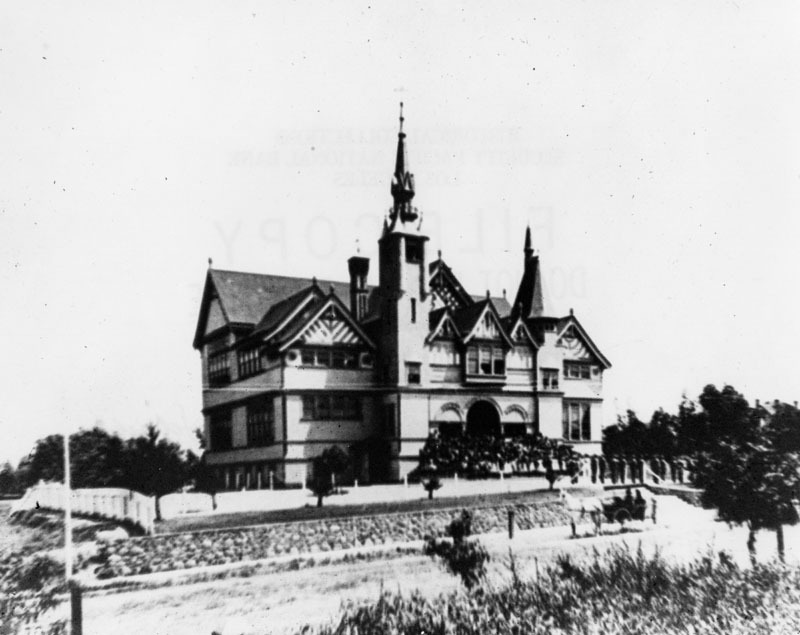 1890)*#*^ - View of Professor Thaddeus S.C. Lowe's home at 955 South Orange Grove in Pasadena. The multi-story stone and clapboard house has a multi-gabled roof, a large porch, dormers, chimneys, and an observatory within a domed tower. Stone entrance pillars and a manicured gardens front the house. (ca. 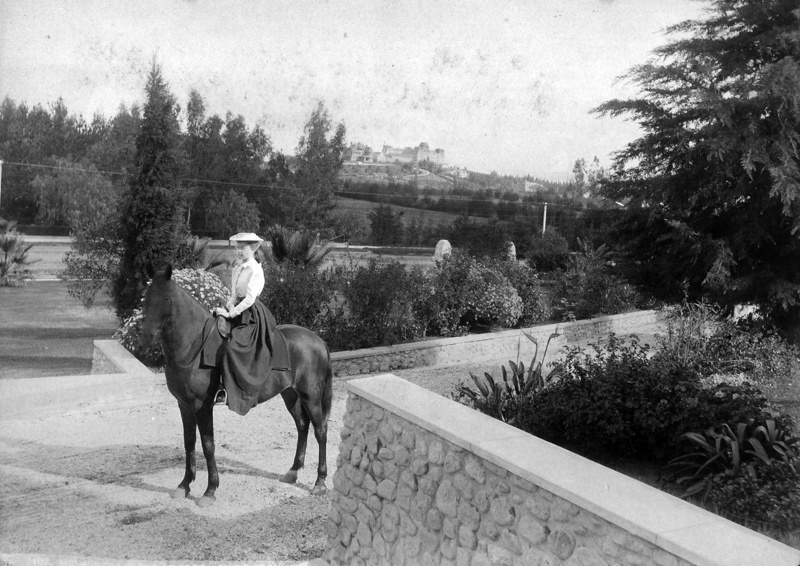 1890)++^ – View of a woman on horseback on the grounds of Professor T.S.C. Lowe's Pasadena Estate with the Raymond Hotel seen in the distance. (ca. 1893)++# – View showing T.S.C. Lowe and party at Sphinx Rock in the San Gabriel Mountains. 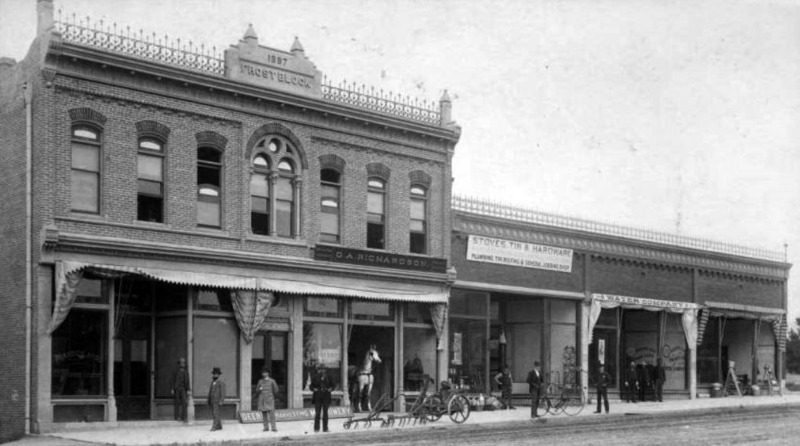 (1888)** - View of the Painter Hotel located on the north side of Washington Street between Fair Oaks and Raymond. Built by J. H. Painter on land that he owned. (ca. 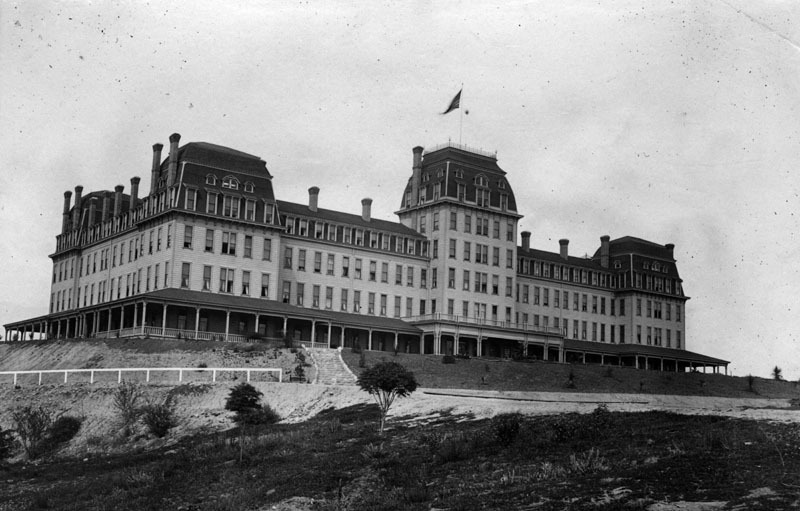 1890)* - Exterior view of the Painter Hotel. 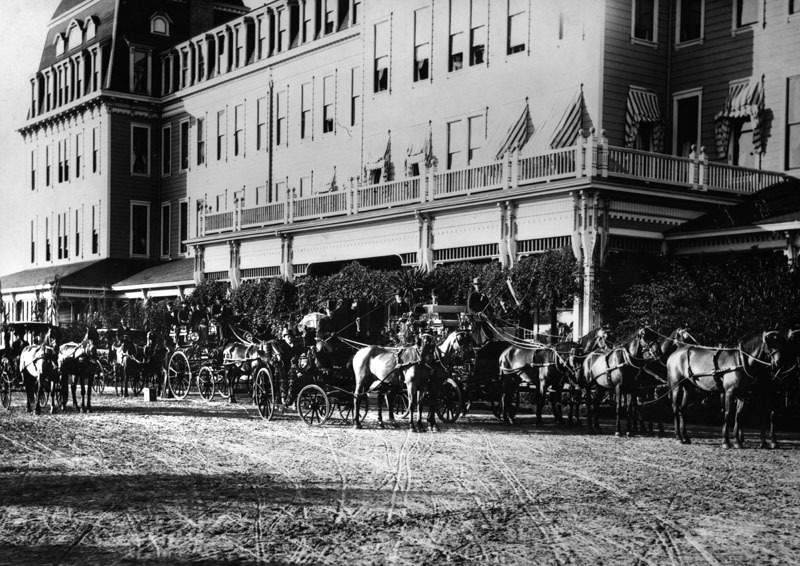 A horse-drawn carriage and trolley can be seen in front of the hotel on Washington Street. (ca. 1890)* - View showing the the Painter Hotel. A horse-drawn carriage is front of the hotel on Washington Street and two horse-drawn trolleys are seen in the foreground. (ca. 1890s)* - Exterior view of La Pintoresca Hotel (formerly Painter Hotel). Palm trees and an orchard can be seen on the grounds in front of the hotel. Note how the hotel has been enlarged (see previous photo). (ca. 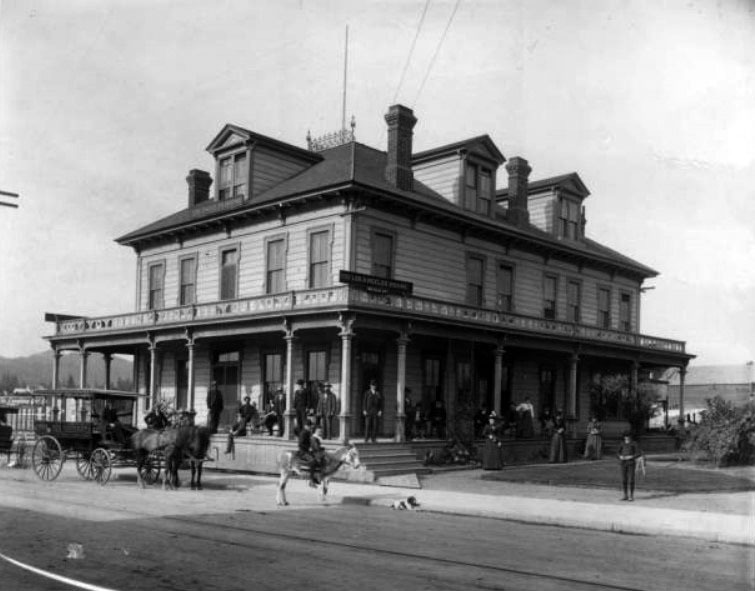 1895)^^ - View of the La Pintoresca Hotel, located on the northeast corner of Fair Oaks Avenue and Washington Street. The hotel stands at about four-stories tall. It features a conic-capped tower (at right), a conic-shaped corner (center), many windows and an immaculate yard. Trees, palms and bushes populate the yard. The San Gabriel Mountains are visible in the distance. "Pintoresca" is Spanish for the English word "picturesque". (ca. 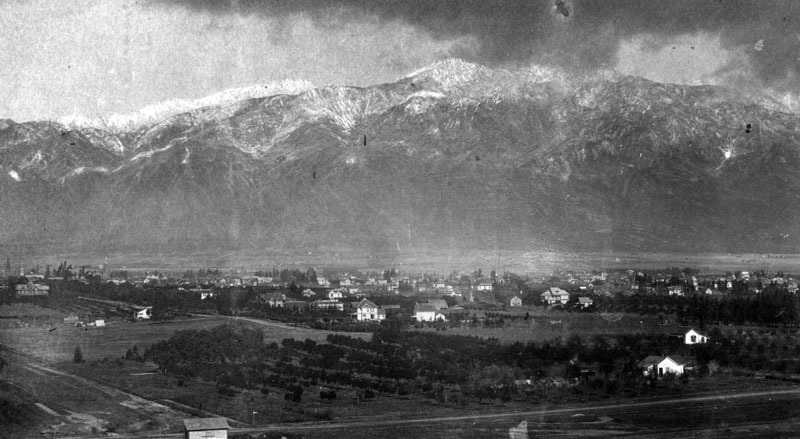 1895)++# – View looking north along Fair Oaks Avenue showing the La Pintoresca Hotel with the snow-covered San Gabriel Mountains in the background. You can barely make out Echo Mt. and Alpine Division ascending from it at right. 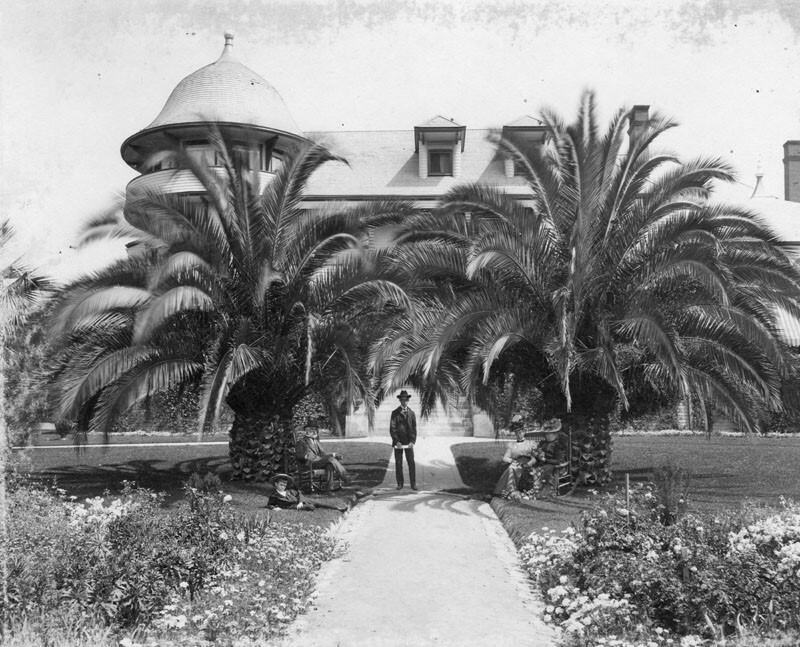 (1897)** - Close-up view of the La Pintoresca Hotel showing a row of palm trees in front of the hotel. 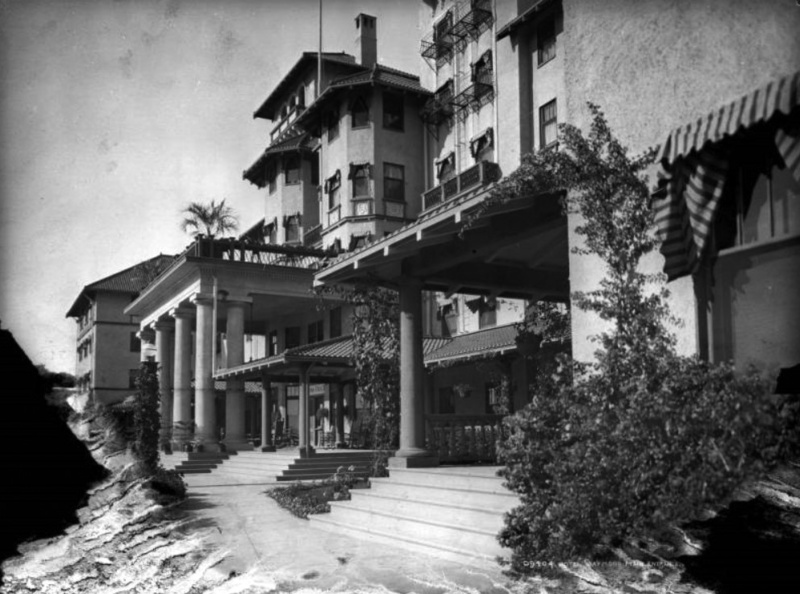 Over the years there were substantial additions to La Pintoresca Hotel, making it one of the largest hotels in Pasadena. (ca. 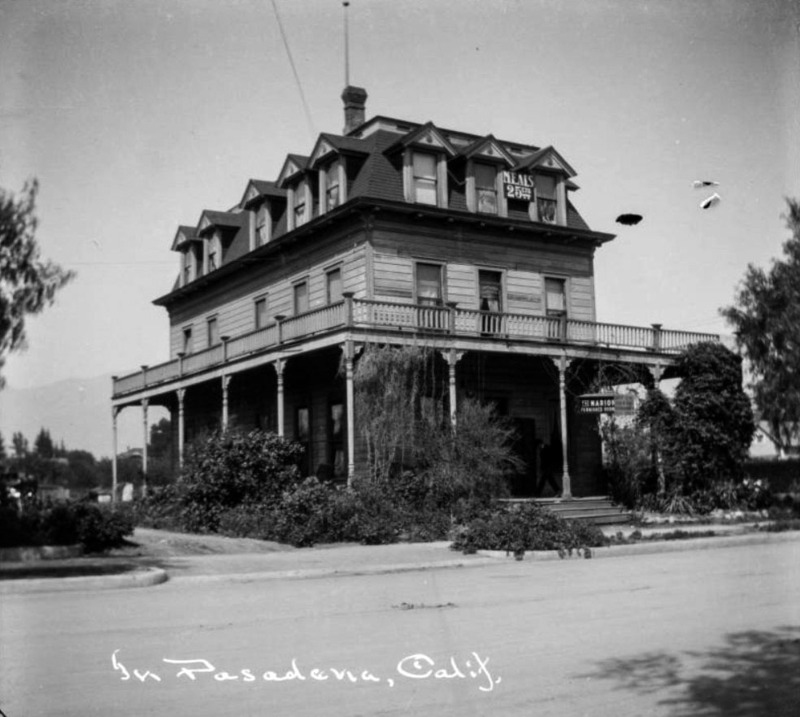 1910)#* – Postcard view showing the La Pintoresca Hotel (formerly the Painter Hotel) on the corner of Fair Oaks Avenue and Washington Boulevard. This view shows the front facing onto Fair Oaks Avenue, with palm trees at the sidewalk and foliage around the porch. Title and date devised based on accompanying note that read: "Raymond Avenue. Nov. 12, 1888." This could possibly be related to an election, but the scene is not identified beyond the accompanying note. "Jarvis' Gallery, 29 E. Colorado St., Pasadena, Cal...."--text printed on verso. 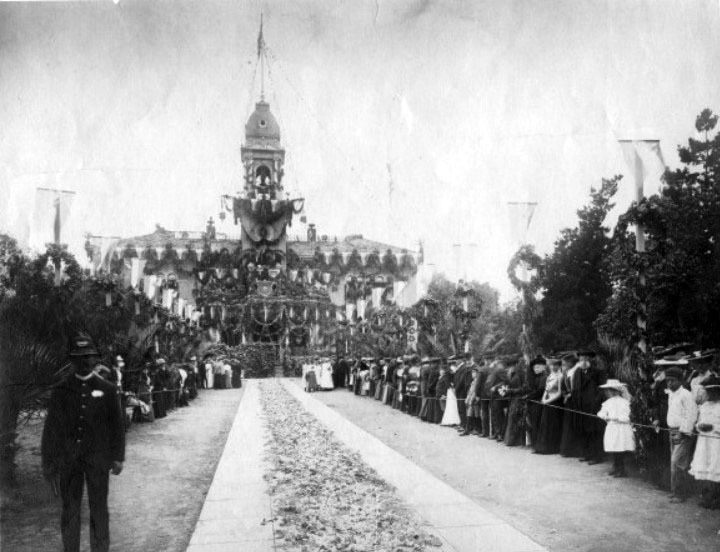 (1891)* - Decoration Day (now Memorial Day) parade in Pasadena, 1891. Memorial Day, which is observed every year on the last Monday of May, originated as Decoration Day after the American Civil War in 1868, when the Grand Army of the Republic, an organization of Union veterans founded in Decatur, Illinois, established it as a time for the nation to decorate the graves of the Union war dead with flowers. By the 20th century, competing Union and Confederate holiday traditions, celebrated on different days, had merged, and Memorial Day eventually extended to honor all Americans who died while in the military service. It marks the start of the unofficial summer vacation season, while Labor Day marks its end. (ca. 1890s)* - A flag-carrying marching group on Raymond Avenue, Pasadena, circa the 1890s. View is toward the north. William H. Staats Co. is on the left. (1891)** - View of a group of young men in front of the Classical School for Boys, located at 59 S. Euclid Ave.
(1890s)^#^^ - View of the Raymond Hotel from its West Entrance. Wagon-wheel marks can be seen on the dirt road. (ca. 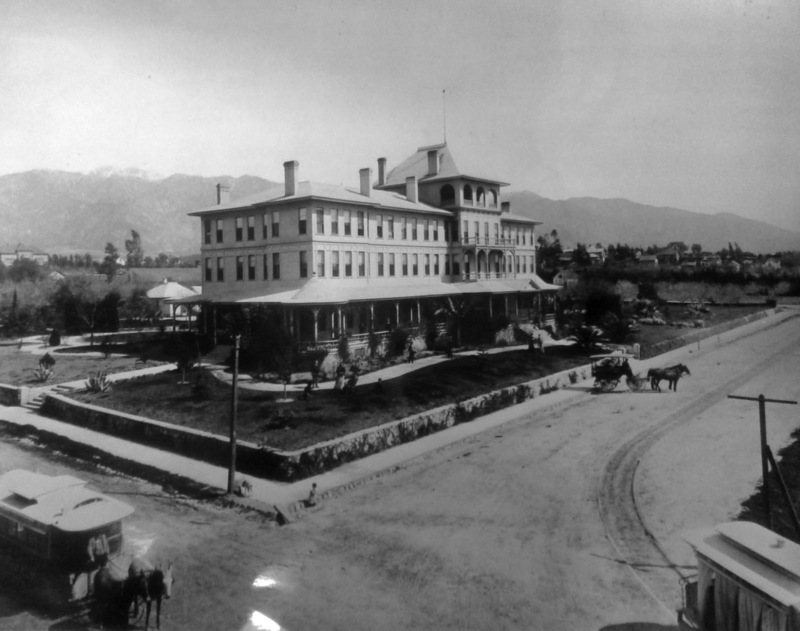 1890)* - The Raymond Hotel sits atop a hill and offers a view of the snow-covered San Gabriel Mountains that are partially obscured by clouds. Railroad tracks run from the foreground into the distance. The Raymond Hotel guests invariably arrived by train, the mainline Santa Fe which stopped at Raymond Station at the bottom of the hill. Many had private cars that would park on the side spur near the station. All guests were ferried by a horse-drawn bus to the hotel at the top of the hill. 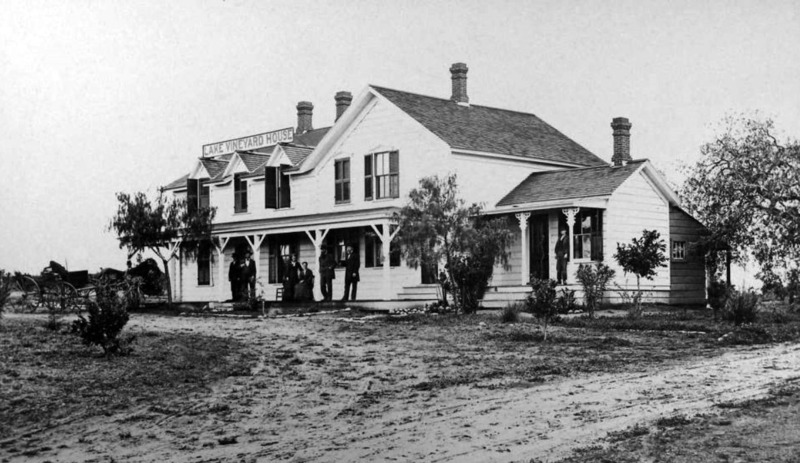 (1890)* - Exterior view of the Raymond Station in South Pasadena. 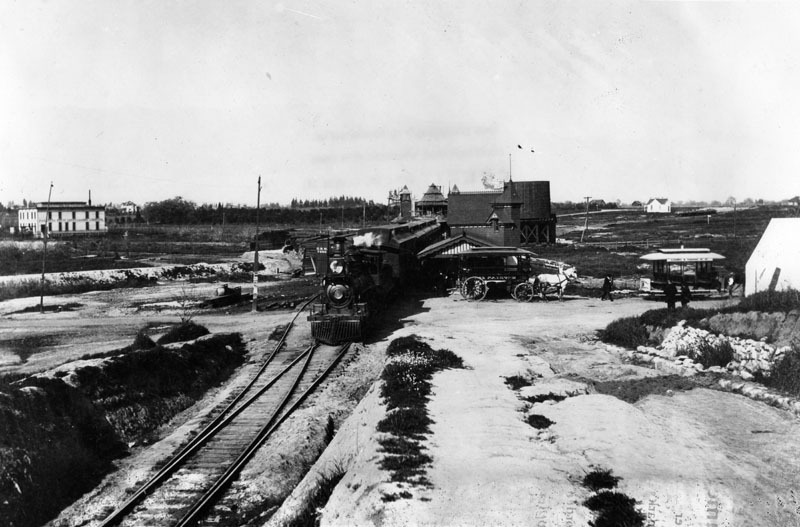 A locomotive with cars sits adjacent to the station, while a horse-drawn carriage and trolley stand ready to take passengers to the Raymond Hotel. (ca. 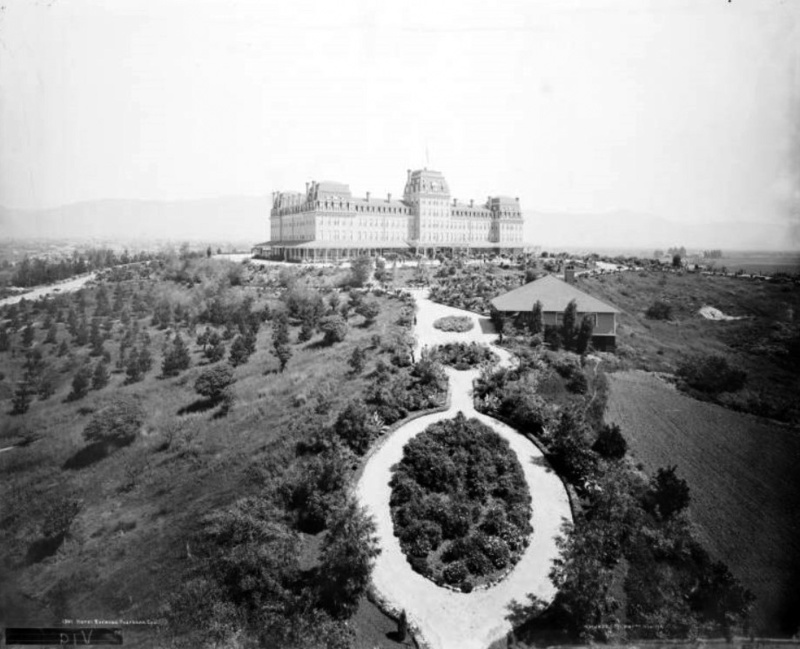 1890)* - View of the Raymond Hotel looking across the grounds at the western facade. 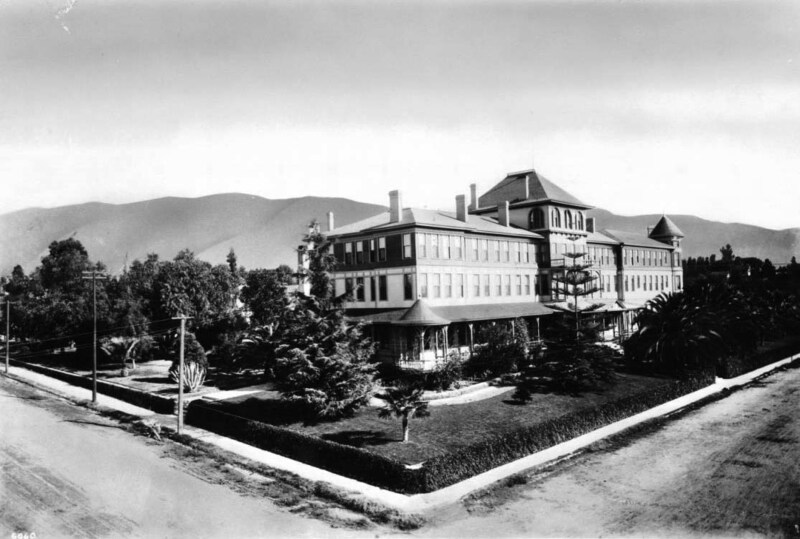 Located in South Pasadena, it was the first major resort hotel of the San Gabriel Valley. (ca. 1890)* - Two women and a young man sit astride donkeys as they ride down the dirt road, accompanied by two men, that leads from the Raymond Hotel. The women sit side-saddle. (ca. 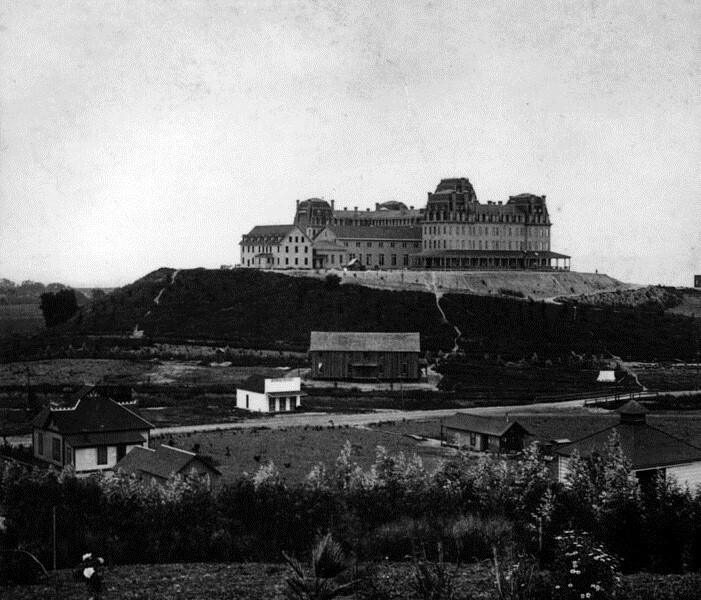 1890)* - View of the Raymond Hotel looking across the grounds at the western facade. A small building stands next to a path on the landscape grounds. Several horse-drawn carriages and stages are parked in front of the hotel. A portico runs around the building. (1890s)* - Long boxes of cut flowers lay on a horse-drawn cart with "The Raymond" printed on the side. The horse and driver have stopped at the entrance to the Raymond Hotel. Spectators watch the unloading from the shaded portico. (ca. 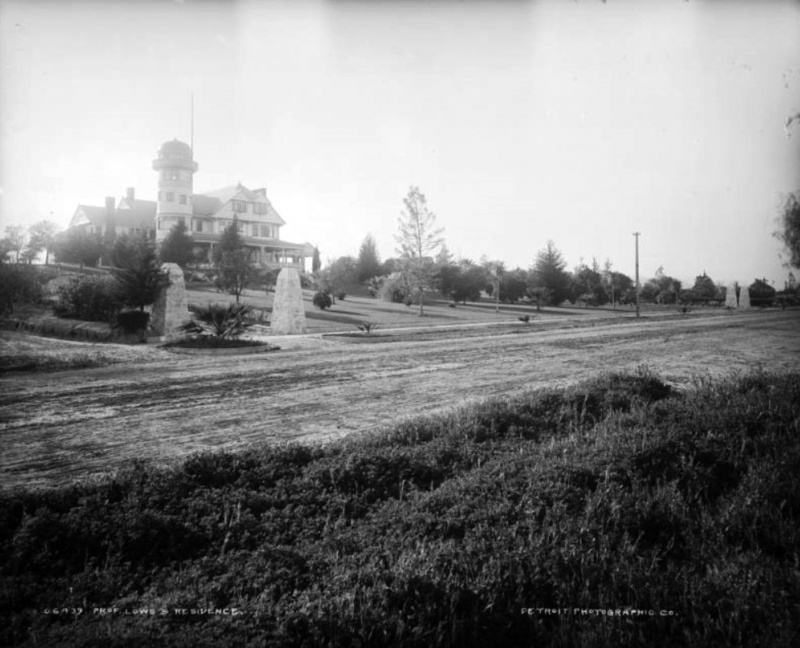 1890s)* - View of tally-ho in front of the Raymond Hotel in South Pasadena with Colonel Marshall C. Wentworth standing at right. (ca. 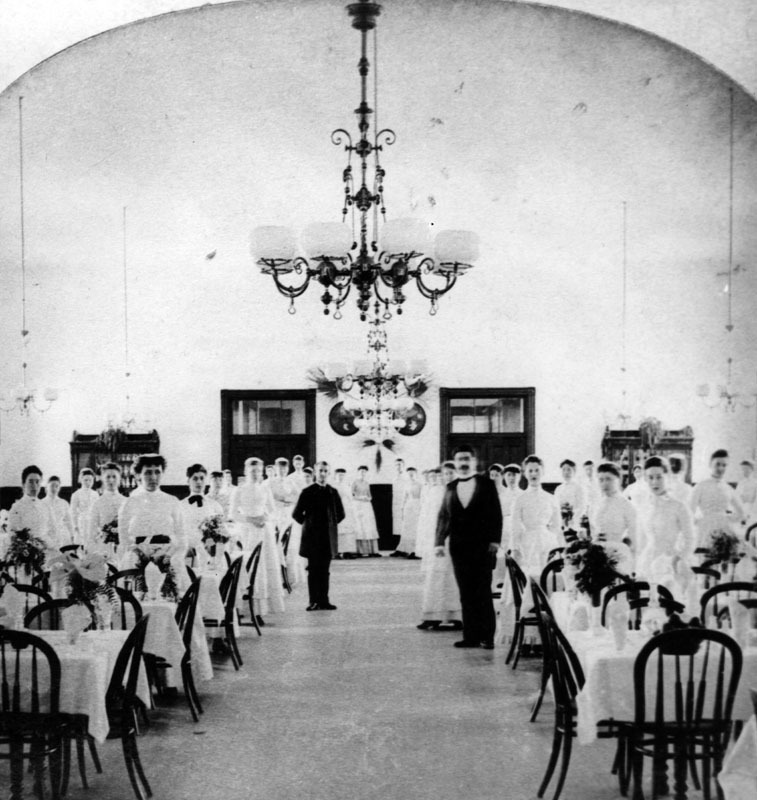 1890)* - The staff of the dining hall in the Raymond Hotel pose in their uniforms as they stand around the tables ready for the hotel's guests. (ca. 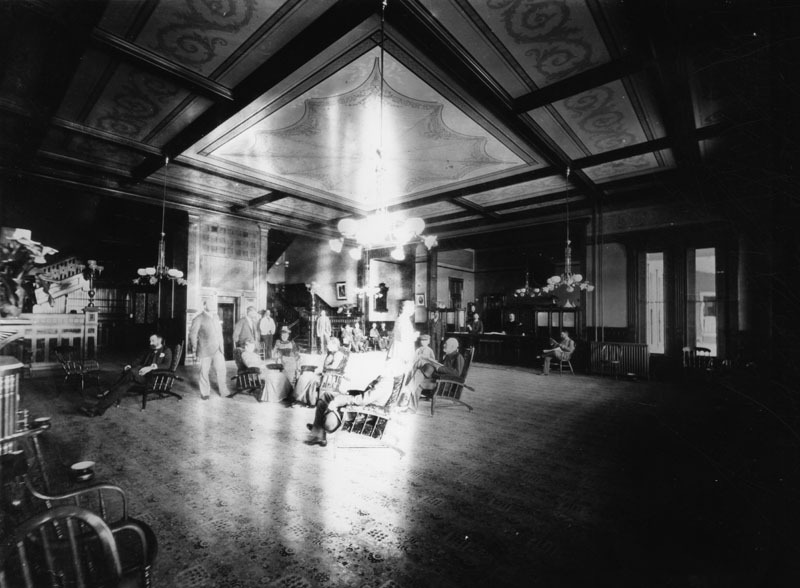 1890)* - A group of people sit under a hanging light fixture in the luxurious and spacious lobby of the Raymond Hotel. The beamed ceiling is decorated with painted motifs. An elevator is directly behind the seated group and large staircases behind the elevator and on both sides lead to the upper floors. The reception desk is to the left of the front doors. The floor is carpeted and spittoons stand close to several chairs. (ca. 1890s)* - Mount Lowe - Tally Ho carriages parked in front of the Raymond Hotel, in Pasadena. 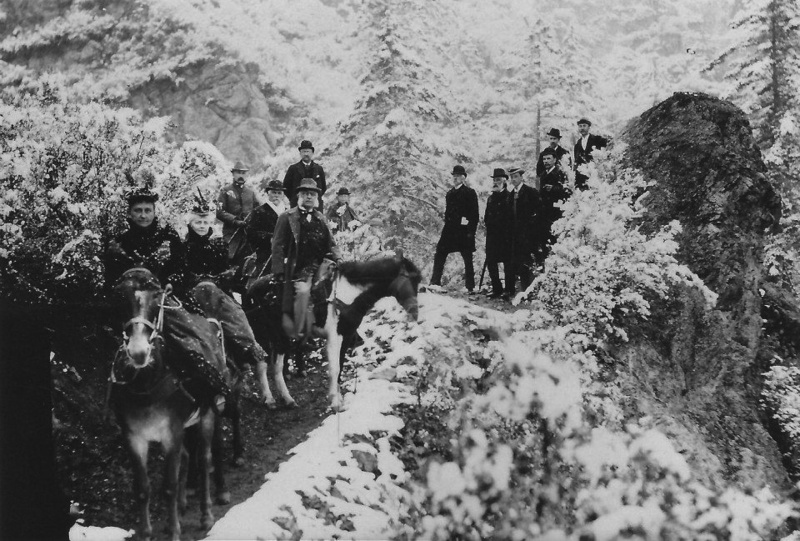 Carriages take hotel guests to Mount Lowe and back. (ca. 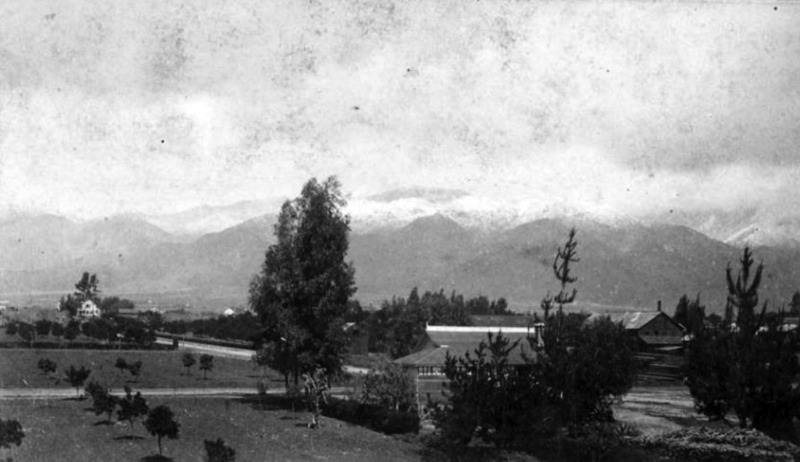 1890)* - View looking northeast from the Raymond Hotel showing the landscape between the hotel and the San Gabriel Mountains. (ca. 1890)#* - View looking south from the Raymond Hotel toward Oneanta Park. (ca. 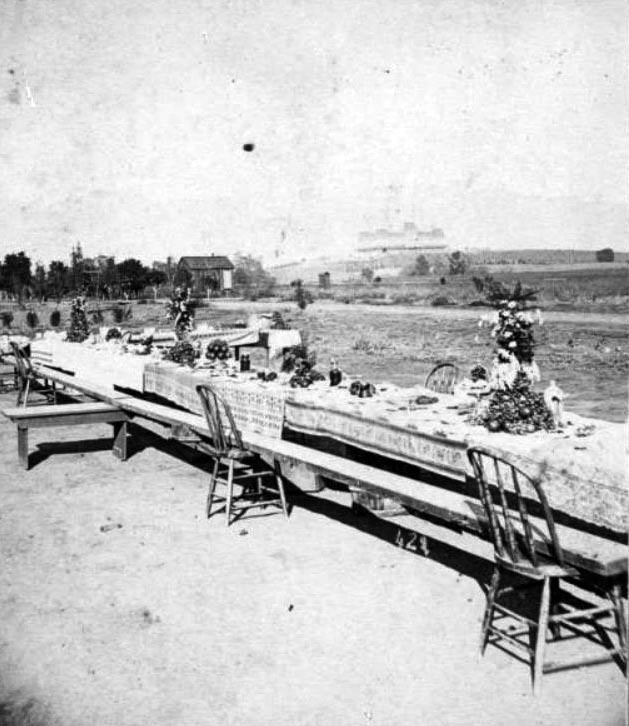 1890)#* - View looking north showing a long picnic table set with decorative centerpieces and tablecloths in a field in South Pasadena, with the Raymond Hotel visible in the distance. 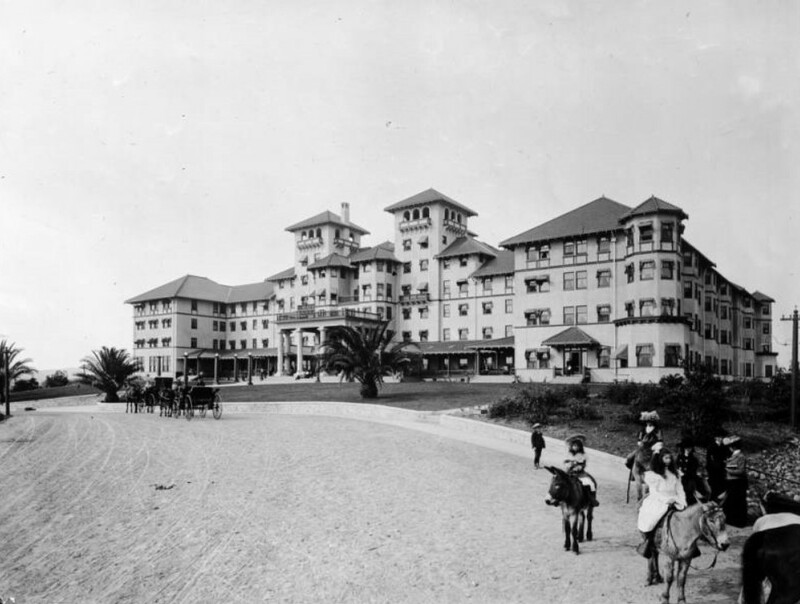 The first Raymond Hotel was built in 1886 and burned down in 1895. A second Raymond Hotel would be built. It opened in 1901. (ca. 1890)^## – View looking southwest from the Raymond Hotel. (ca. 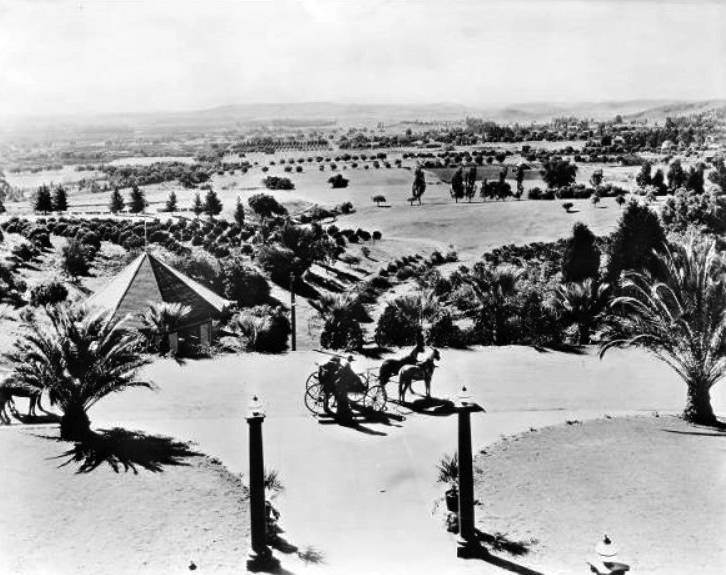 1890s)* - View of orange groves looking west from the Raymond Hotel. (ca. 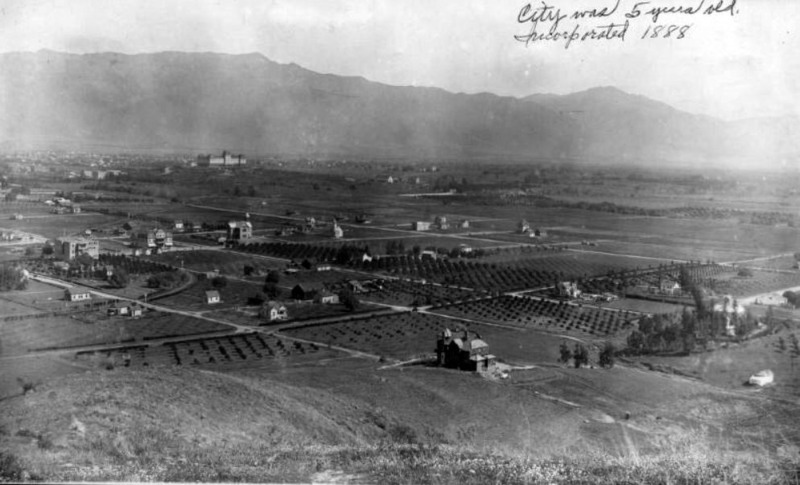 1890)* - View taken from the Raymond Hotel in Pasadena shows residential homes and cultivated land. Snow on the Sierra Madre's can be seen in the background. 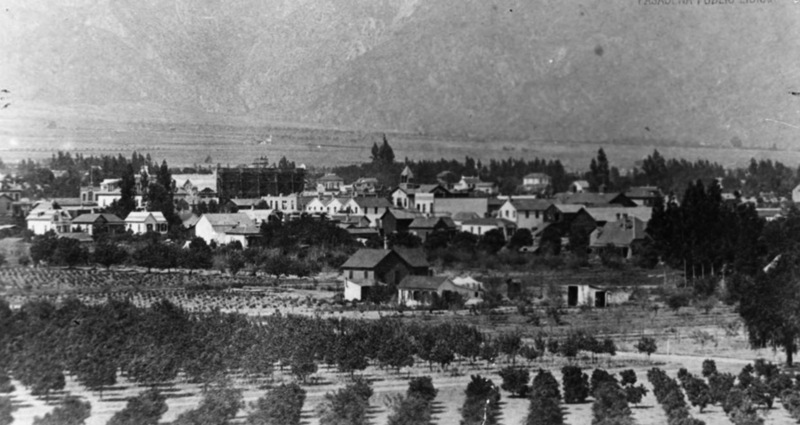 (1890)* - View of Pasadena residential area looking south from the M. E. Church. In the far distance can be seen the Raymond Hotel perched on Bacon Hill. (ca. 1890)* - Postcard view showing Pasadena and Mount Lowe taken from the Raymond Hotel. (ca. 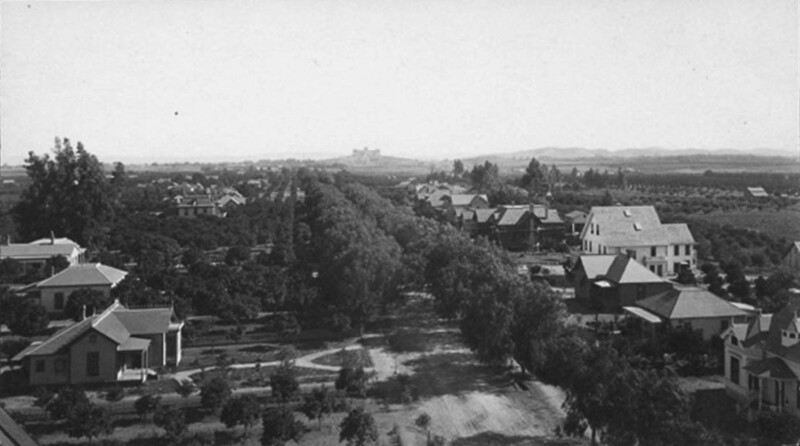 1893)^^ - Panoramic view of Pasadena, looking northeast from the La Pintoresca Hotel. Houses and trees are sparsely scattered across the landscape. Mt. Lowe and Echo Mountain are in the center of the range. (ca. 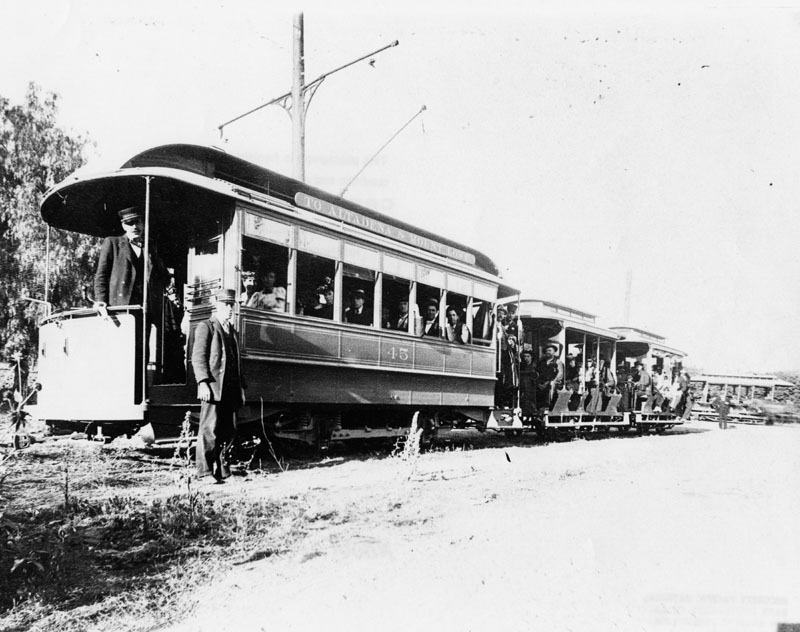 1890s)* - View of three streetcars full of travelers on their way to Altadena with continuing service to Mount Lowe, as indicated on the top car streetcar #45 on the left. Visiting Mount Lowe in the San Gabriel Mountains was a "must" for the local inhabitants as well as tourists. 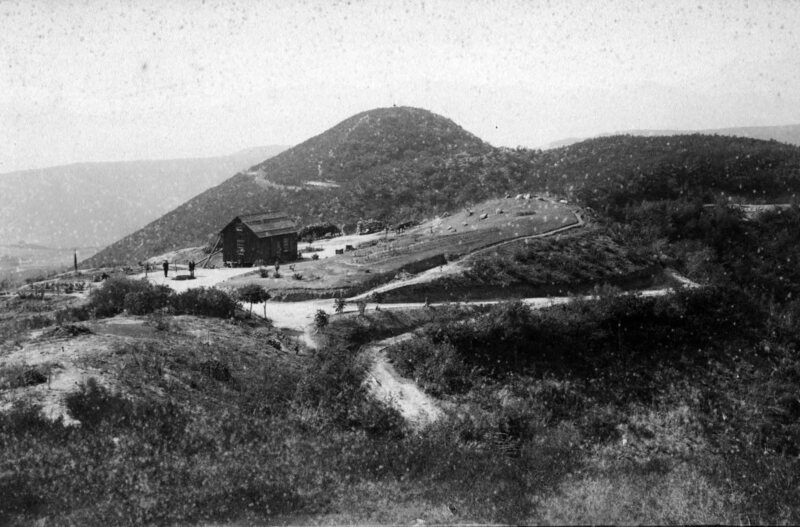 The journey started at Mountain Junction in Altadena, moved by electric car (such as shown here) to Rubio Pavilion, the bottom terminus of the Cable Incline Railway. This photograph was taken at Lake Avenue and Mariposa in Altadena. (ca. 1890)^#^^ – View showing eight men posing in front of the Santa Fe Railroad Station in South Pasadena. (ca. 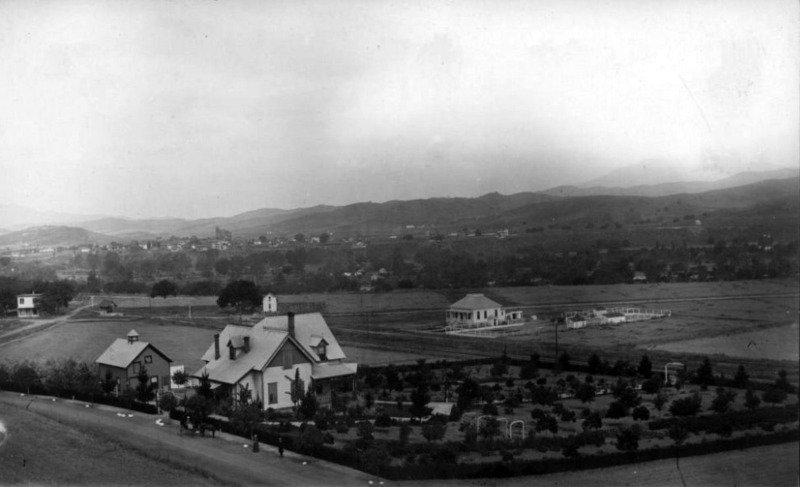 1890)^#^^ – Panoramic view of South Pasadena showing houses and farms. (ca. 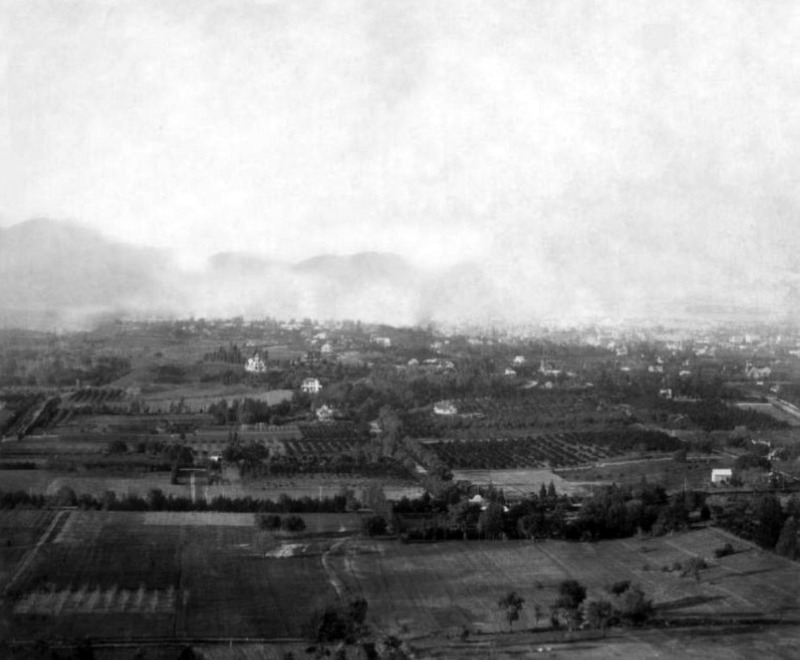 1893)^#^^ – View of South Pasadena from the Monterey Hills. The Raymond Hotel can be seen on top of Bacon Hill. In the background and beyond is the City of Pasadena and the San Grabriel Mountains. 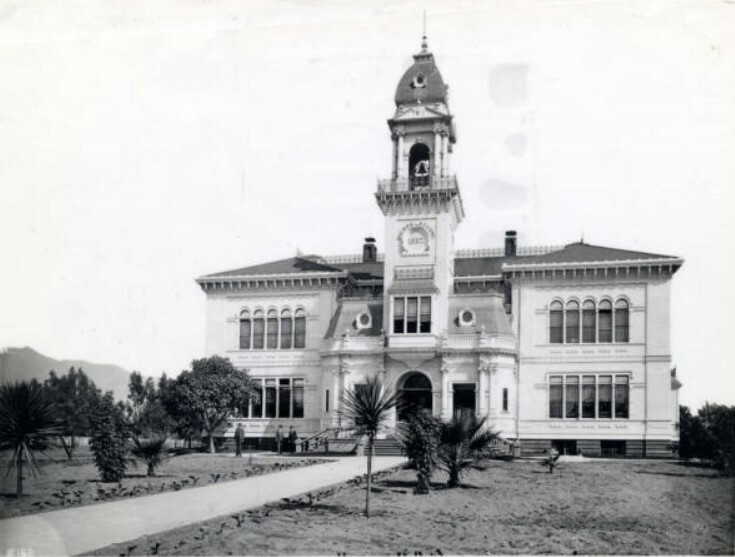 On March 2, 1888, the city of South Pasadena was incorporated with a population slightly over 500 residents, becoming the sixth municipality in Los Angeles County. It was chartered with roughly the same area as the current South Pasadena, about 3.42 square miles. 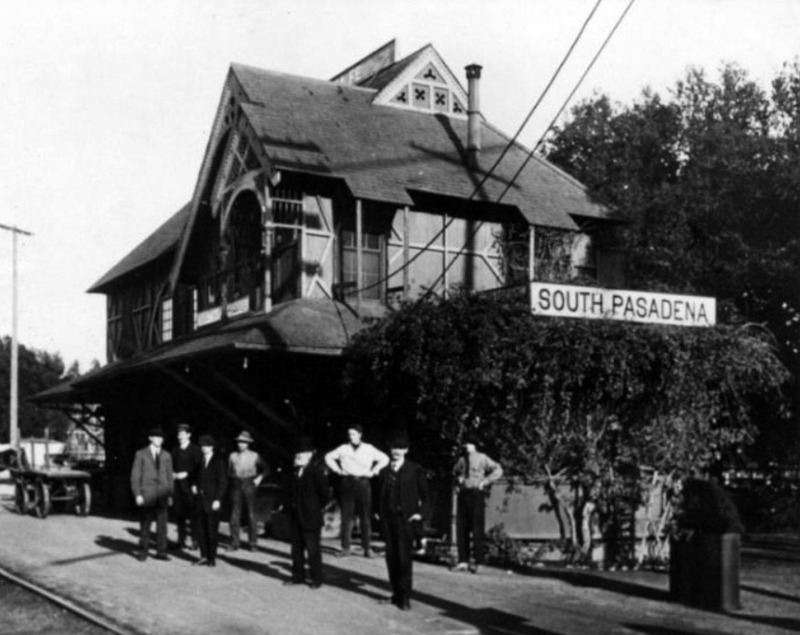 With completion of the Pacific Electric Short Line, putting the entire city within easy walking distance of the “red car” stations, South Pasadena also became a one of the first suburbs of Los Angeles. 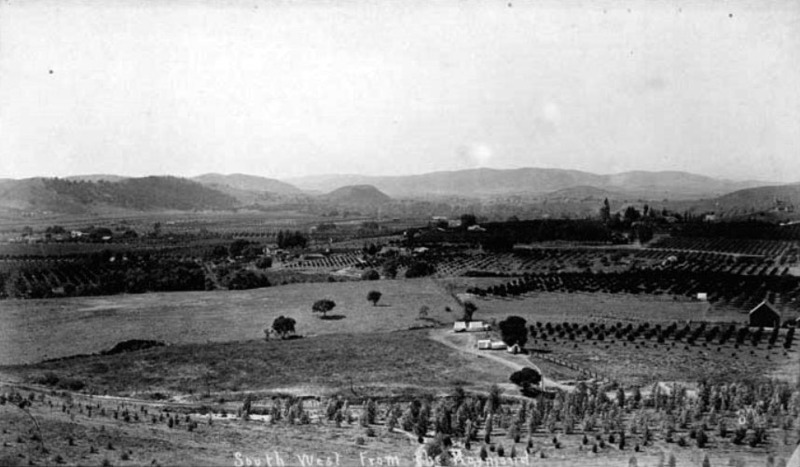 (1895)^#^^ – View of South Pasadena from the Monterey Hills showing the rich farmland. 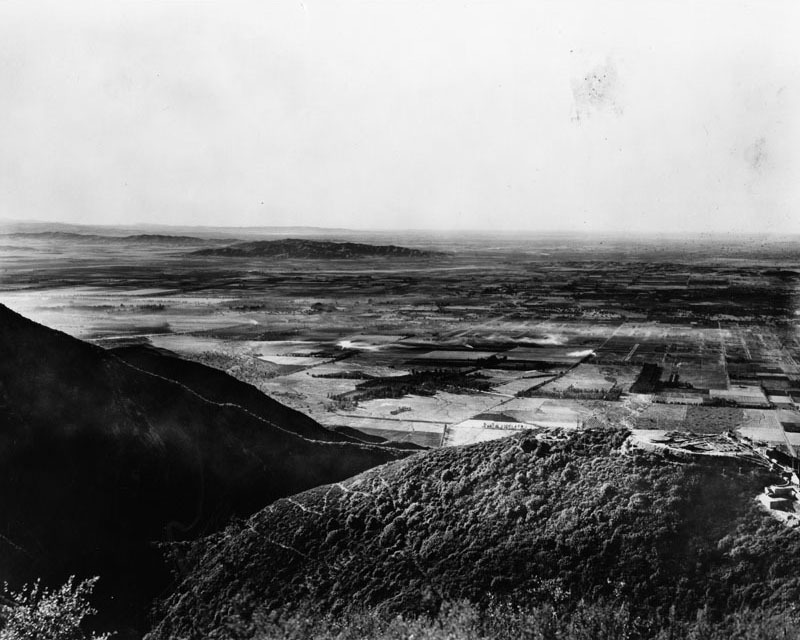 (1895)^#^^ – View of South Pasadena from the Monterey Hills. In the distance can be seen the Rayomond Hotel, the City of Pasadena, and the majestic San Gabriel Mountains. (ca. 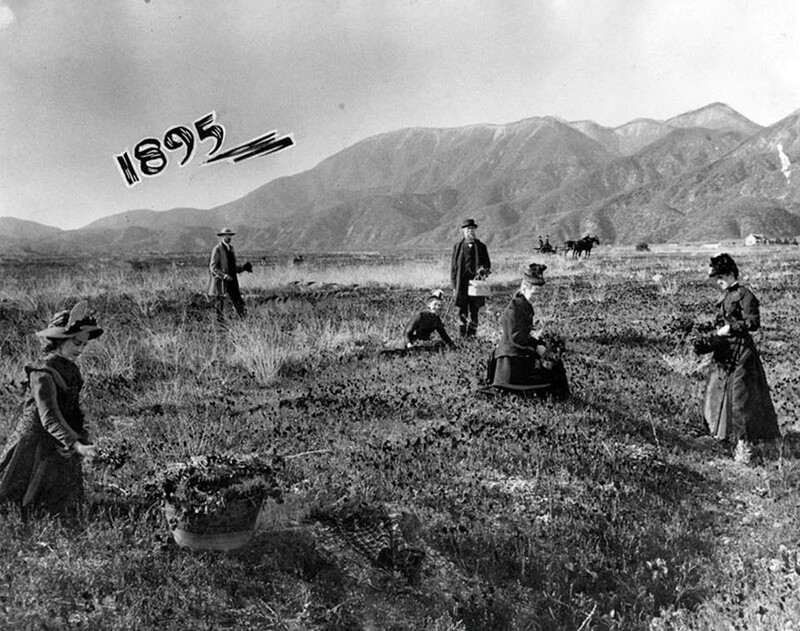 1895)* - A group of people picking California poppies growing naturally near north Lake Avenue in Altadena. The Mount Lowe Railroad electric car is parked nearby, and the poles lead north to the end of Lake Avenue and turn right. 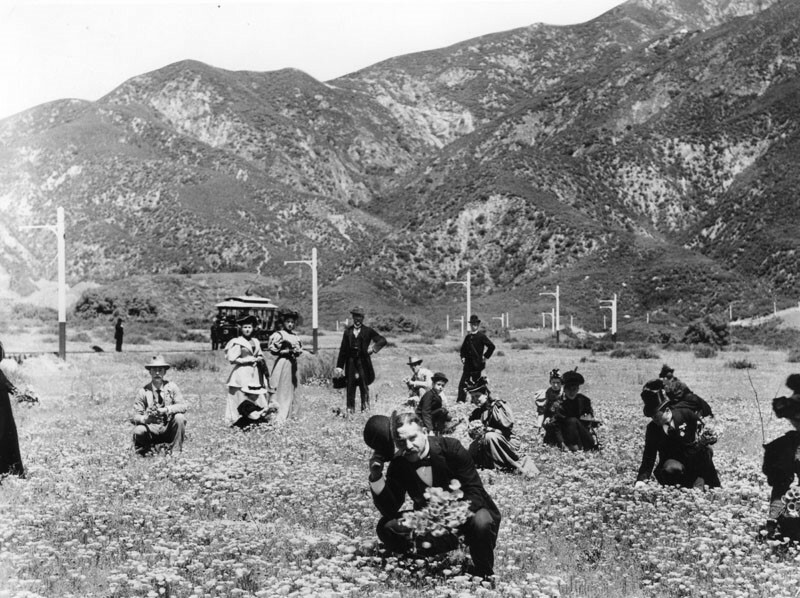 (1895)* - View showing a group of people picking flowers in a poppy field about the spot where Lake Avenue now meets Woodbury Road.